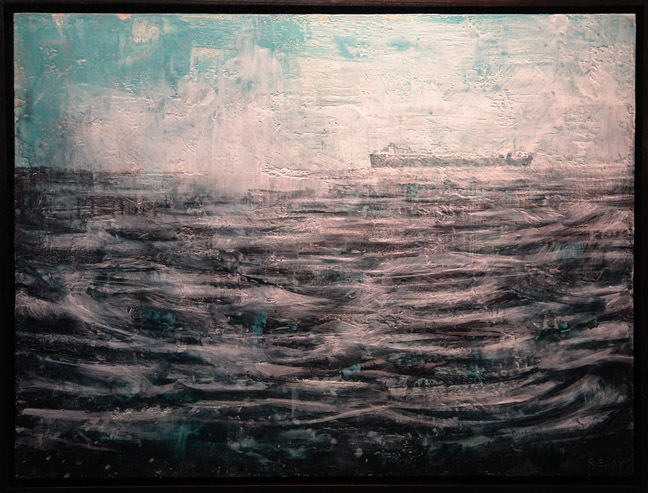 Rescued (2017) encaustic on panel, 48 x 36 in. 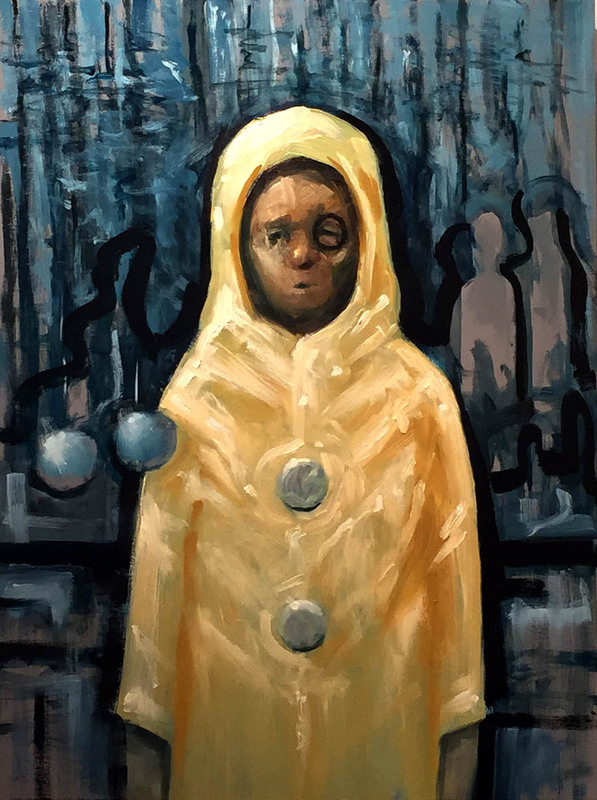 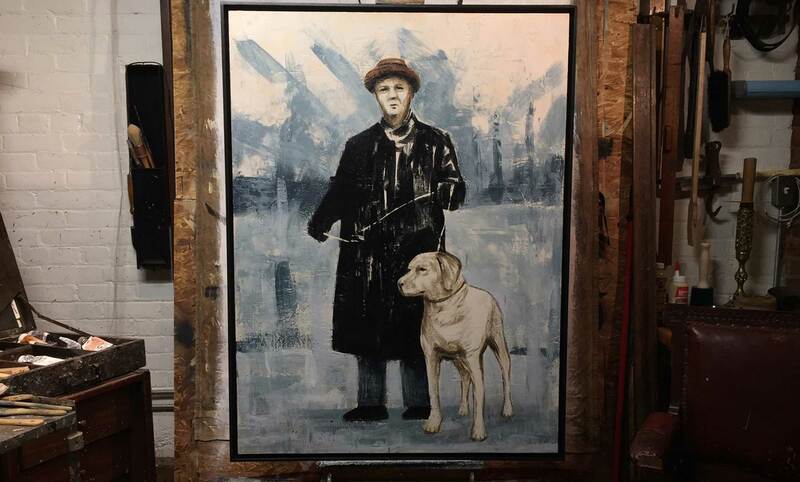 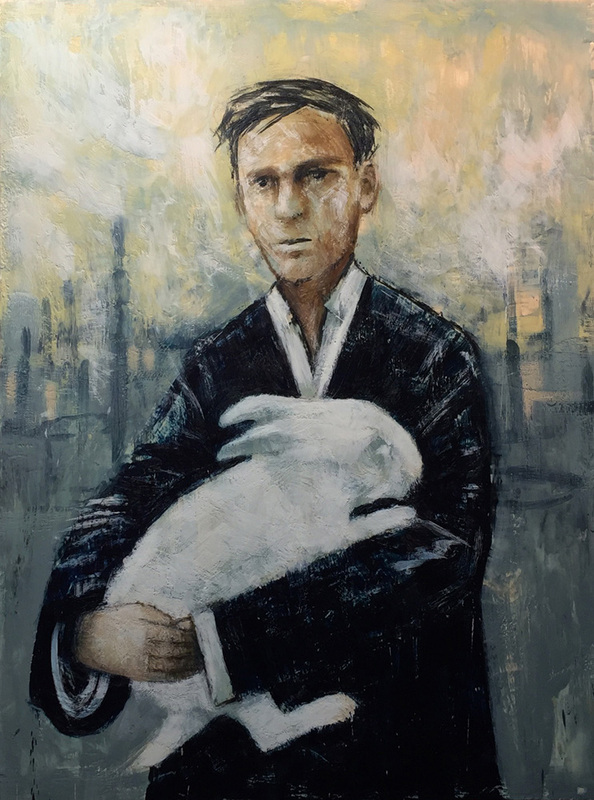 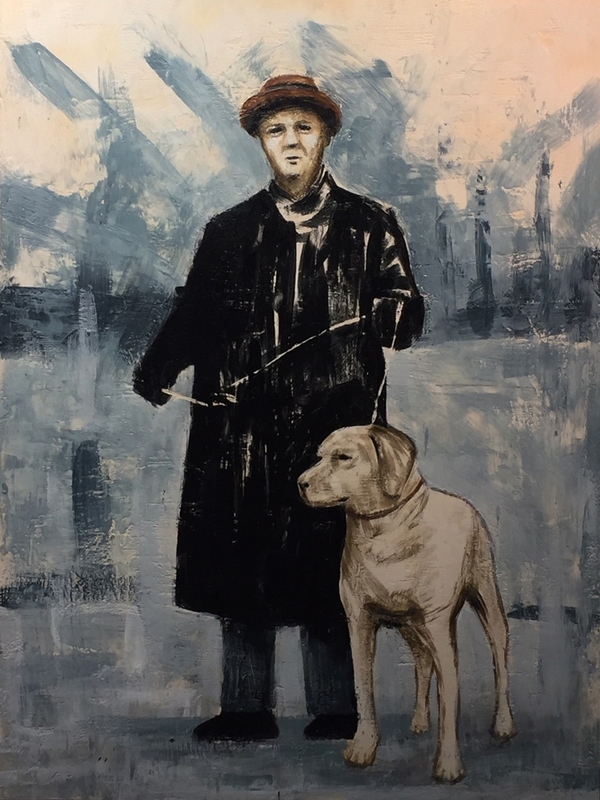 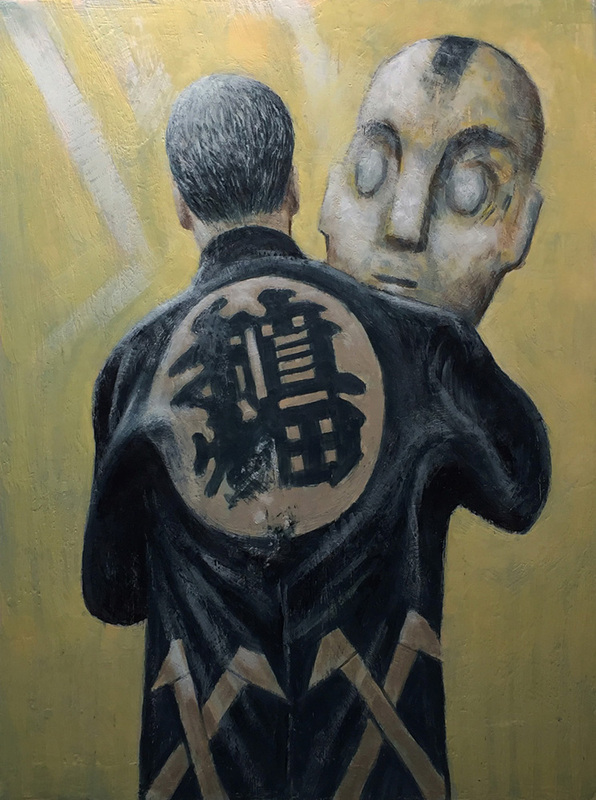 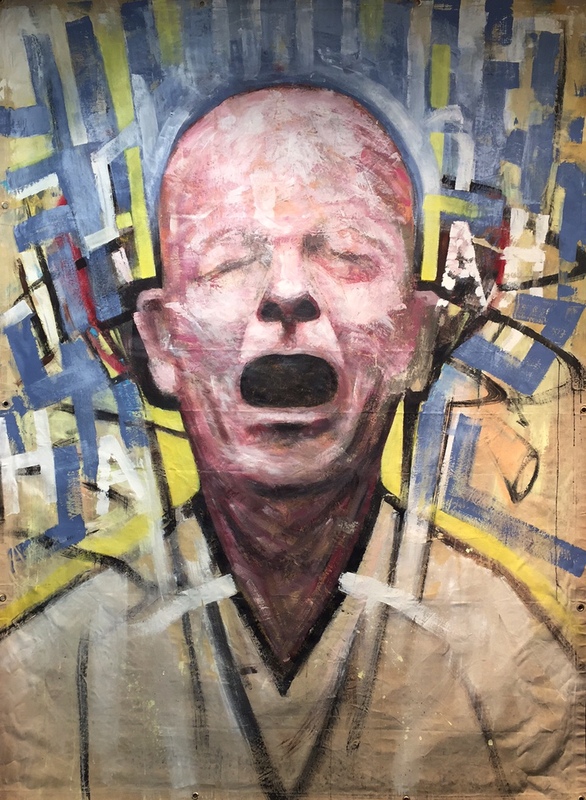 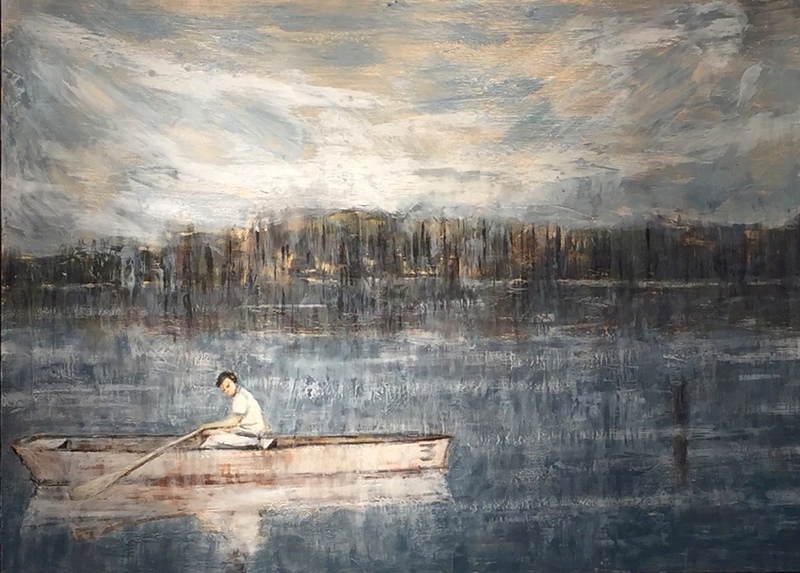 Saving Mr. See (2017) encaustic on panel, 48 x 36 in. 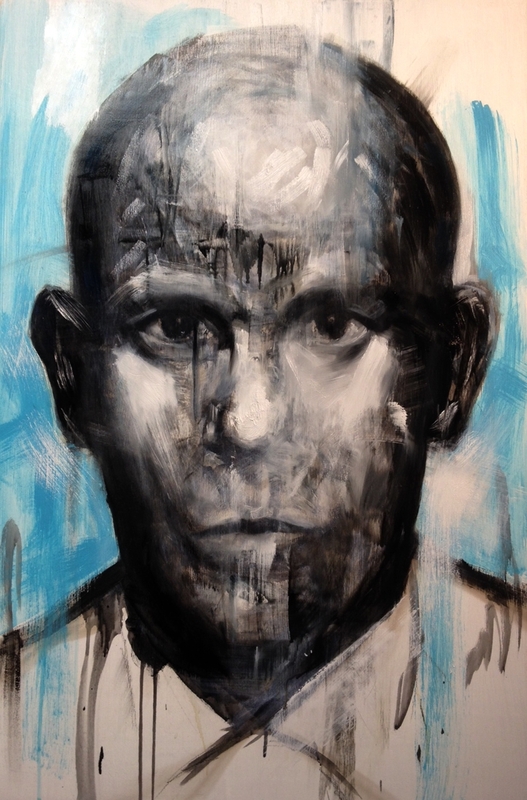 Mind over Malkovich, 2014, acrylic and oil on panel, 36 x 24 in. 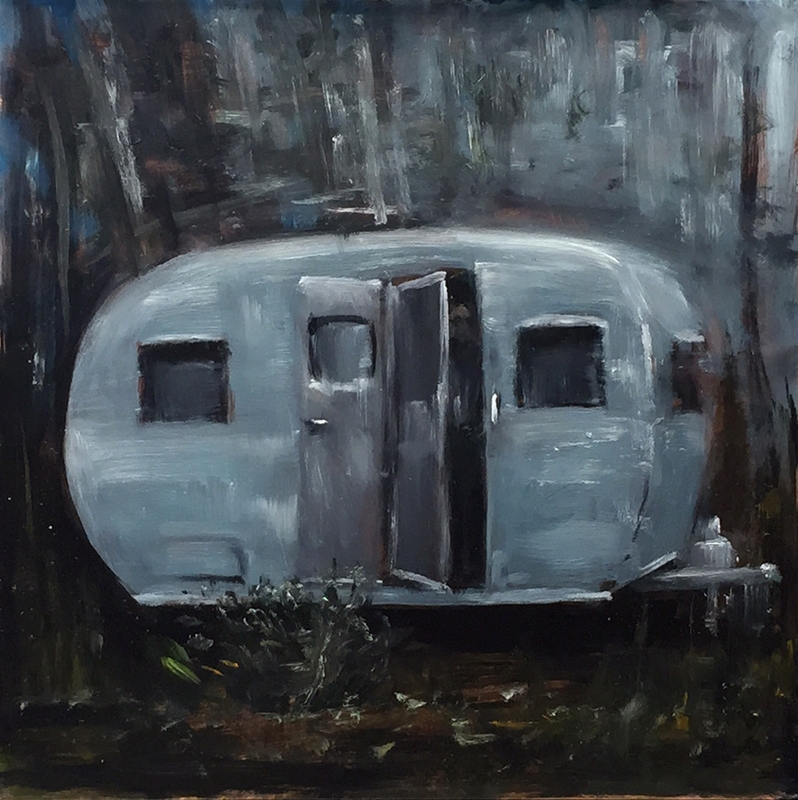 Untitled, 2016, oil, acrylic on canvas tarp, 65 x 50 in. 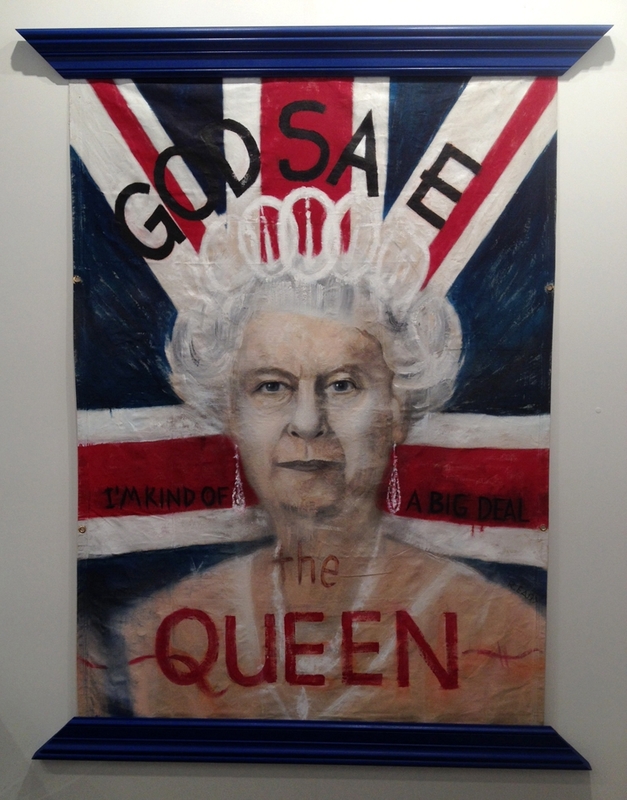 God Save the Queen, 2014, acrylic and spray paint on canvas tarp, 87 x 60 in. 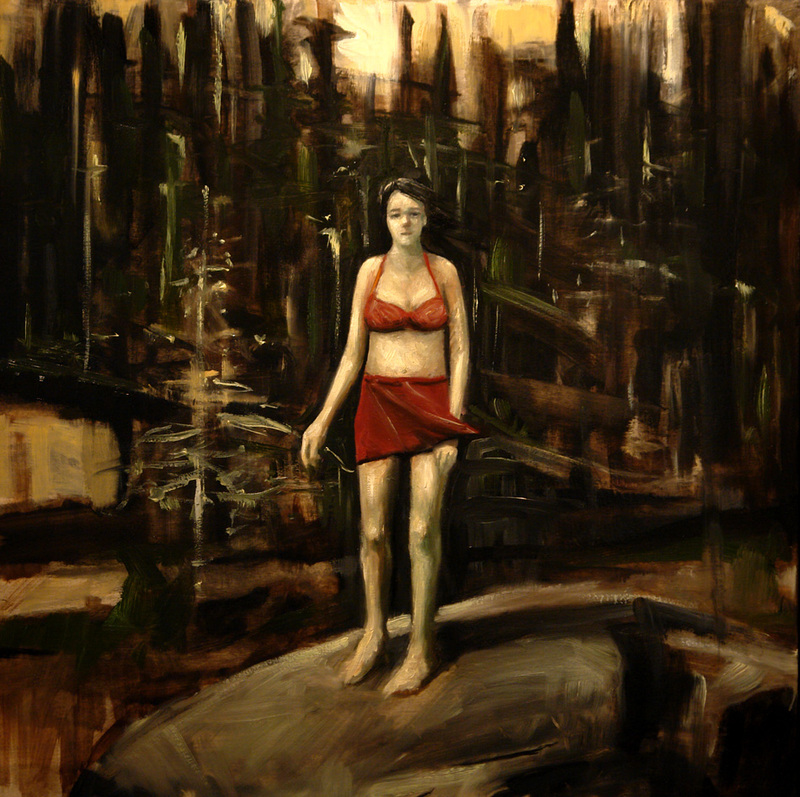 Celebration at Sid's, 2014, oil on canvas tarp, 80 x 65 in. 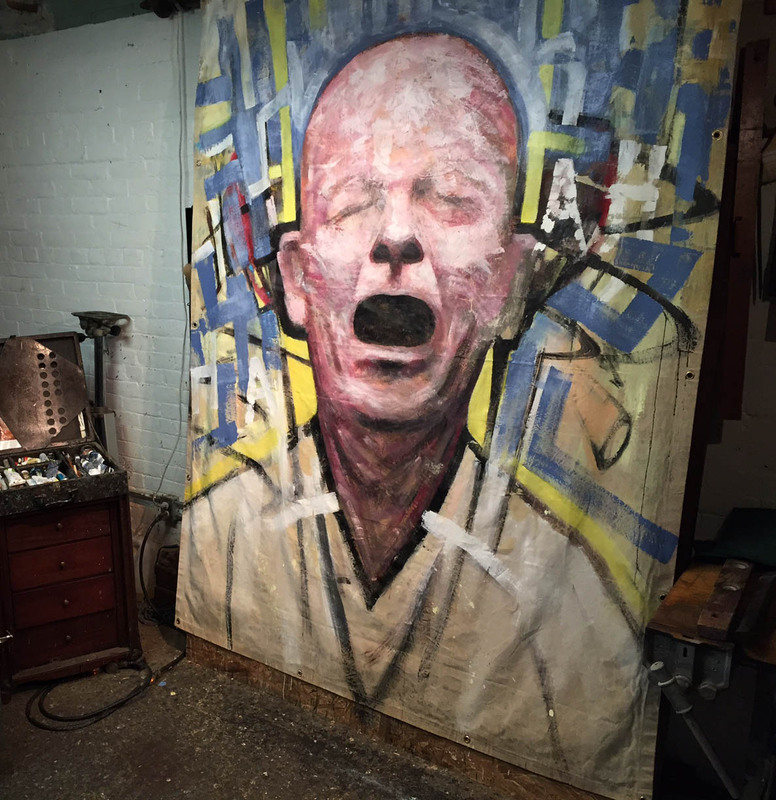 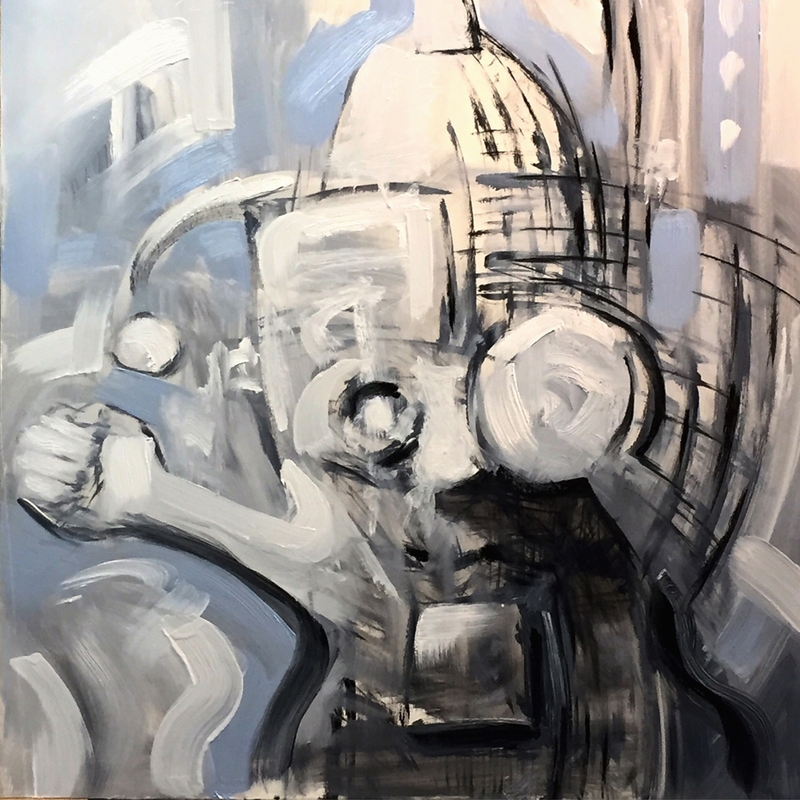 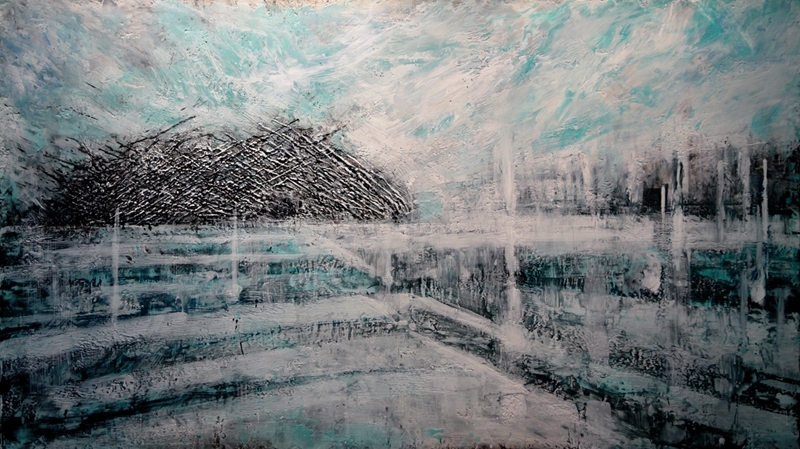 The Experience (2015) acrylic on canvas tarp, 90 x 69 in. 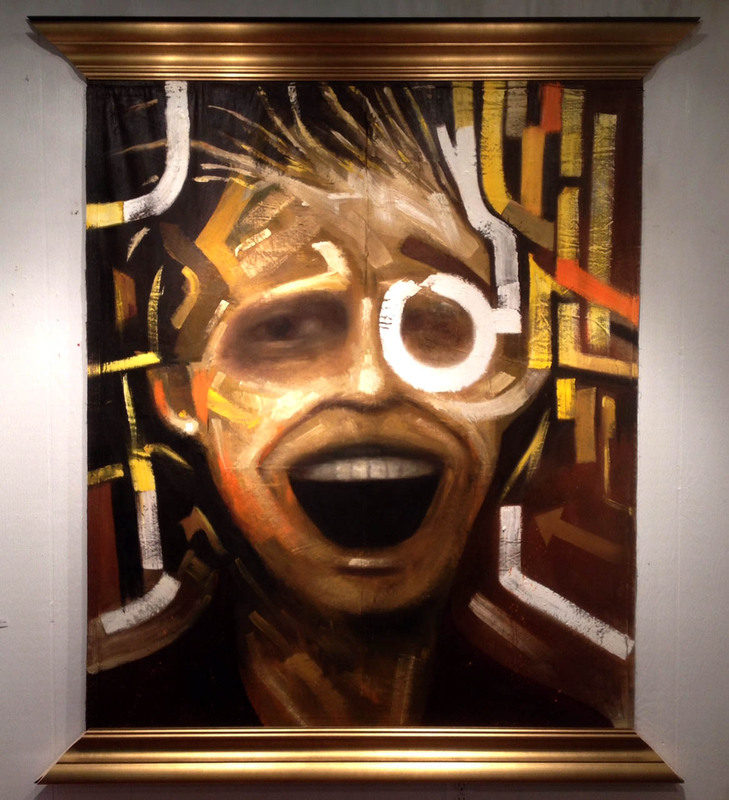 The Experience, acrylic on canvas tarp, 96 x 72 in. 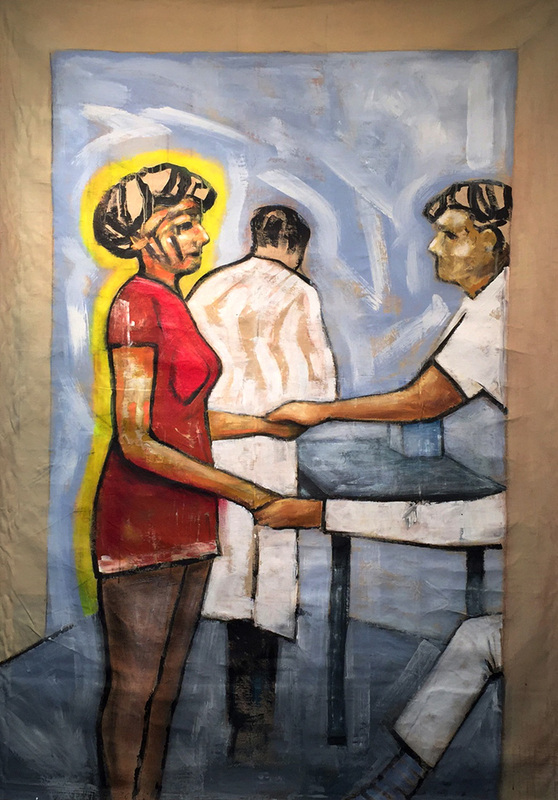 The Clinic (2016) acrylic on canvas tarp, 78 x 56 in. 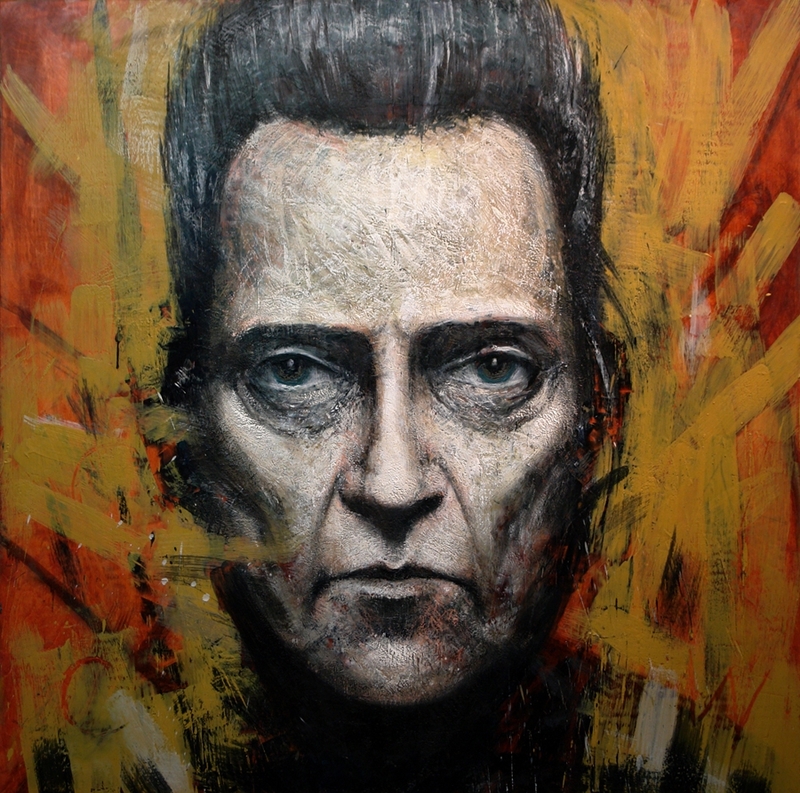 Fake King (2014) oil, acrylic on canvas tarp, 78 x 56 in. 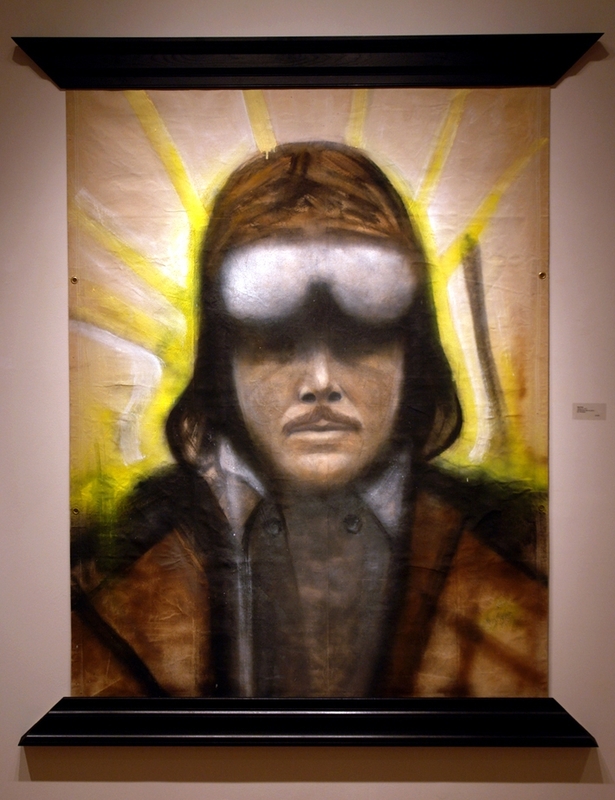 Flying Ace, 2014, oil and spray paint on canvas tarp, 87 x 60 in. 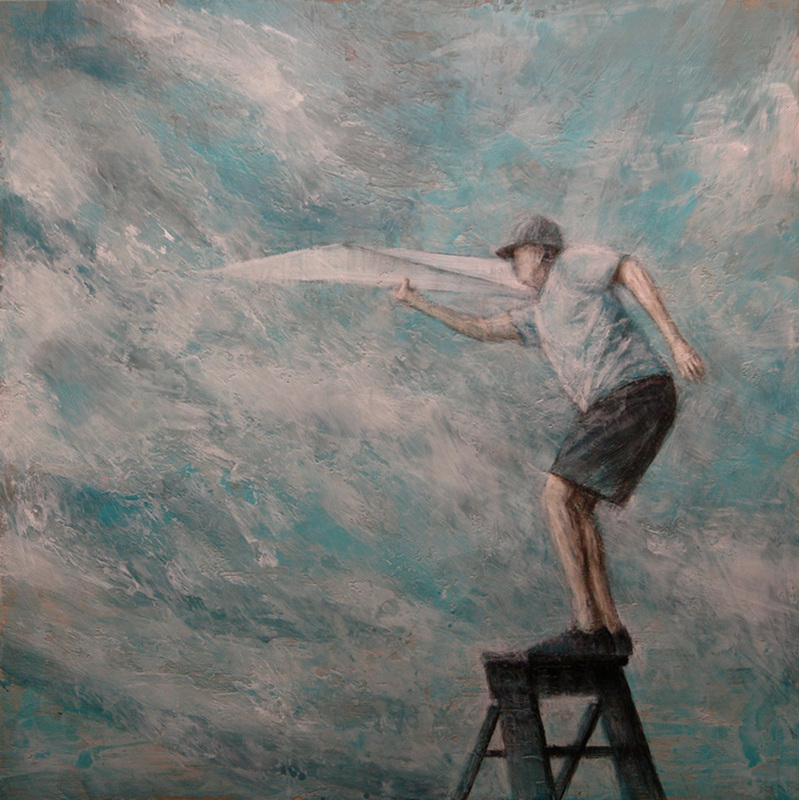 Grasp (2016) oil, acrylic on panel, 24 x 24 in. 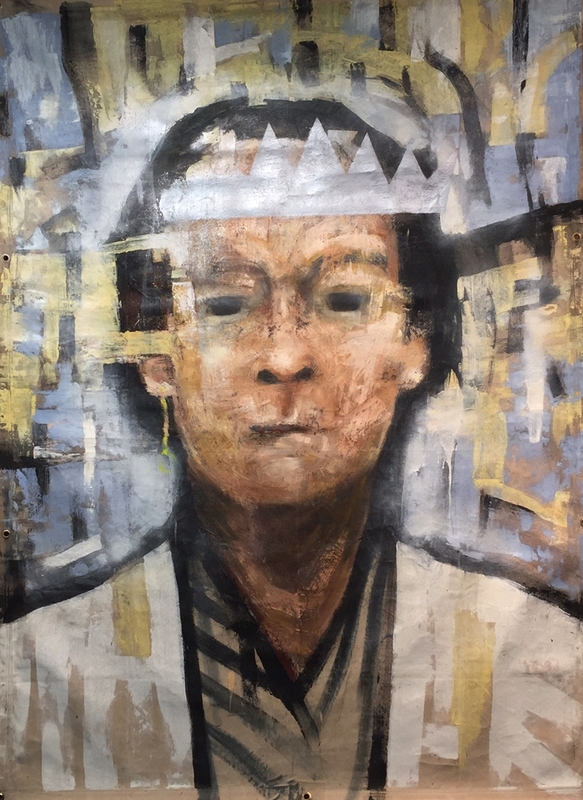 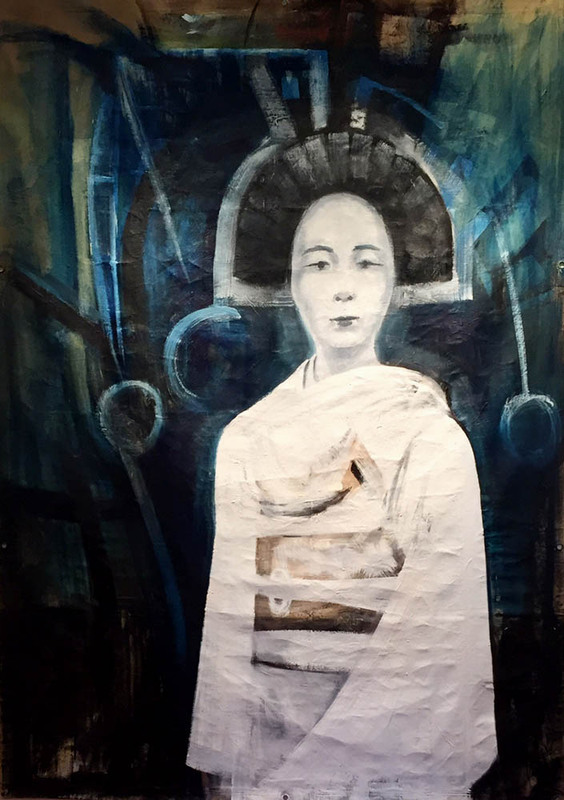 Geisha, 2016, oil, acrylic on canvas tarp, 84 x 60 in. 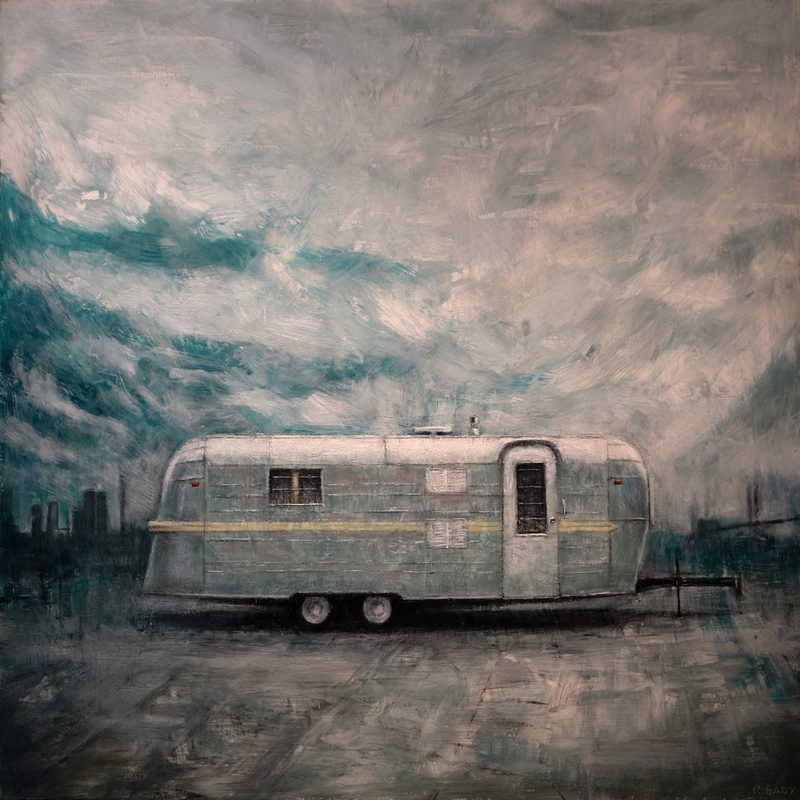 Making Stanley, 2015, oil, acrylic on panel, 24 x 24 in. 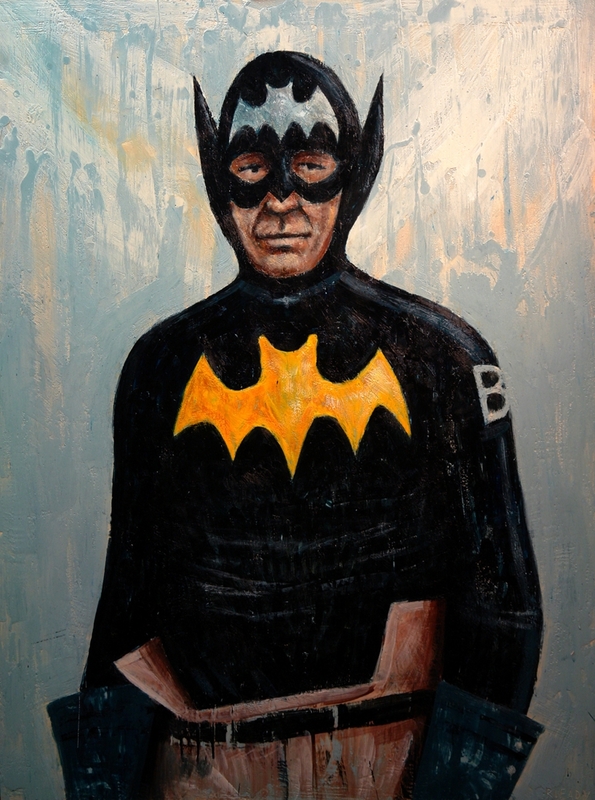 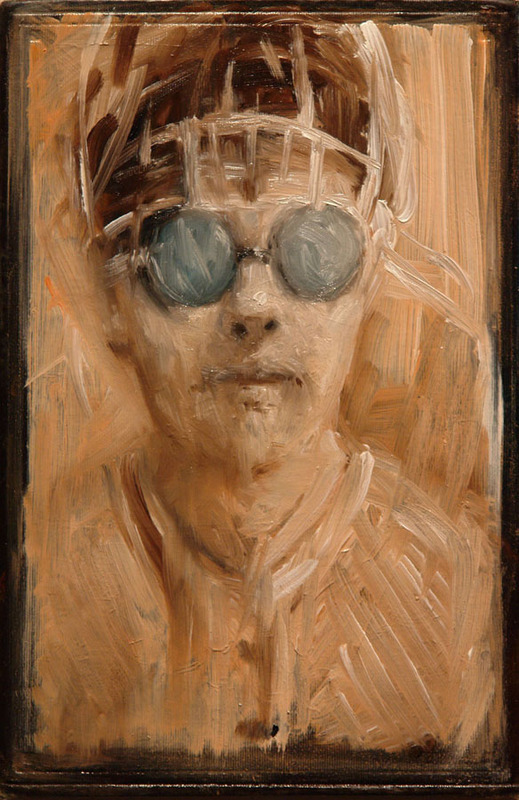 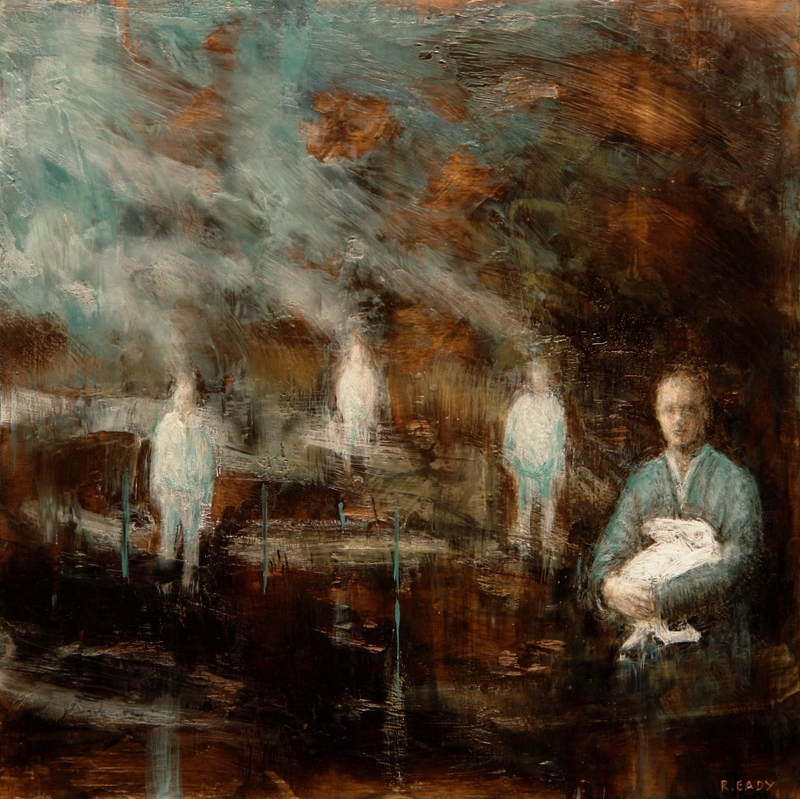 Imposter no.3, 2013, oil on copper, 16 x 16 in. 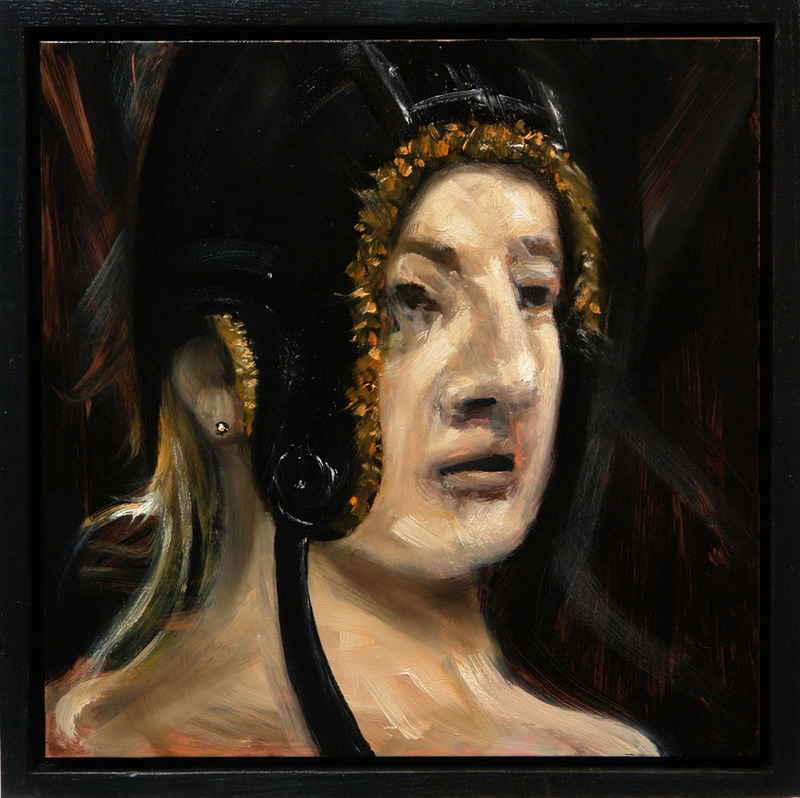 Golden Locks, 2013, oil on copper, 16 x 16 in. 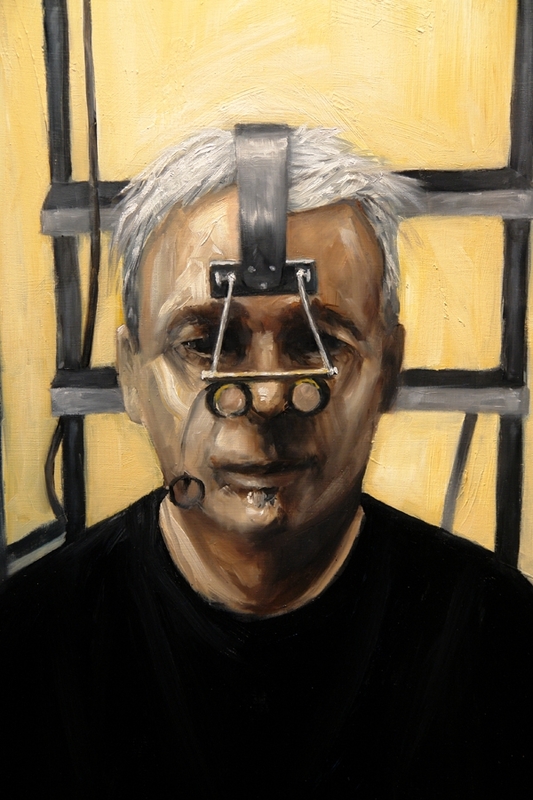 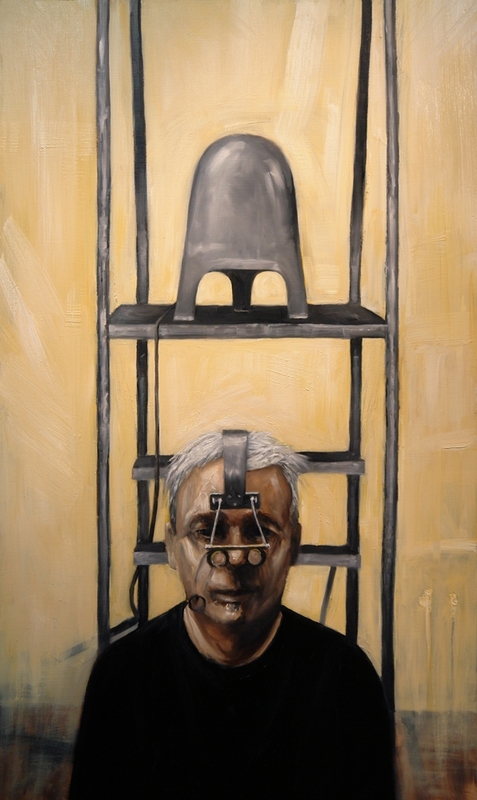 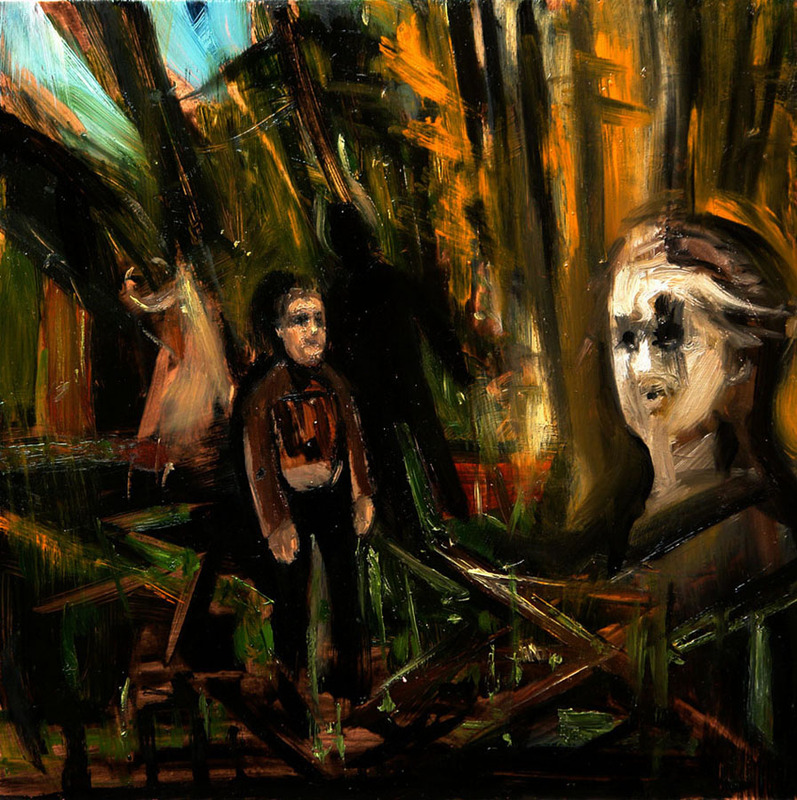 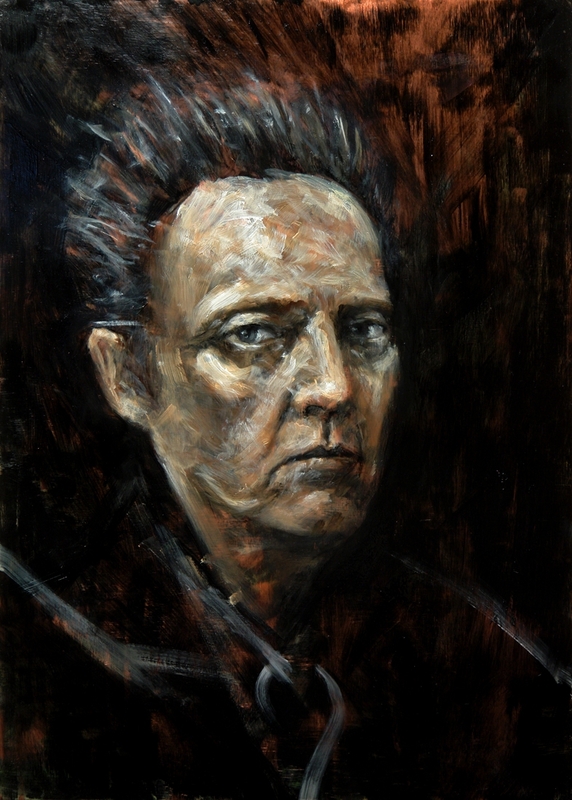 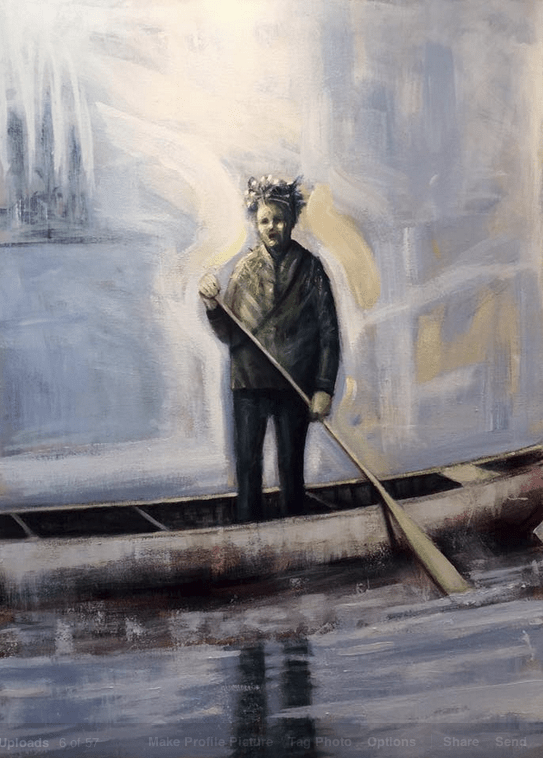 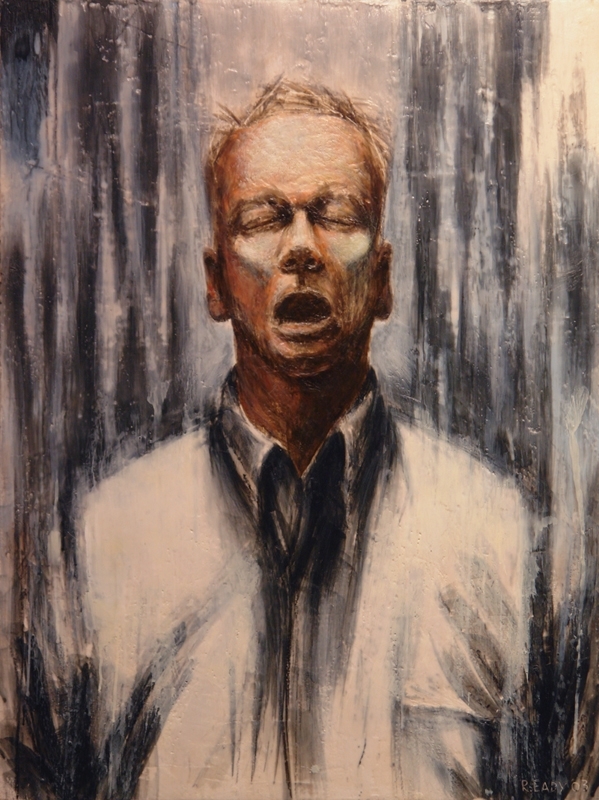 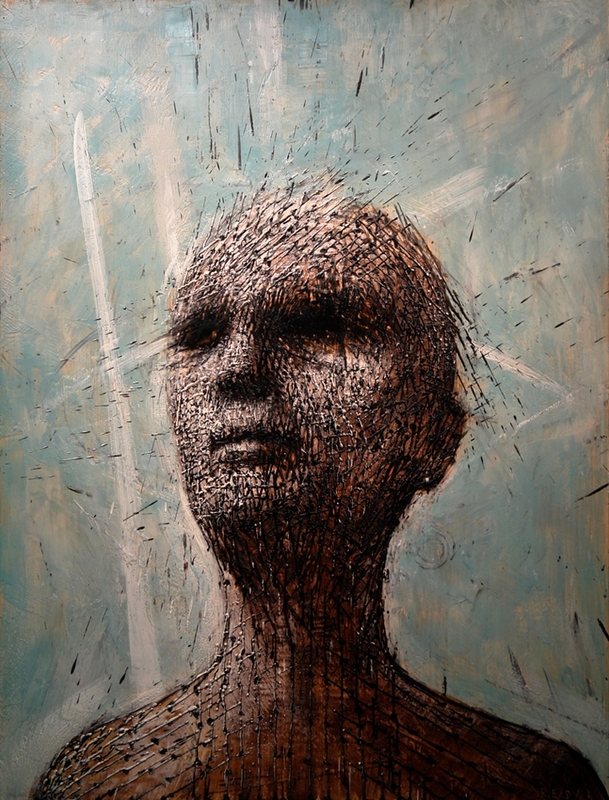 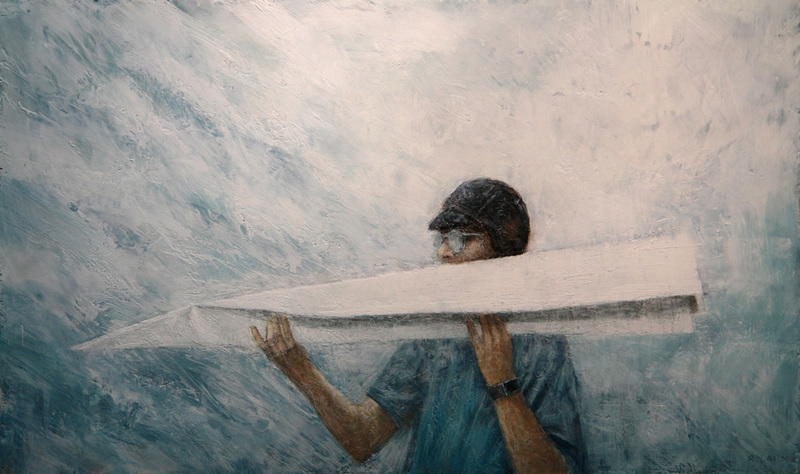 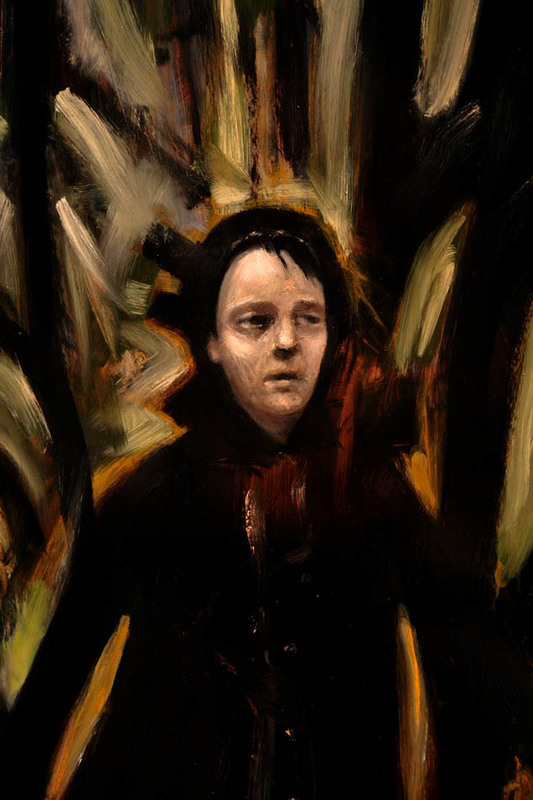 The Practitioner, 2012, oil on panel, 50 x 38 in. 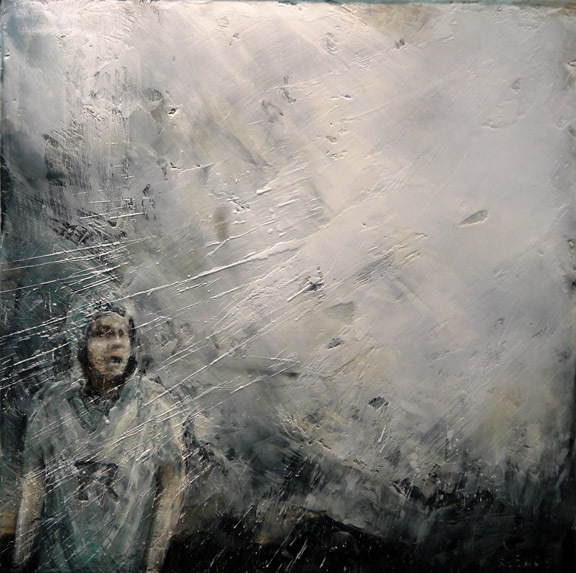 Anonym 1, 2016, encaustic on panel, 60 x 48 in. 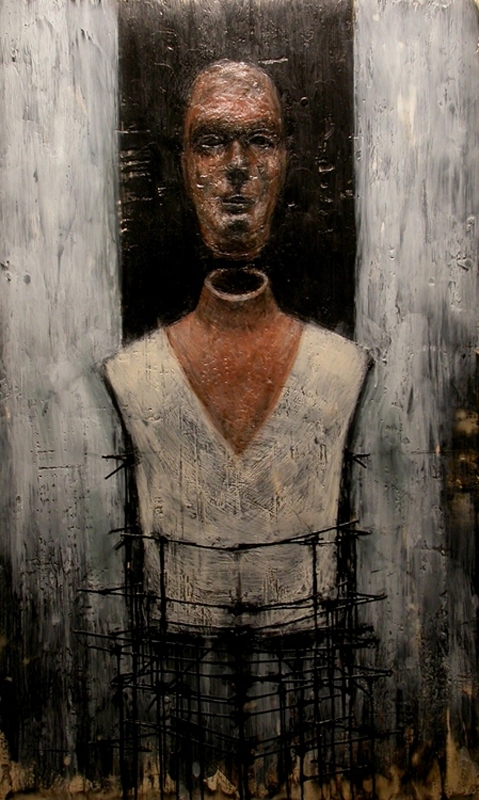 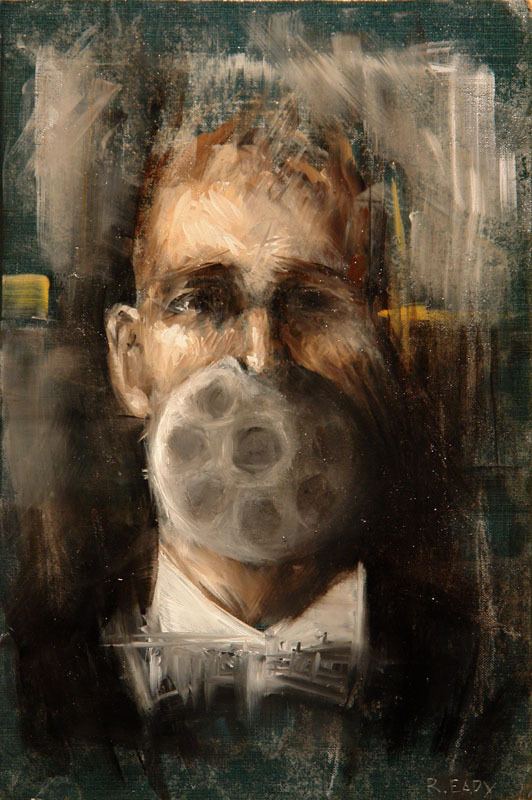 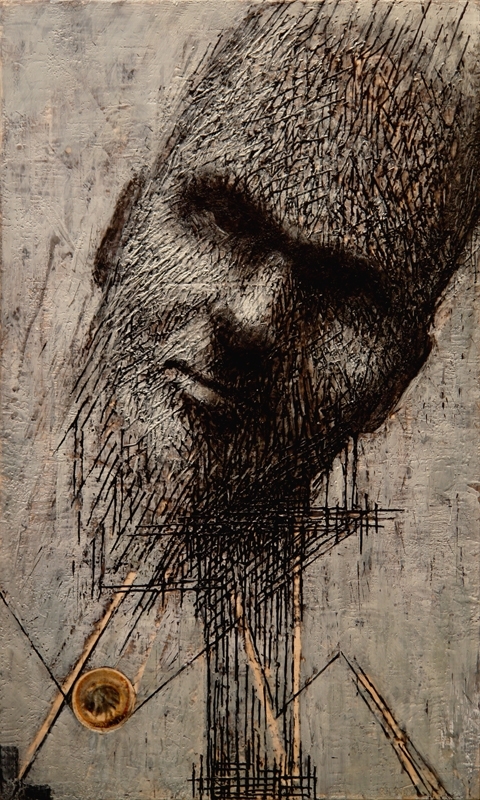 Overseer, 2012, encaustic on panel, 50 x 38 in. 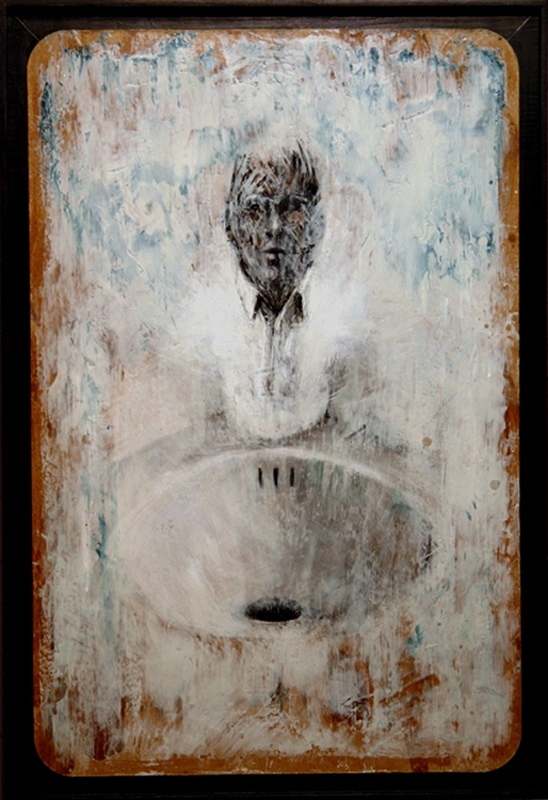 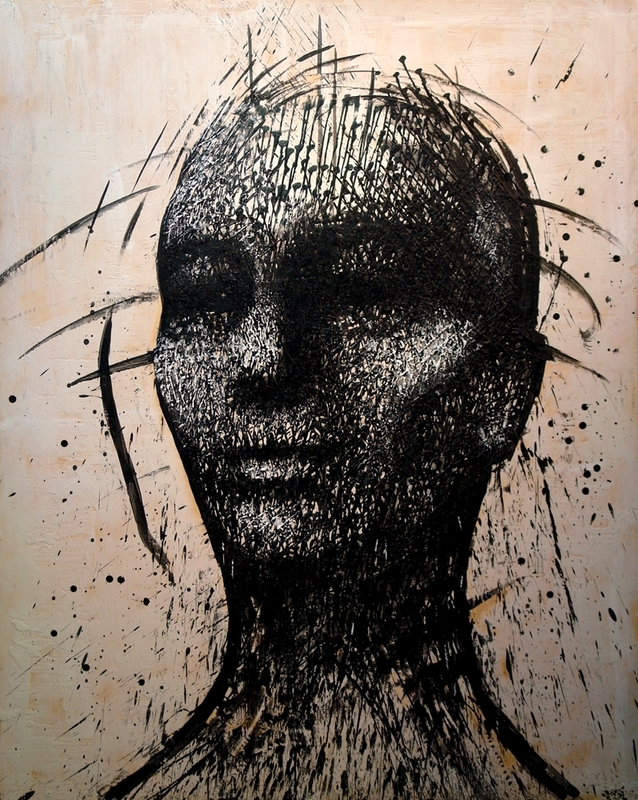 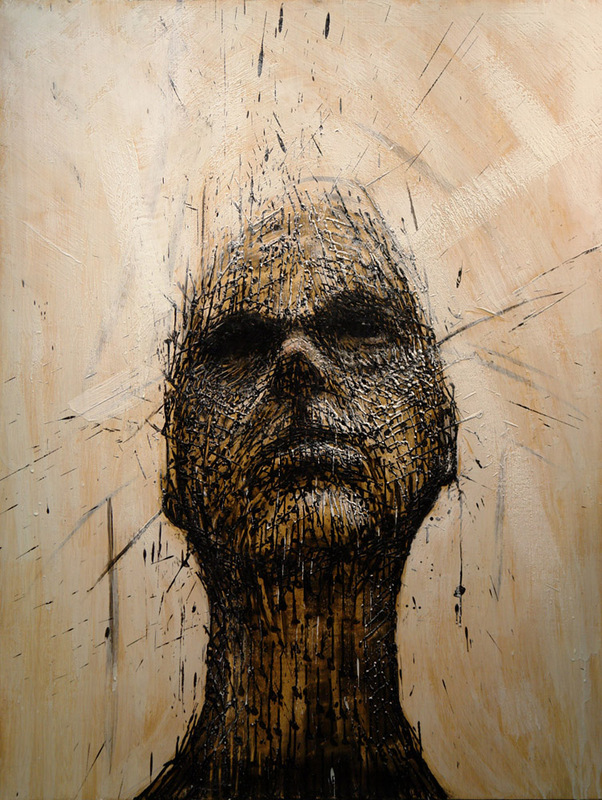 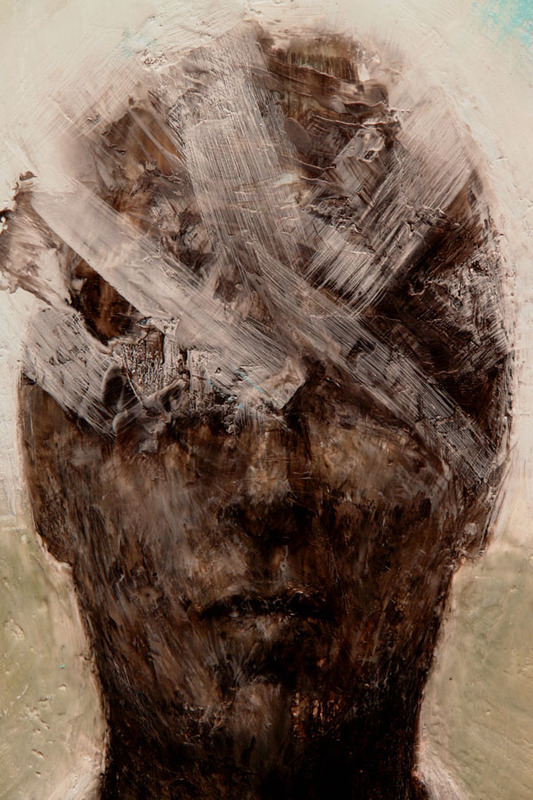 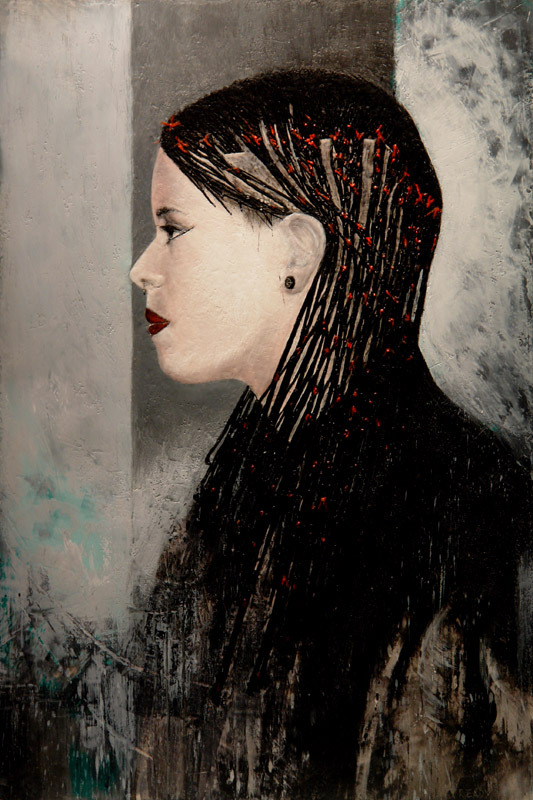 Kane, 2012, encaustic on panel, 50 x 36 in. 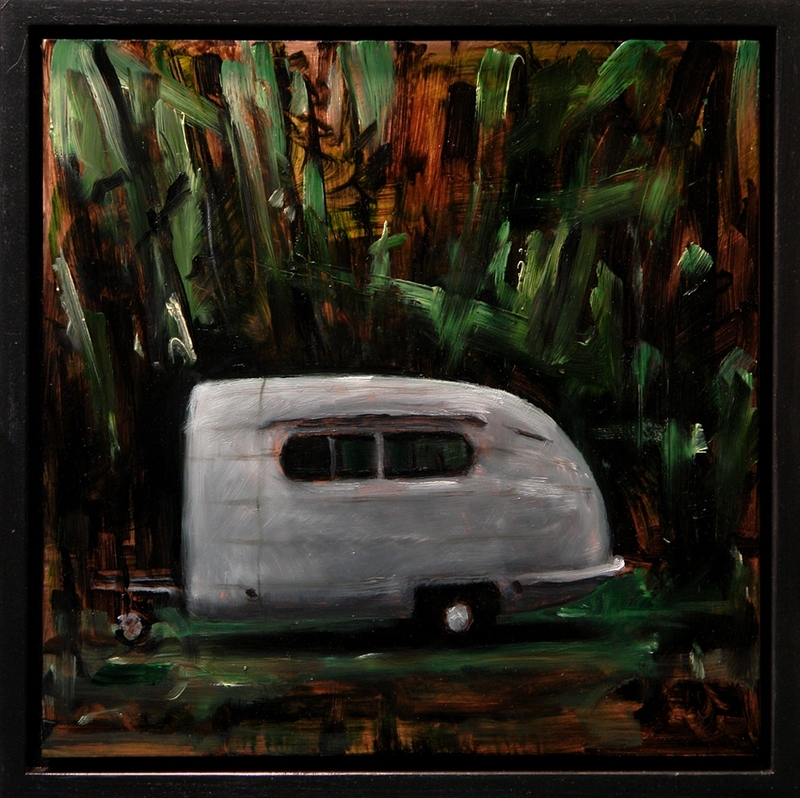 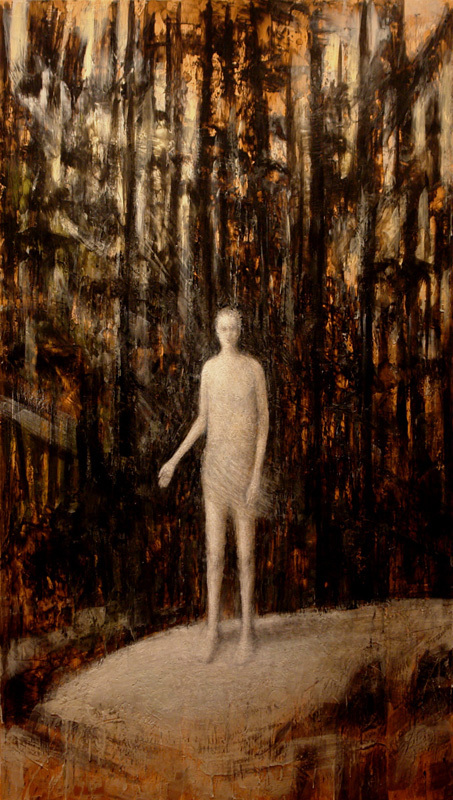 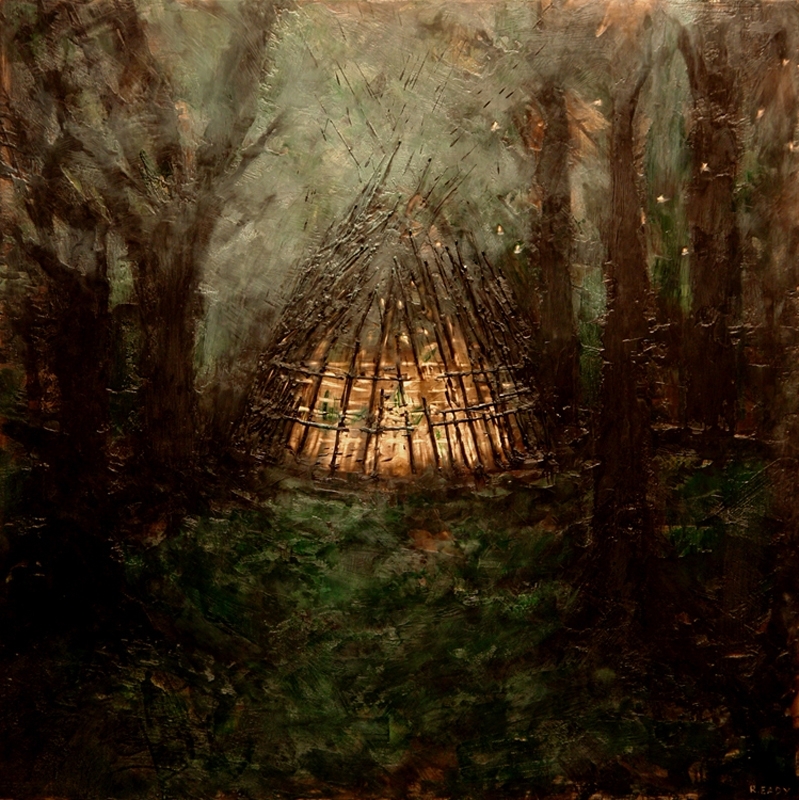 Lost in the Wood, 2012, encaustic on panel, 24 x 24 in. 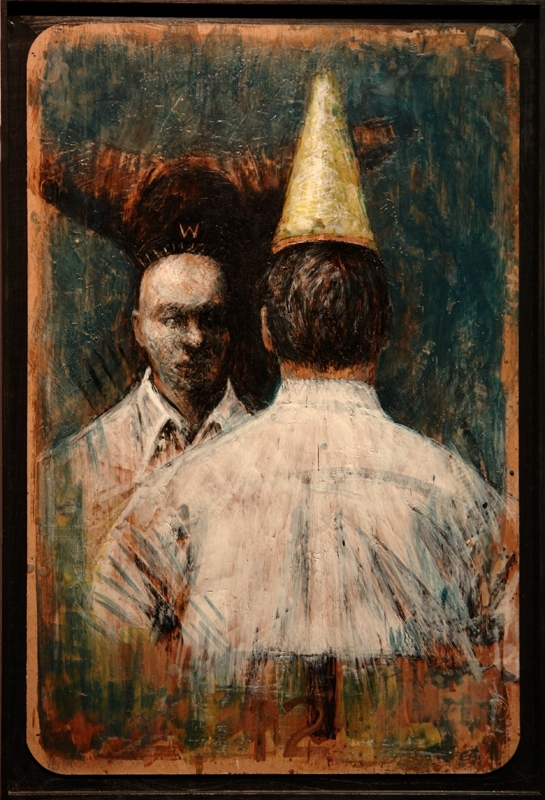 TelePathetic, 2011, oil on book cover, 7 x 10 in. 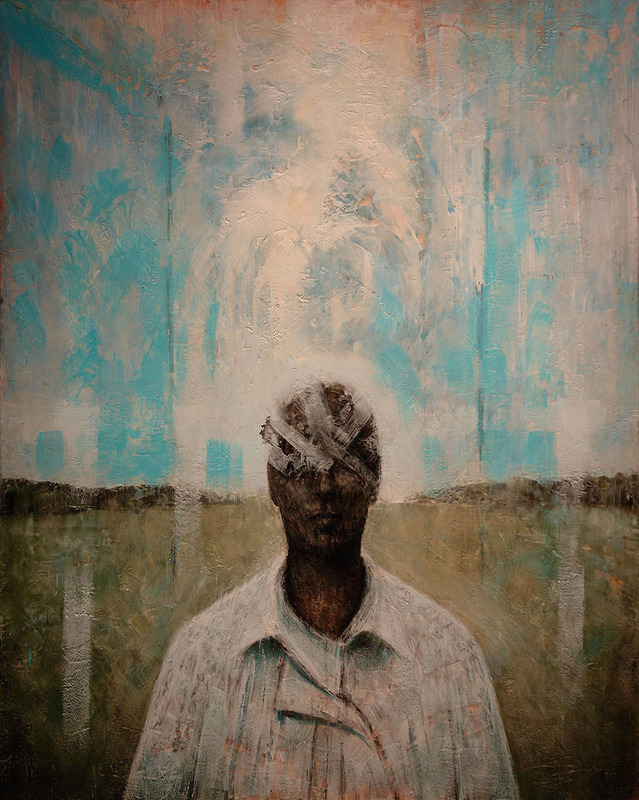 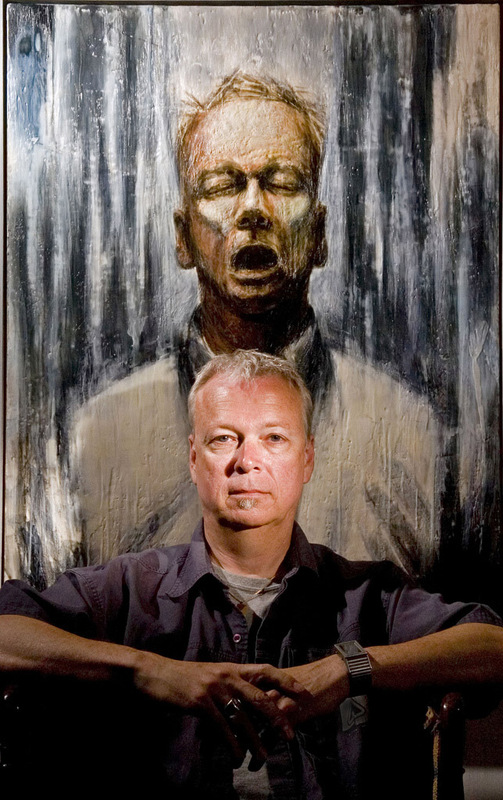 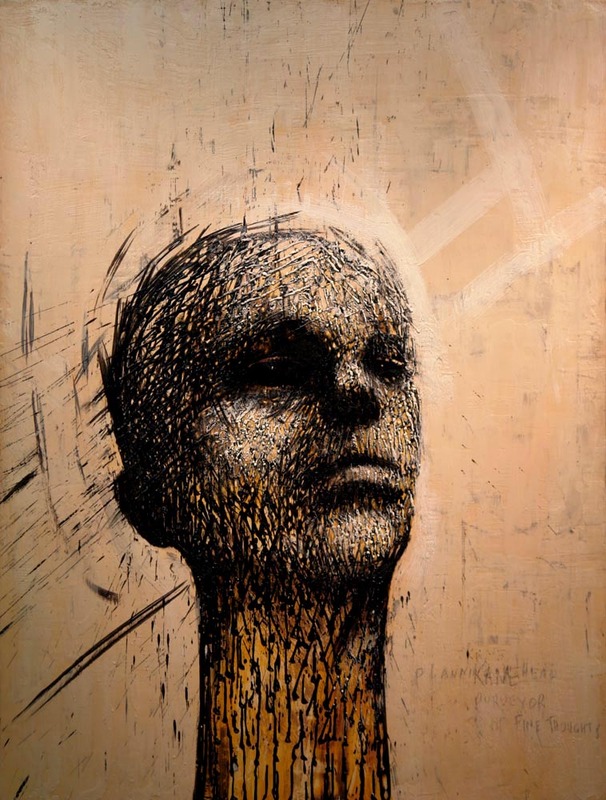 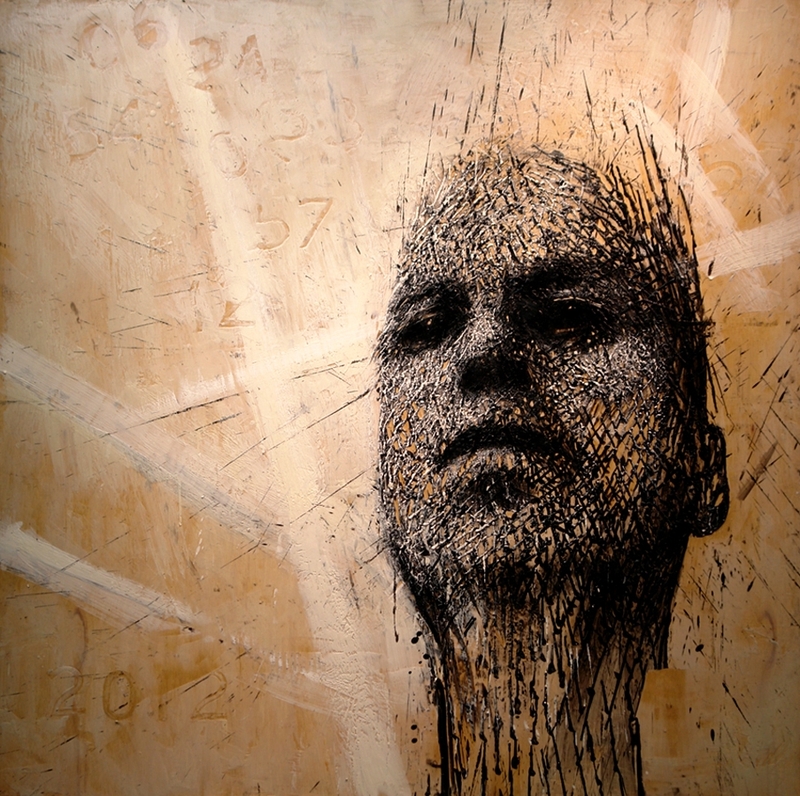 Mind Field, 2009, encaustic on canvas over panel, 60 x 48 in. 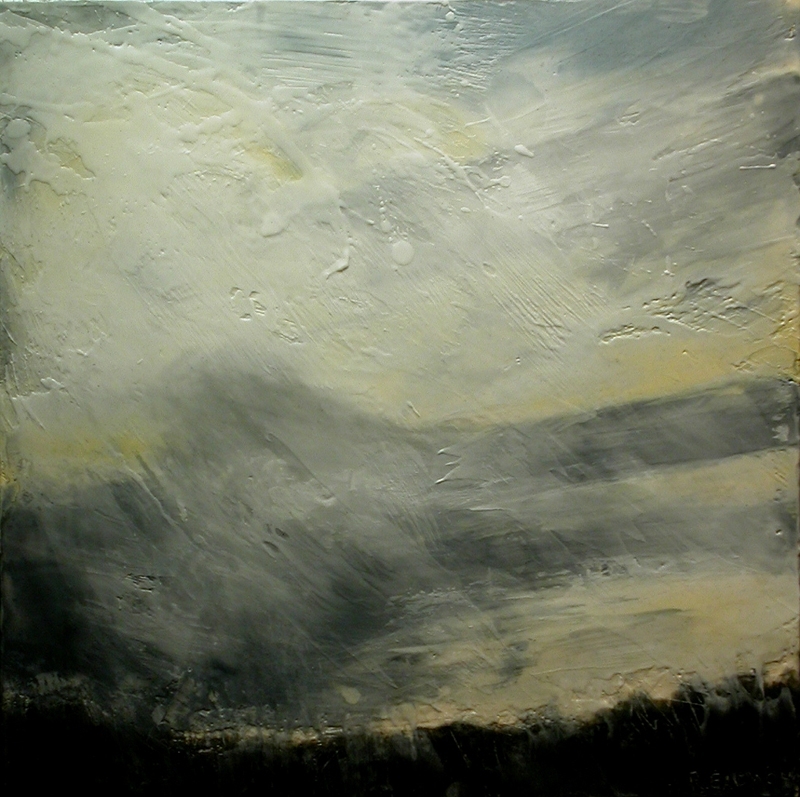 Branded no.7, encaustic on canvas, 20 x 20 in. 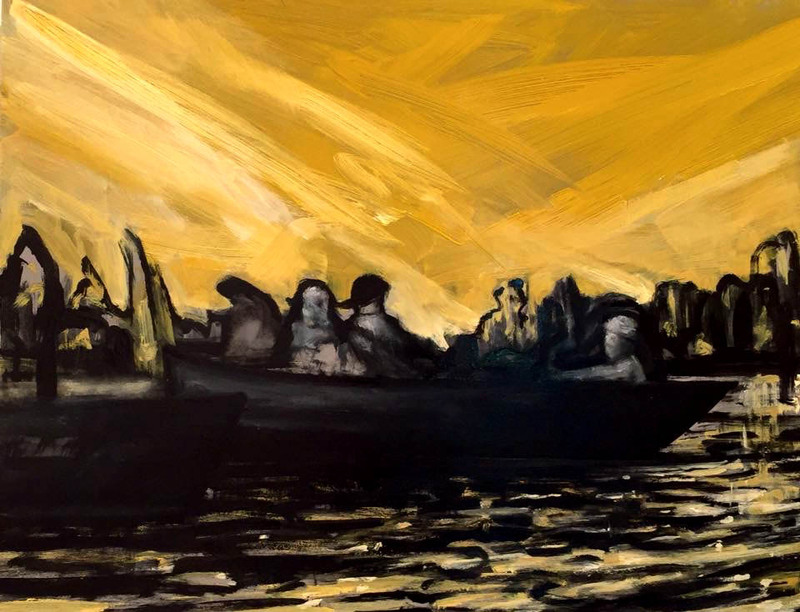 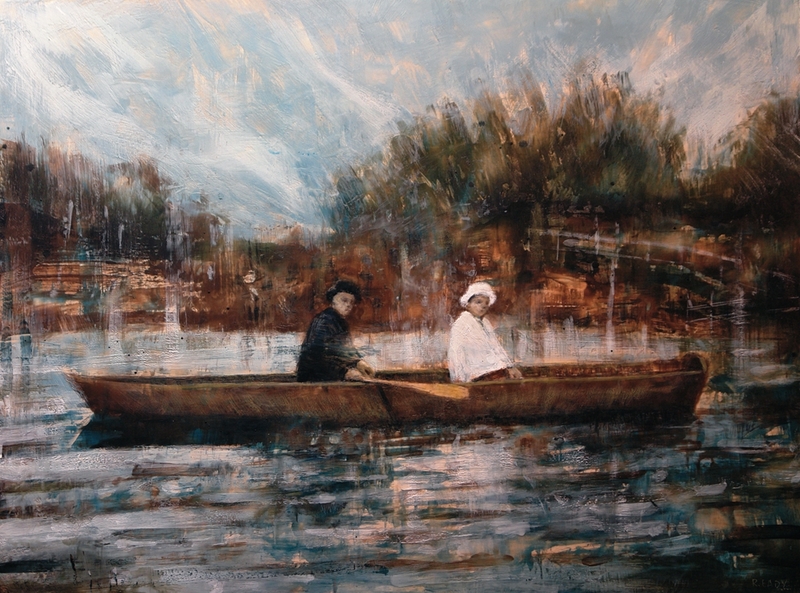 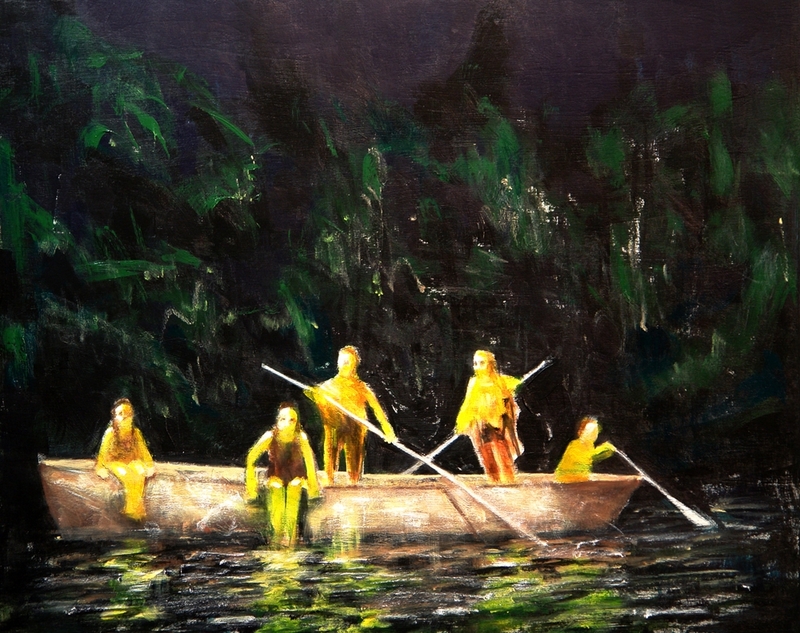 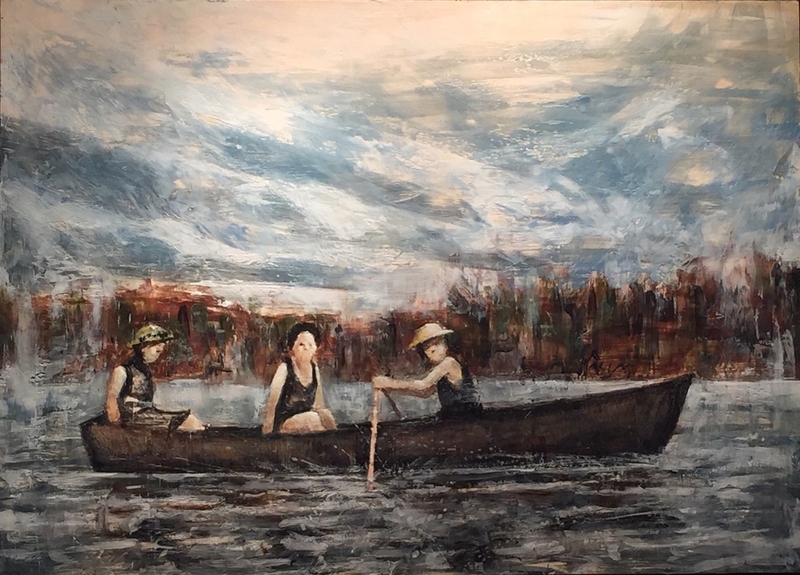 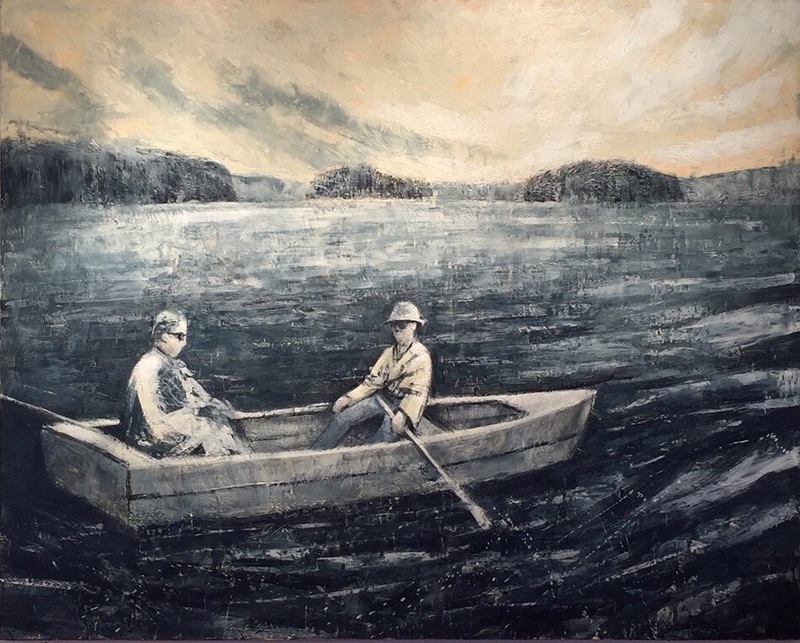 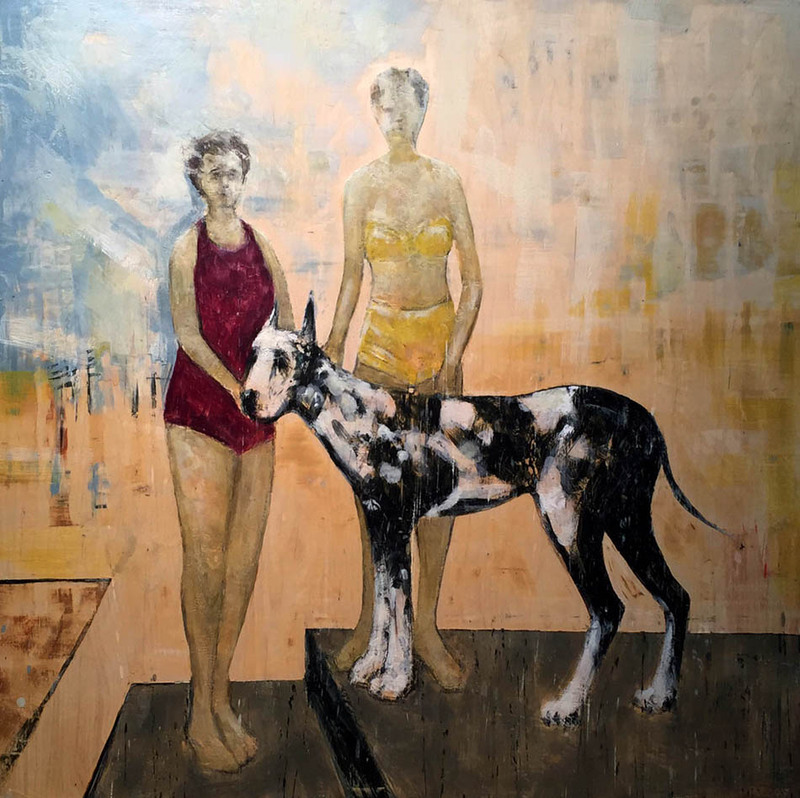 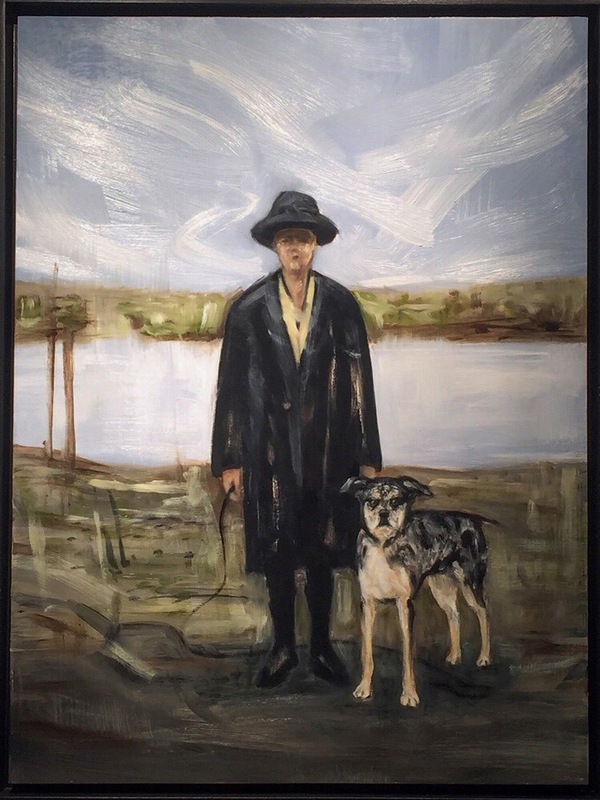 Ladies on the Lake, 2018, encaustic on panel, 36 x 48 in. 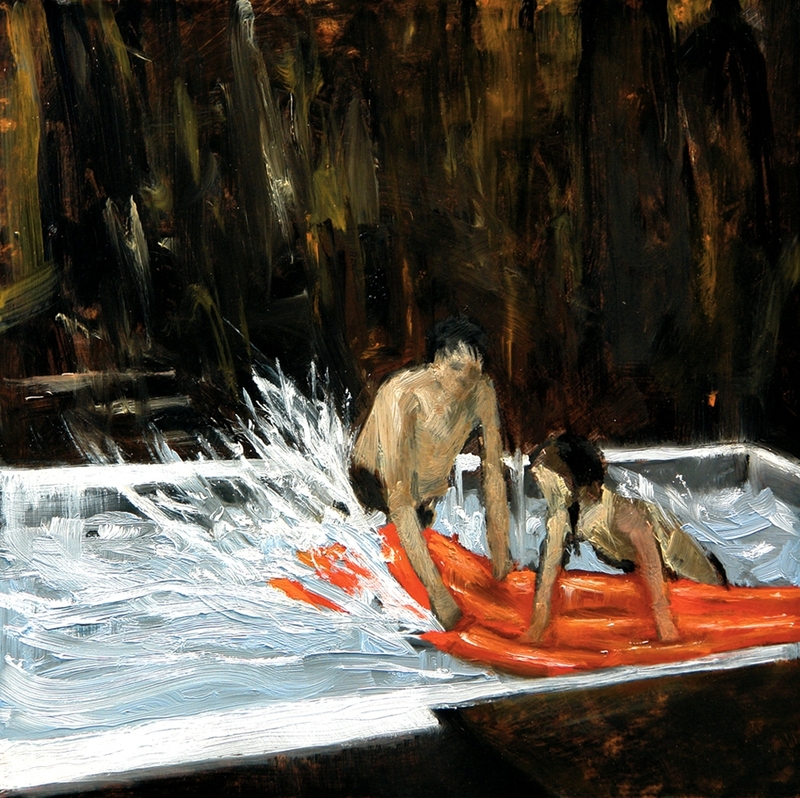 The Crossing, 2016, oil on panel, 18 x 24 in. 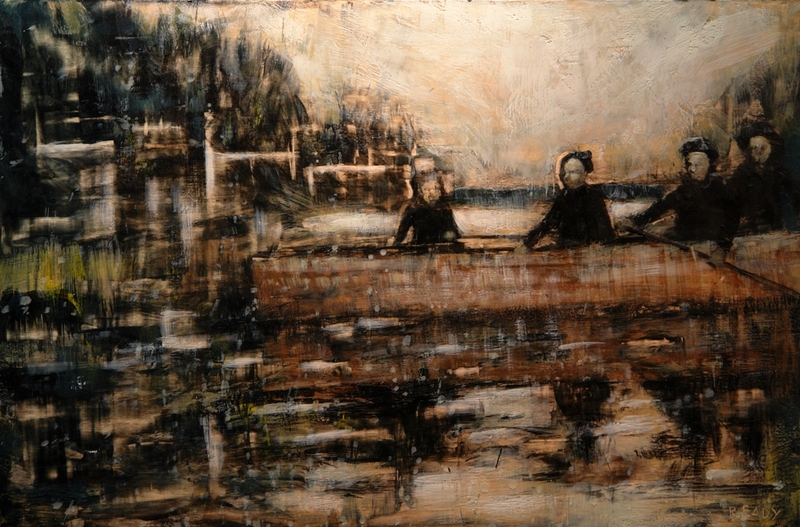 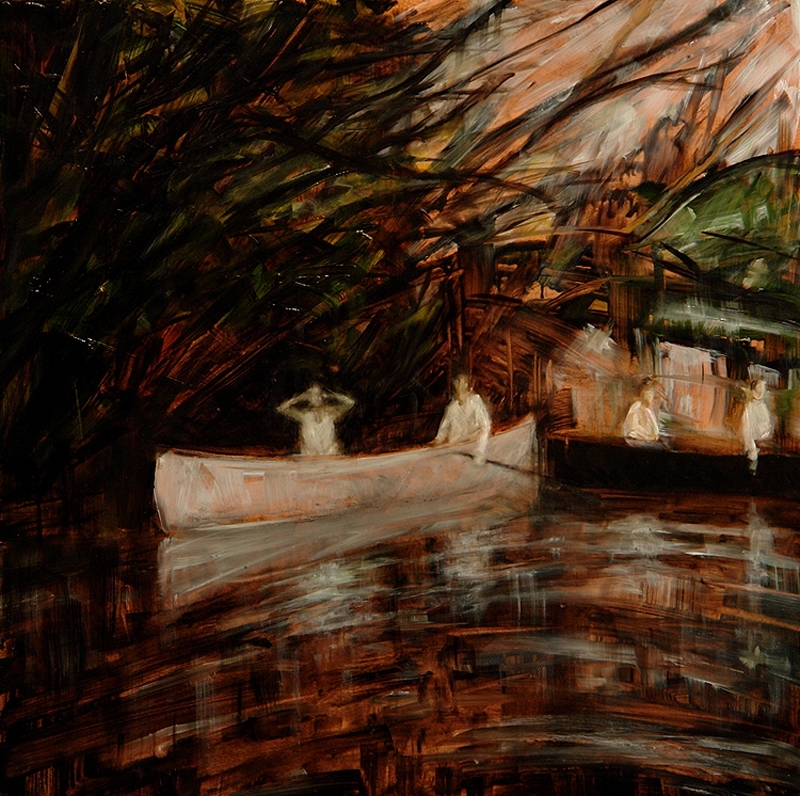 Shadow River Stories no.2, encaustic on panel, 24 x 36 in. 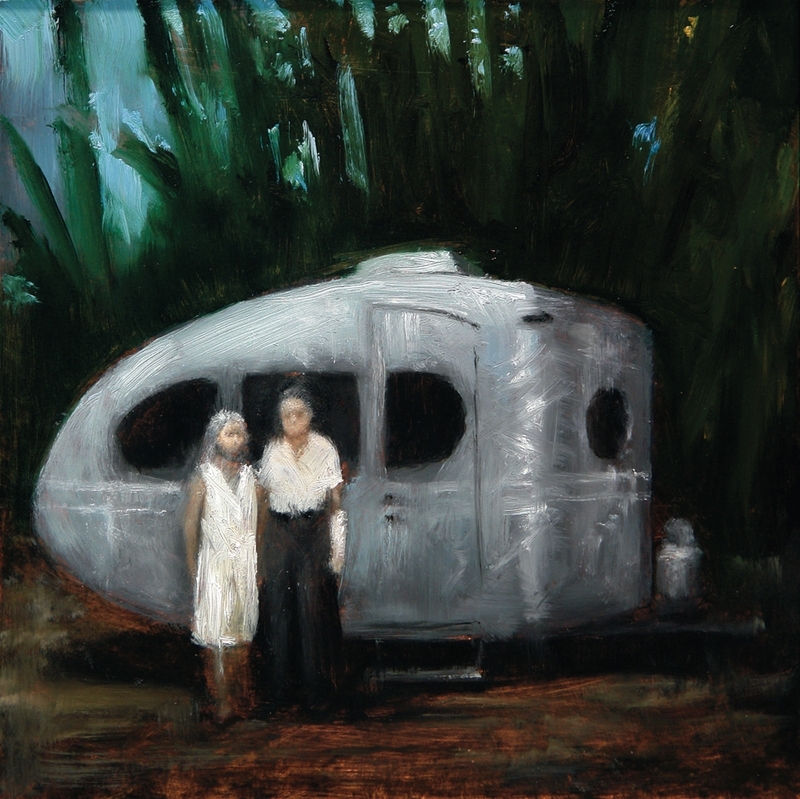 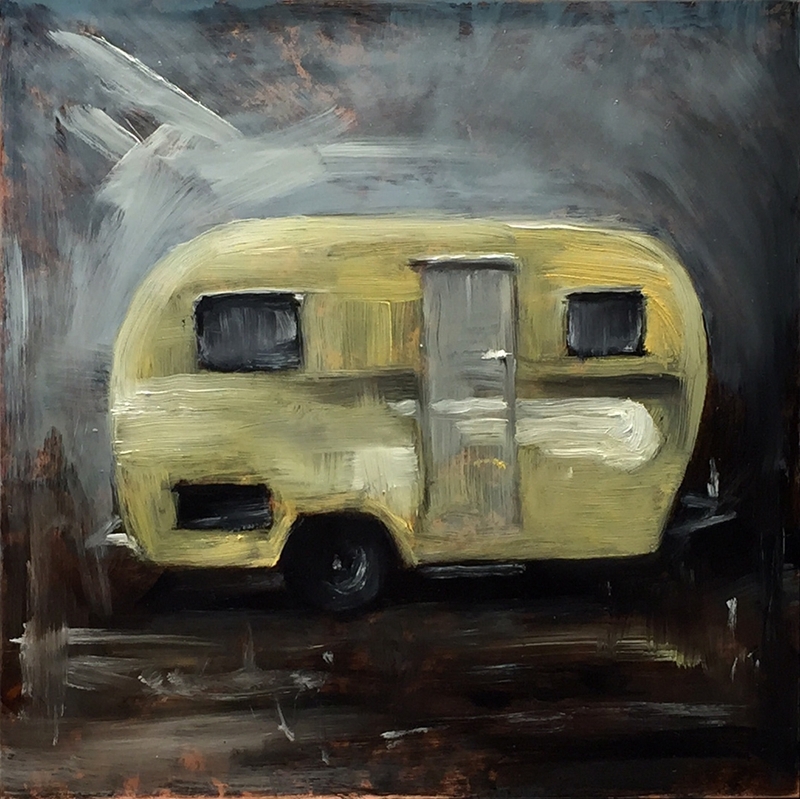 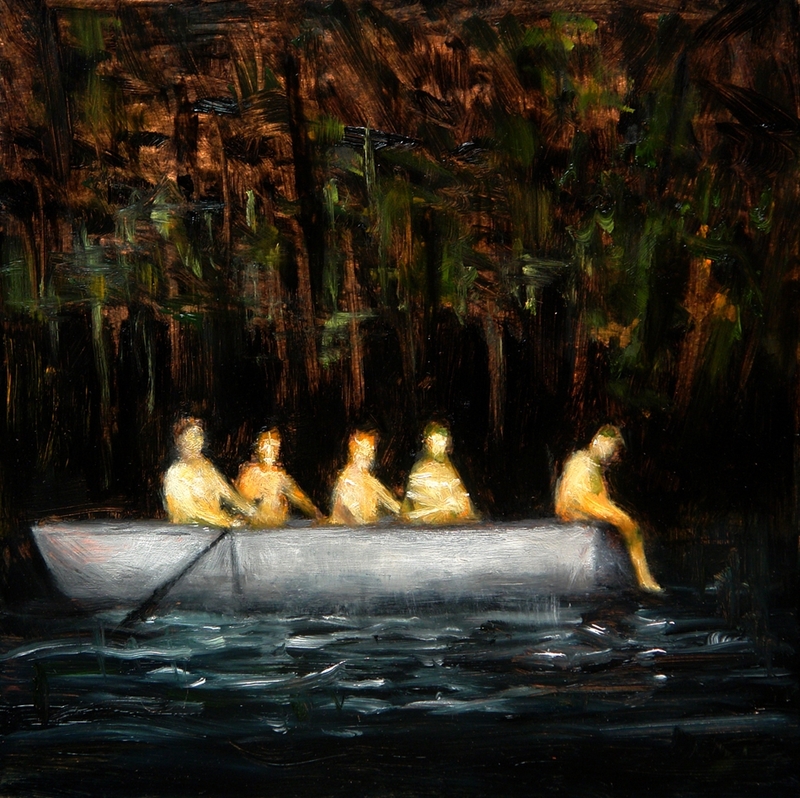 Shadow River Stories no.1, 2015, oil on copper, 10 x 10 in. 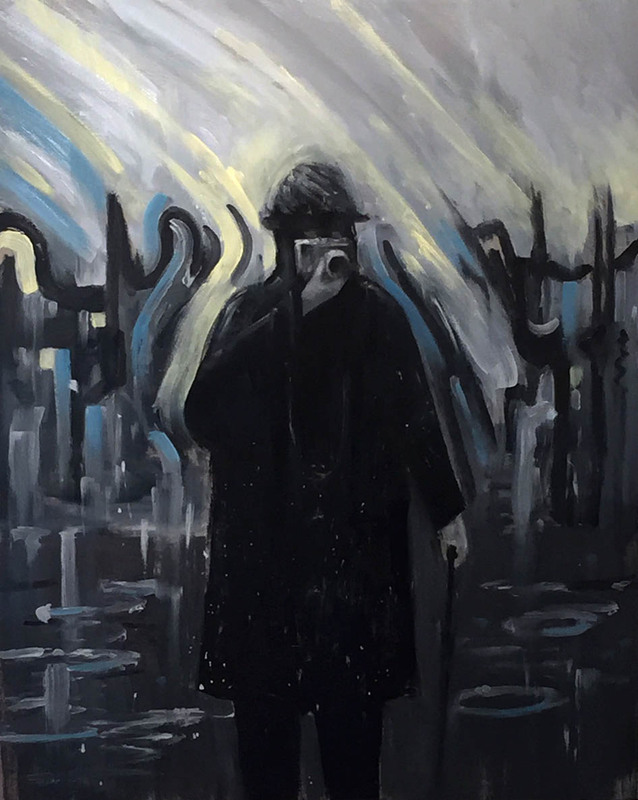 Photog in the Rain, 2016, oil on panel, 30 x 24 in. 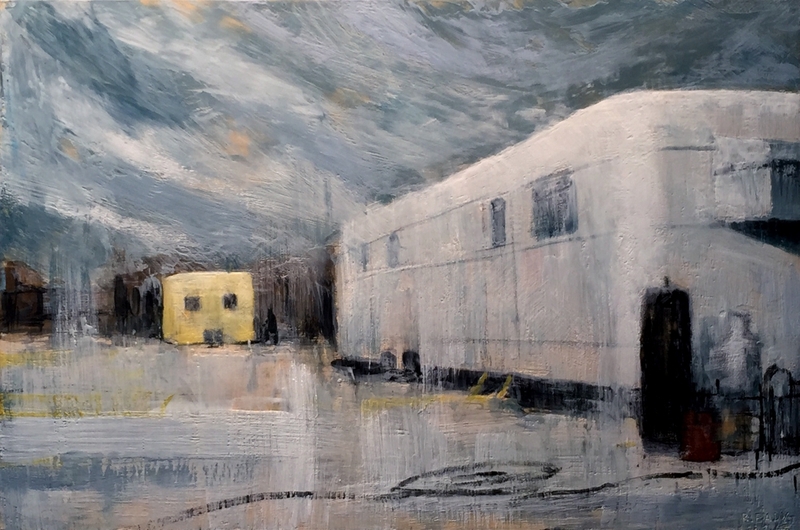 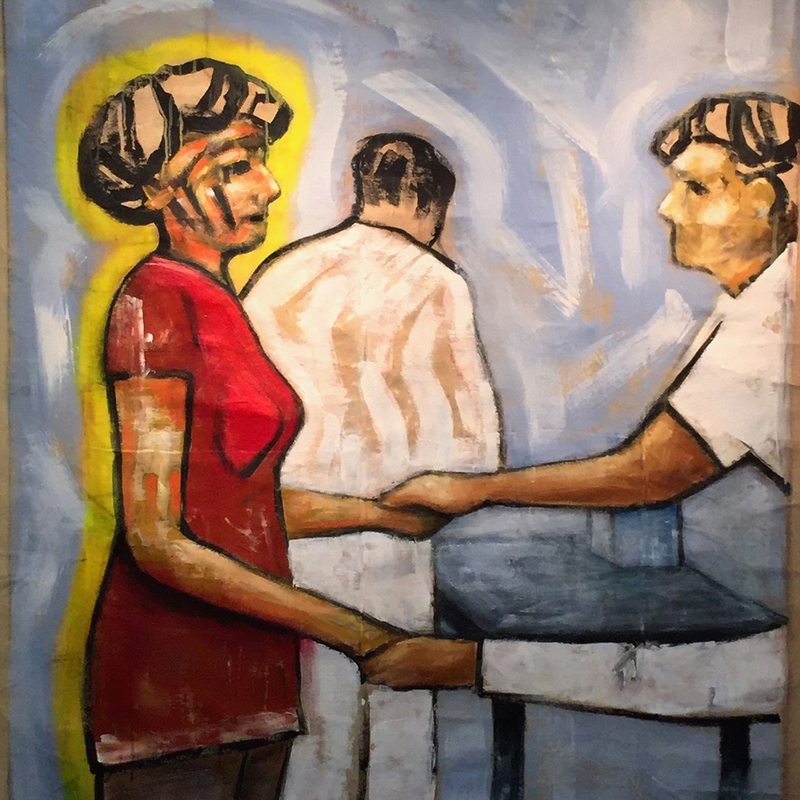 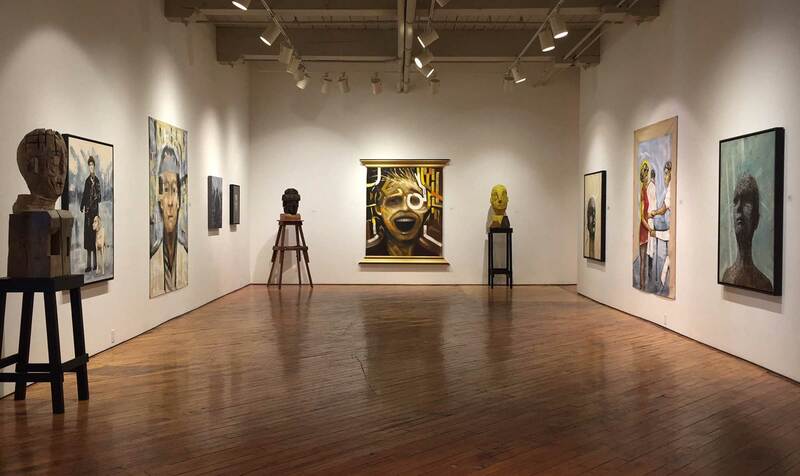 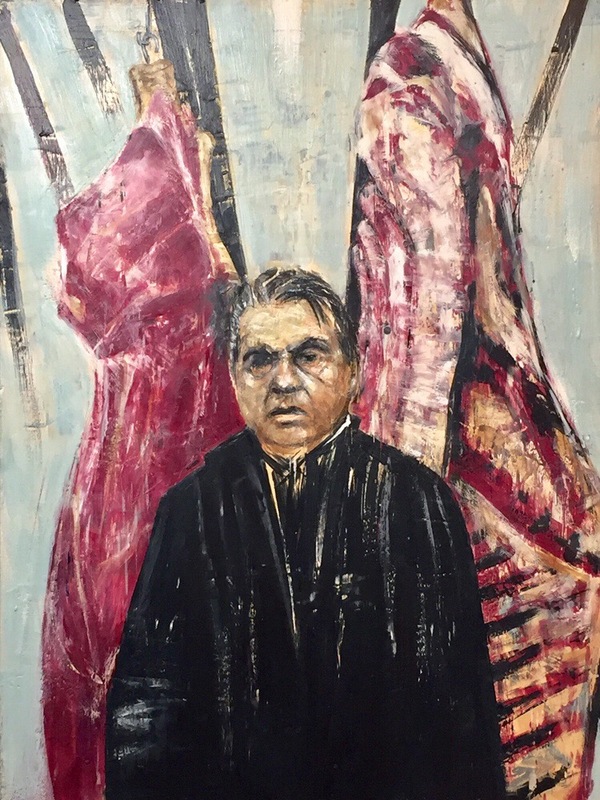 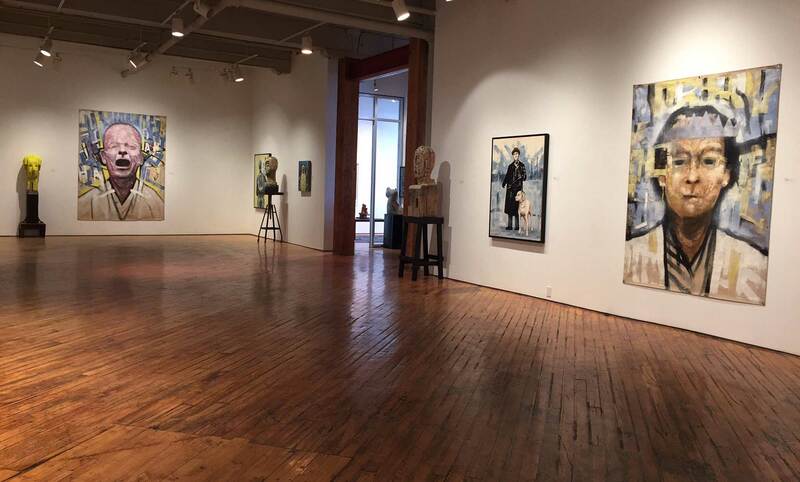 The Office, 2015, encaustic on panel, 30 x 40 in. 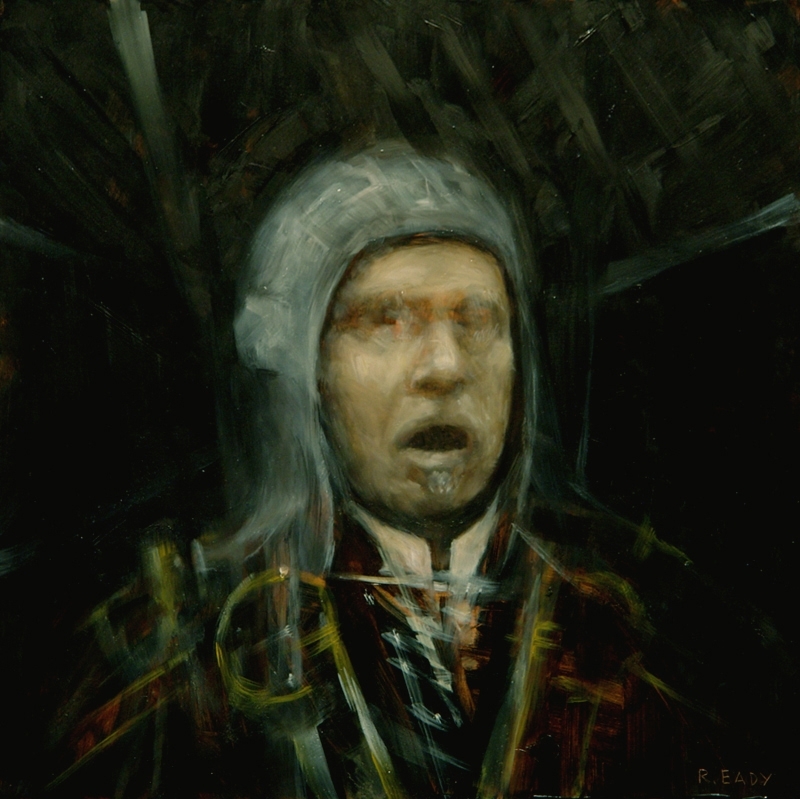 Unfit, 2015, oil on copper, 10 x 10 in. 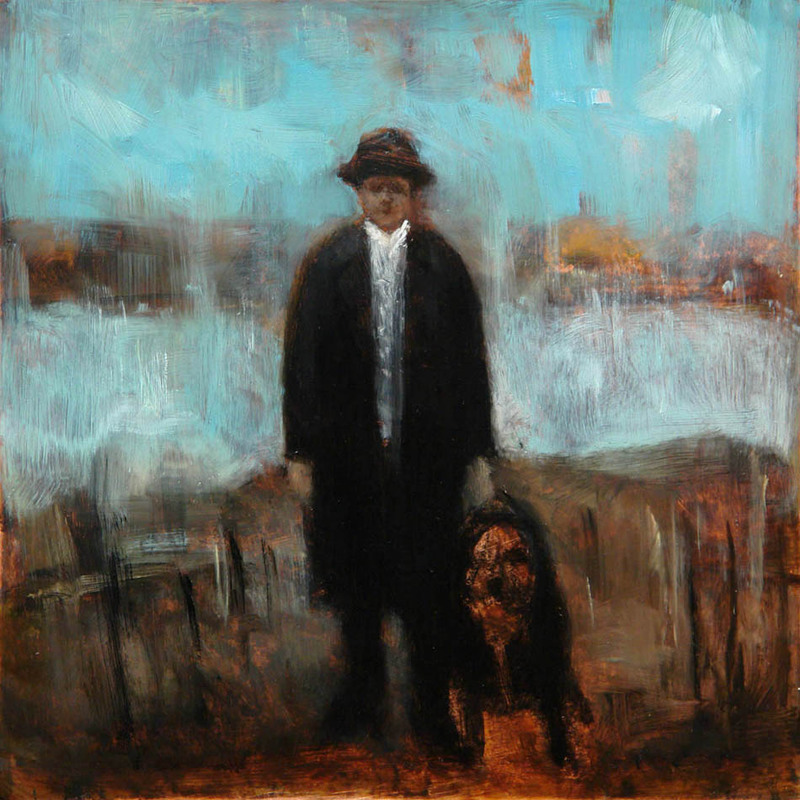 Papoose, 2014, oil on copper, 12 x 12 in. 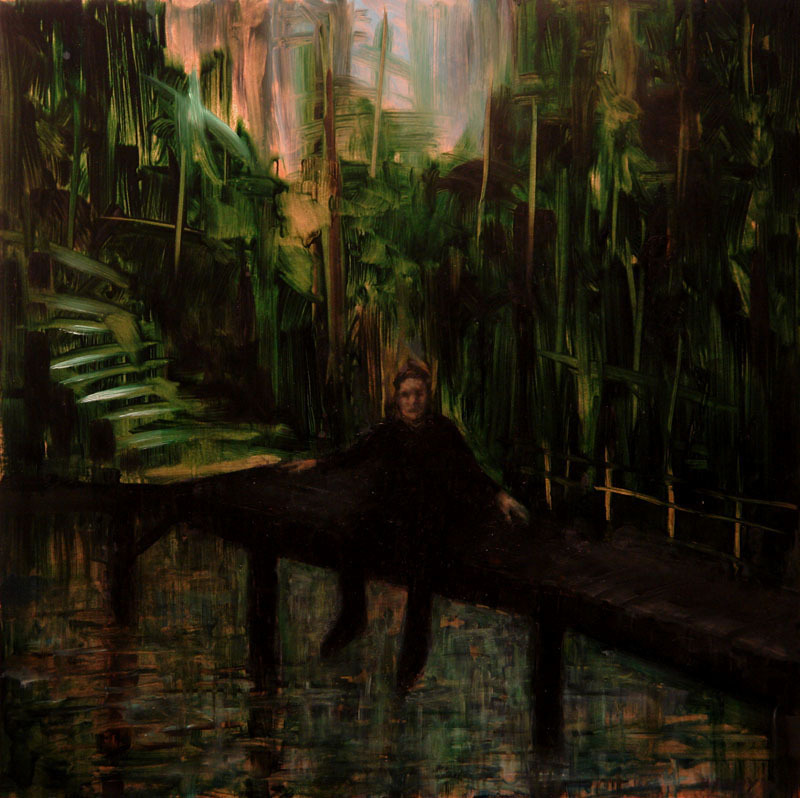 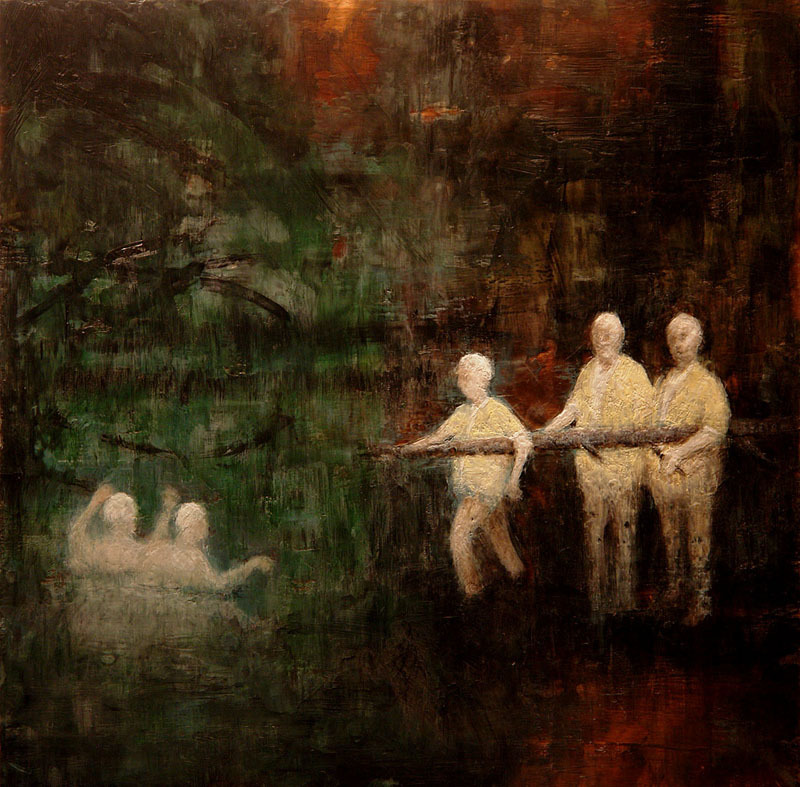 The Cement Pond, 2015, oil on copper, 10 x 10 in. 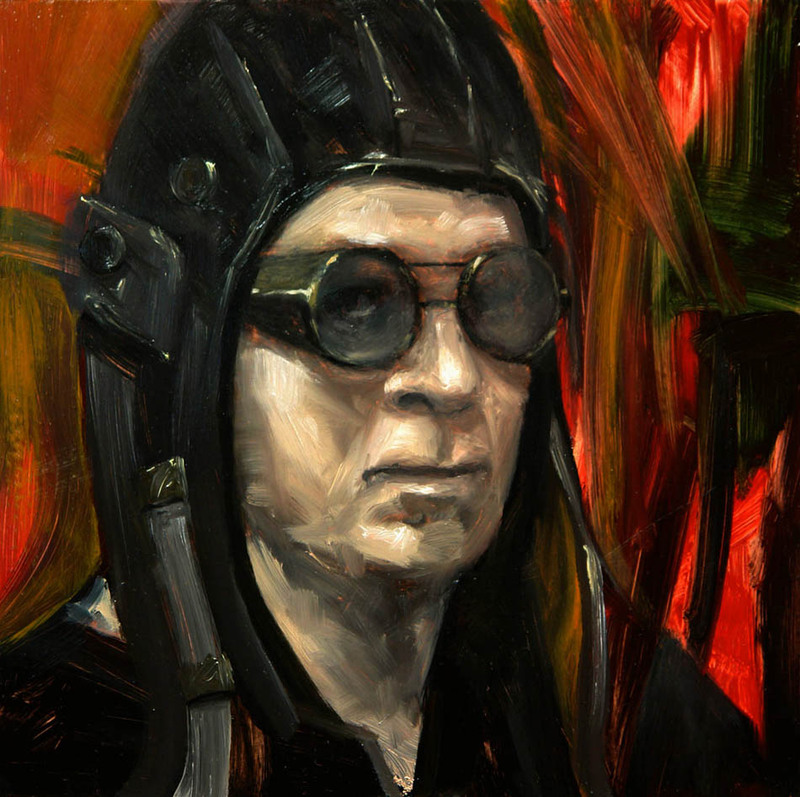 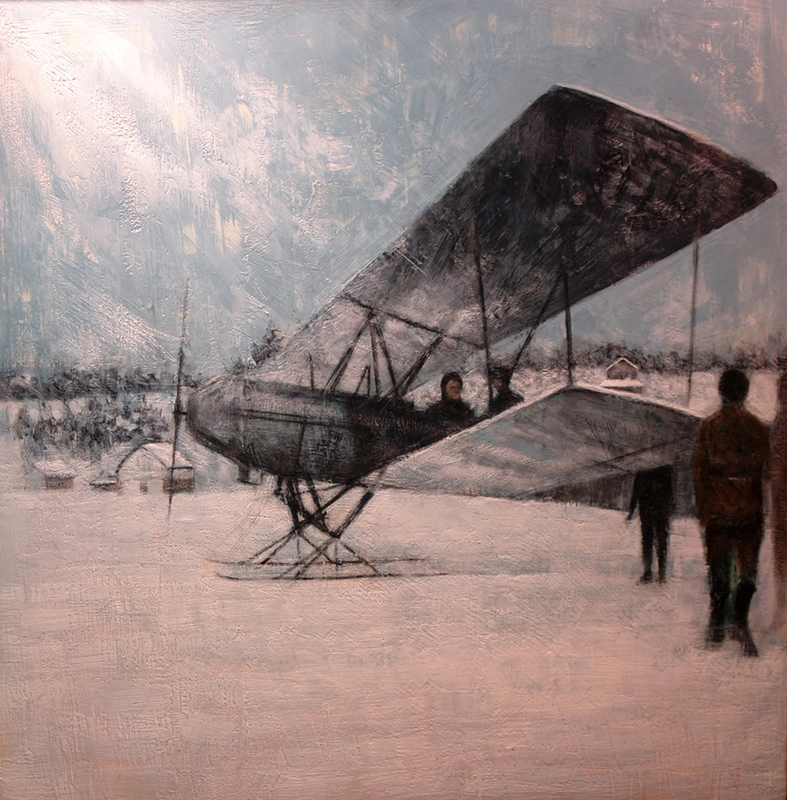 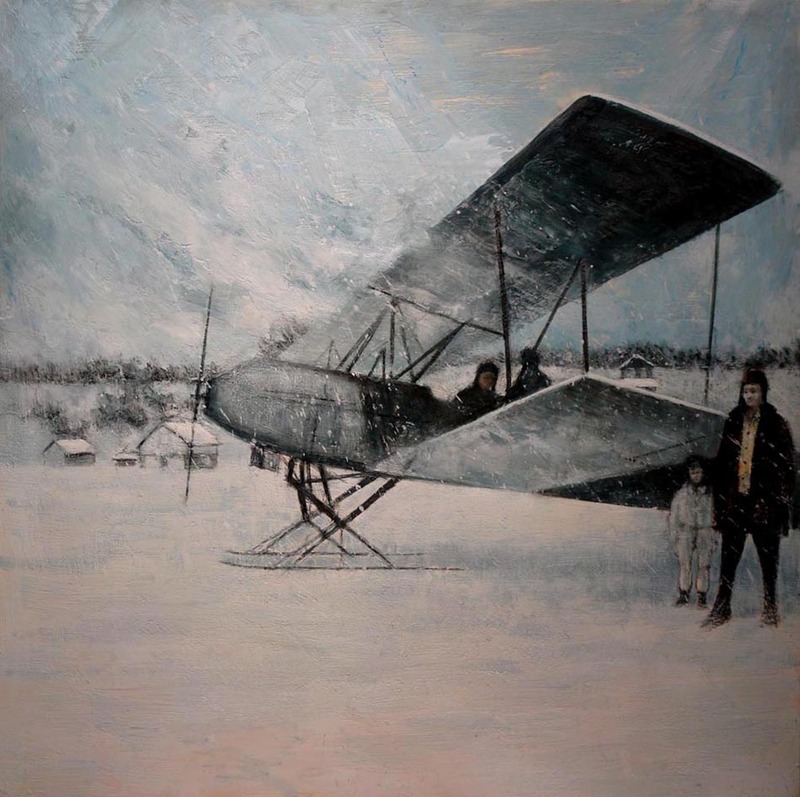 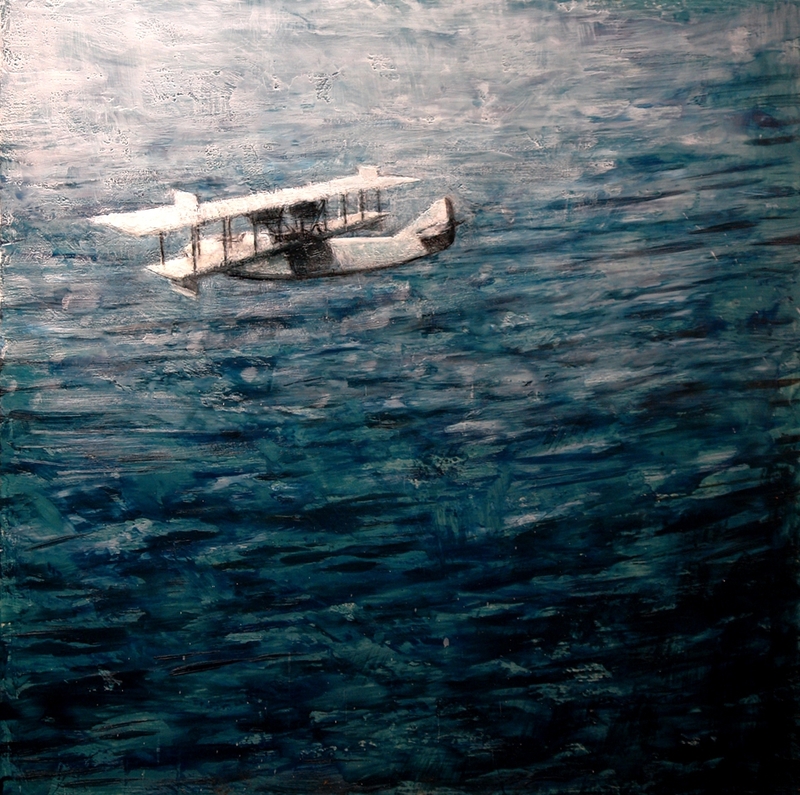 Flight Plan, 2014, encaustic on panel, 24 x 24 in. 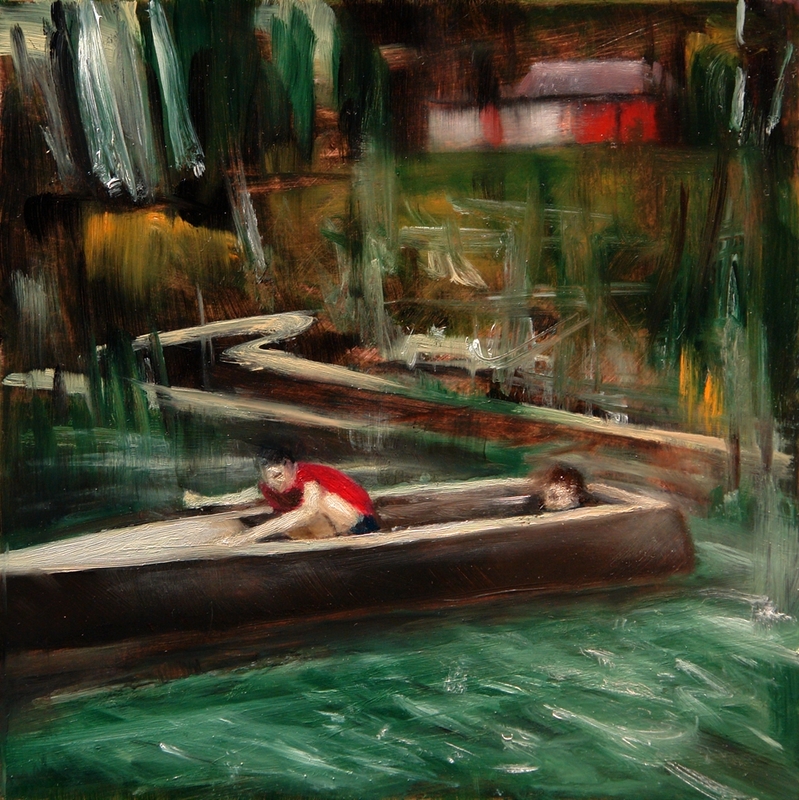 Dead Weight, 2015, oil on copper, 10 x 10 in. 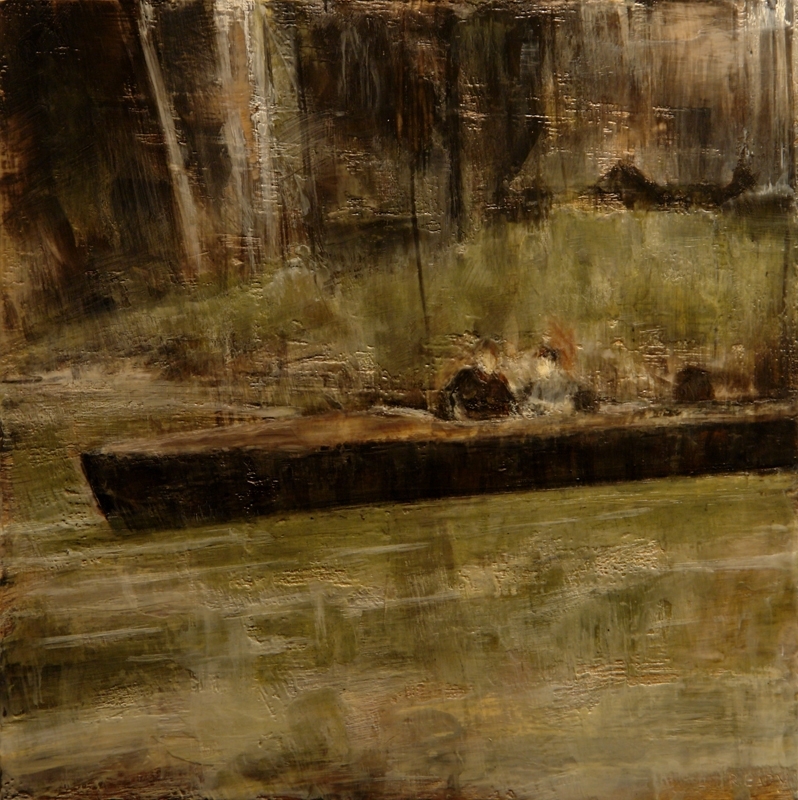 The Encounter, 2014, oil on copper, 12 x 12 in. 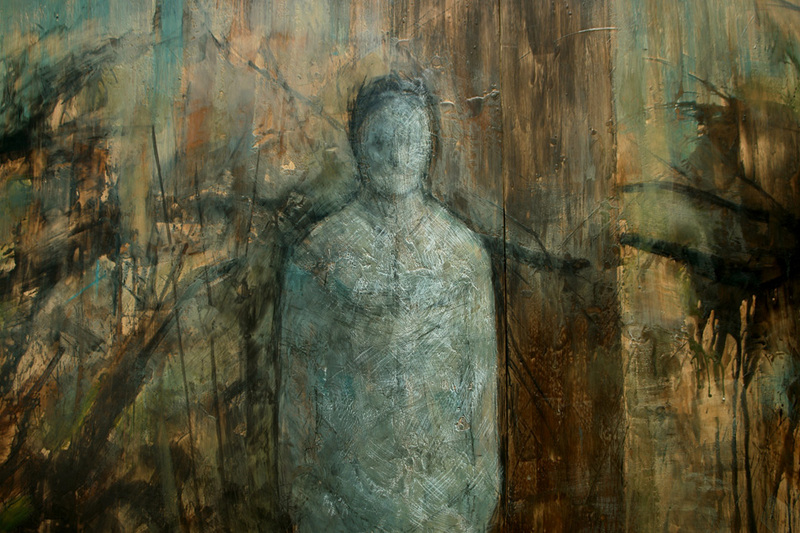 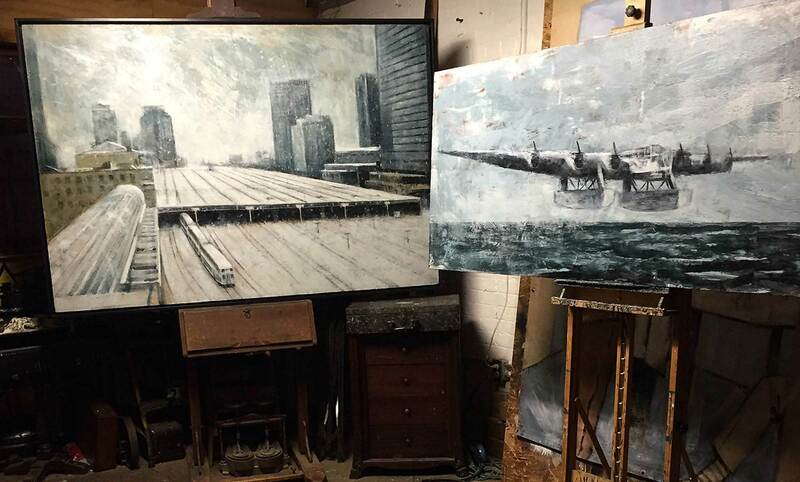 The Alternate Path, 2014, oil on copper, 48 x 36 in. 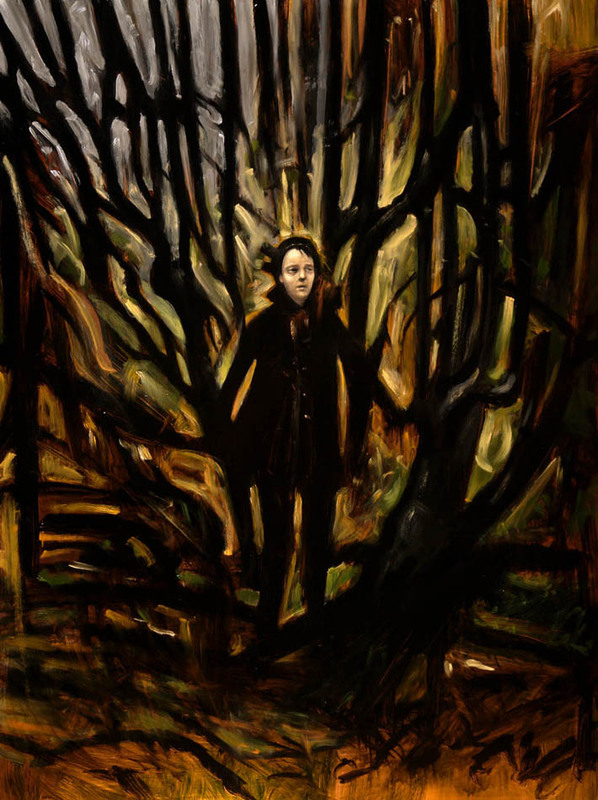 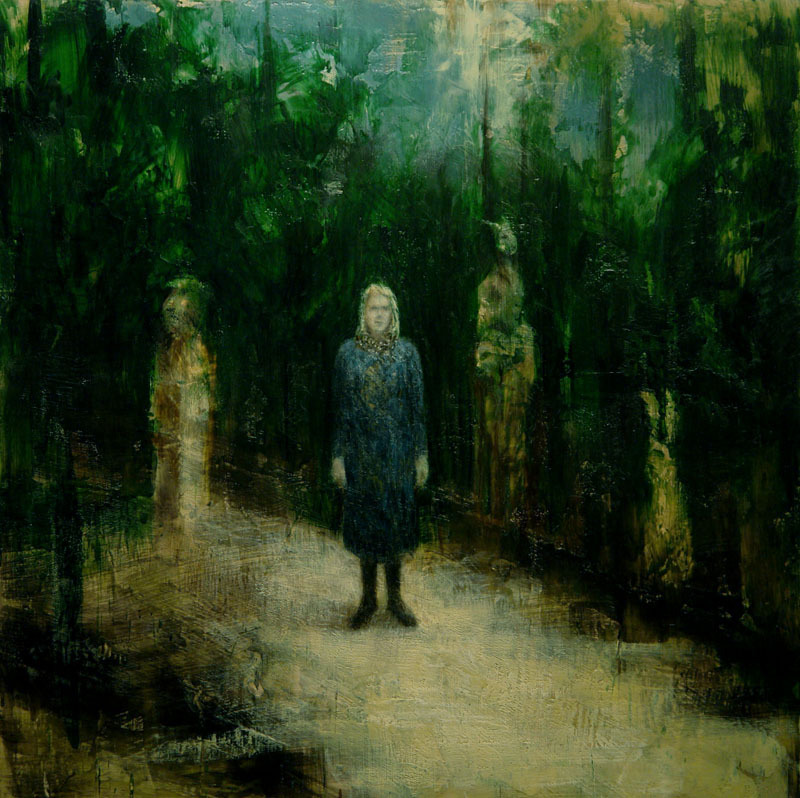 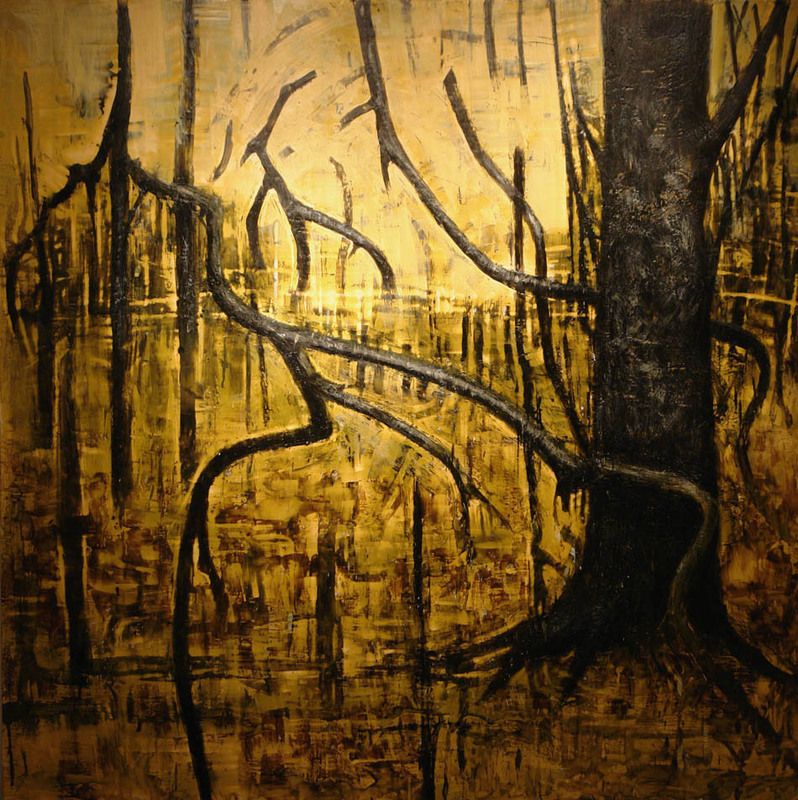 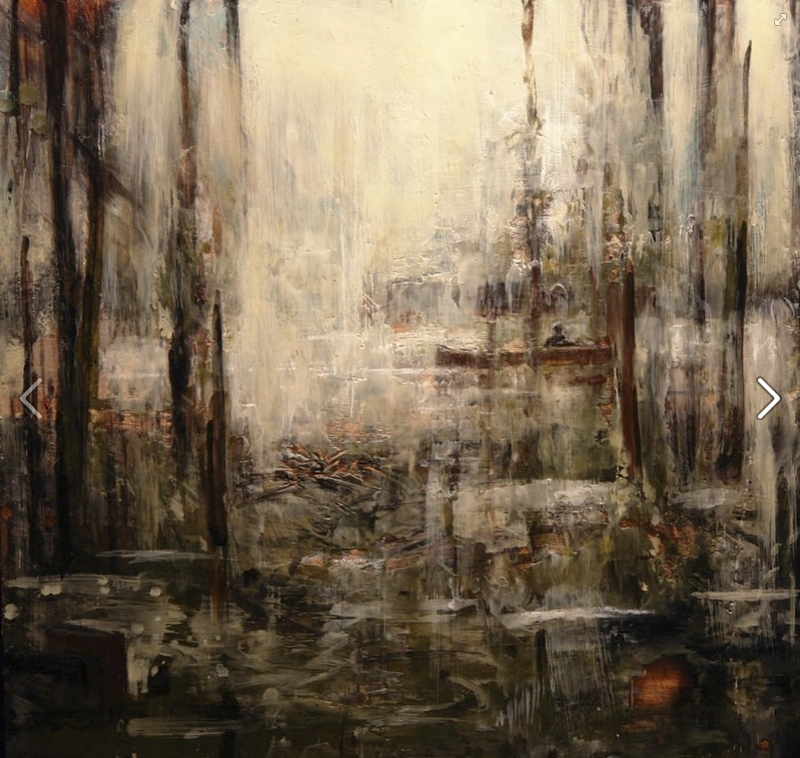 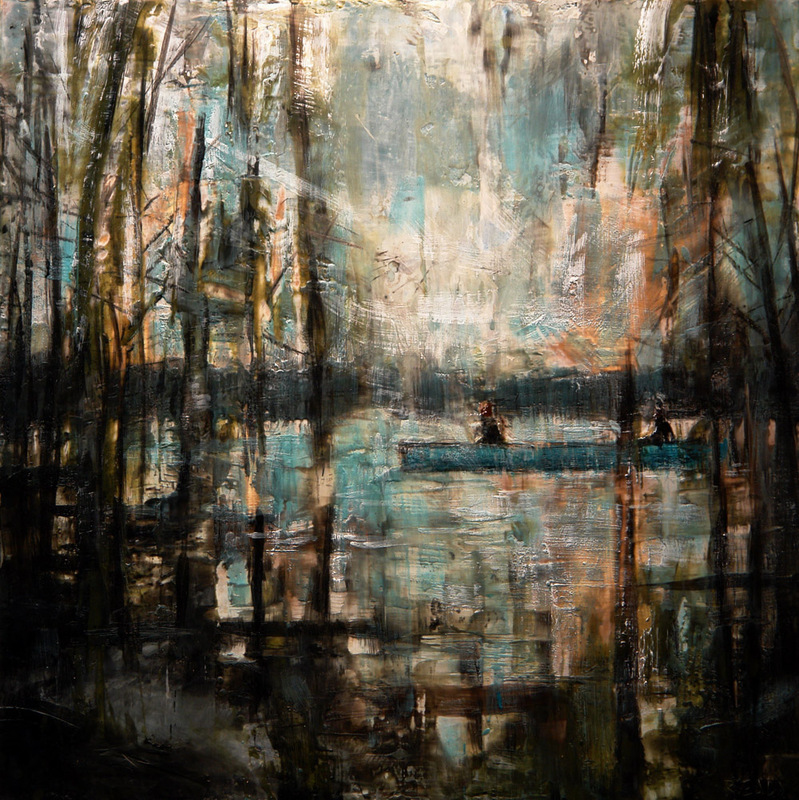 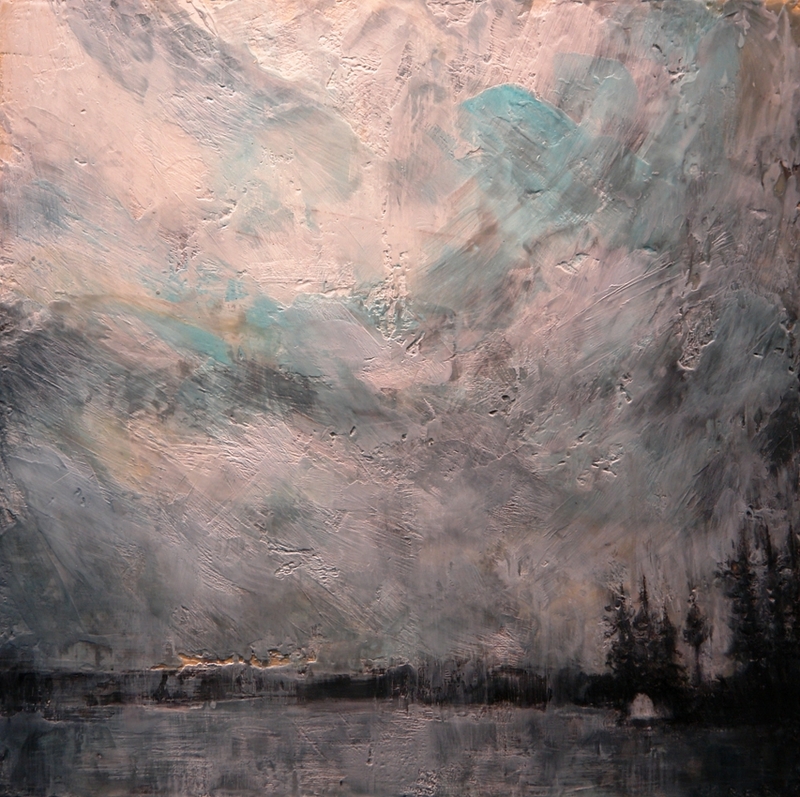 The Clearing, 2013, encaustic on panel, 48 x 48 in. 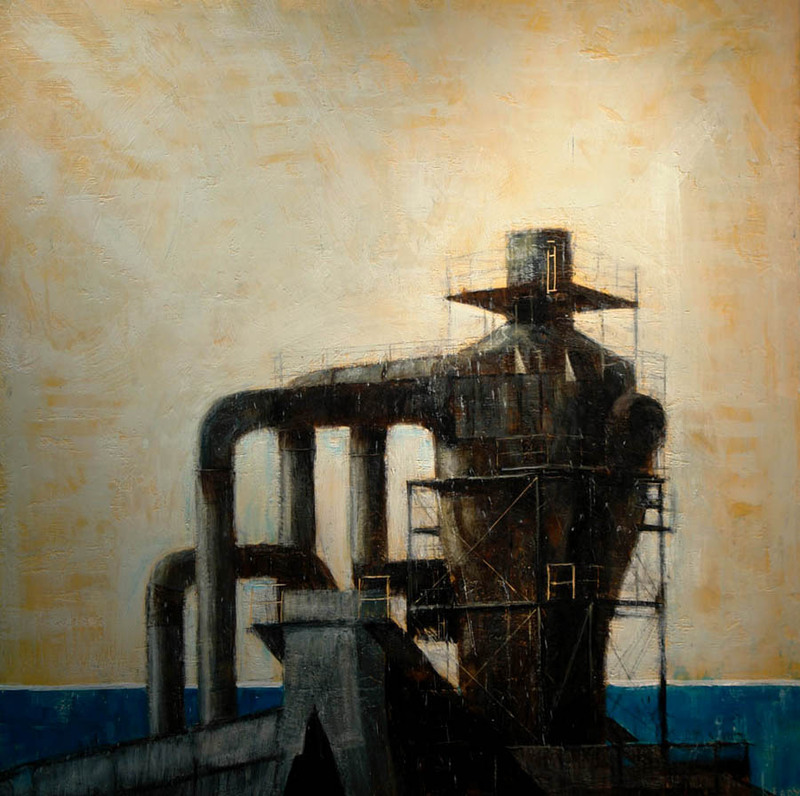 Reaching Betsy, 2013, oil on panel, 30 x 40 in. 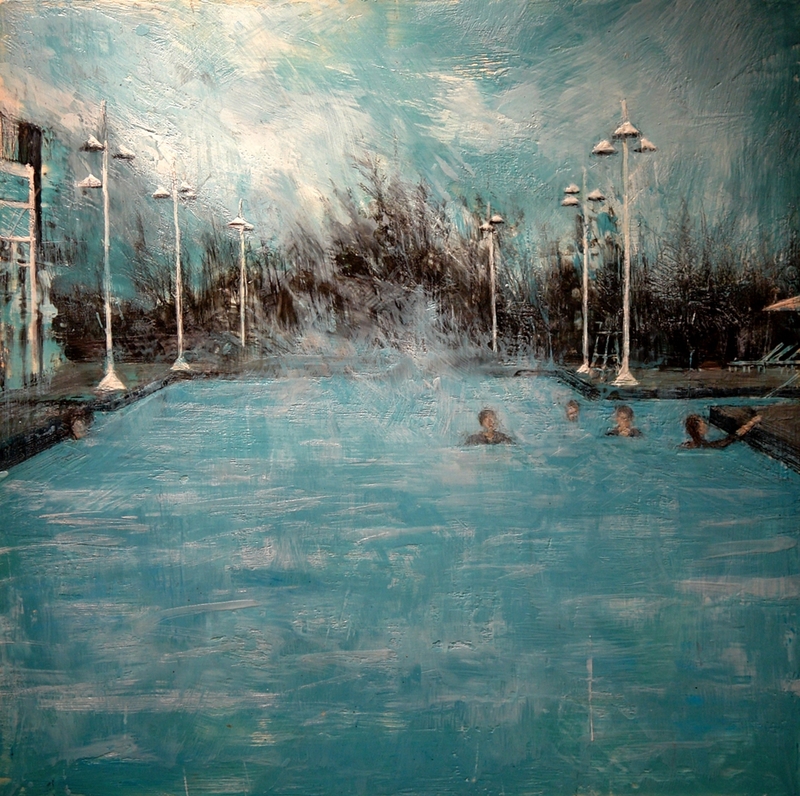 The Water Lot #2, 2012, encaustic on panel, 24 x 24 in. 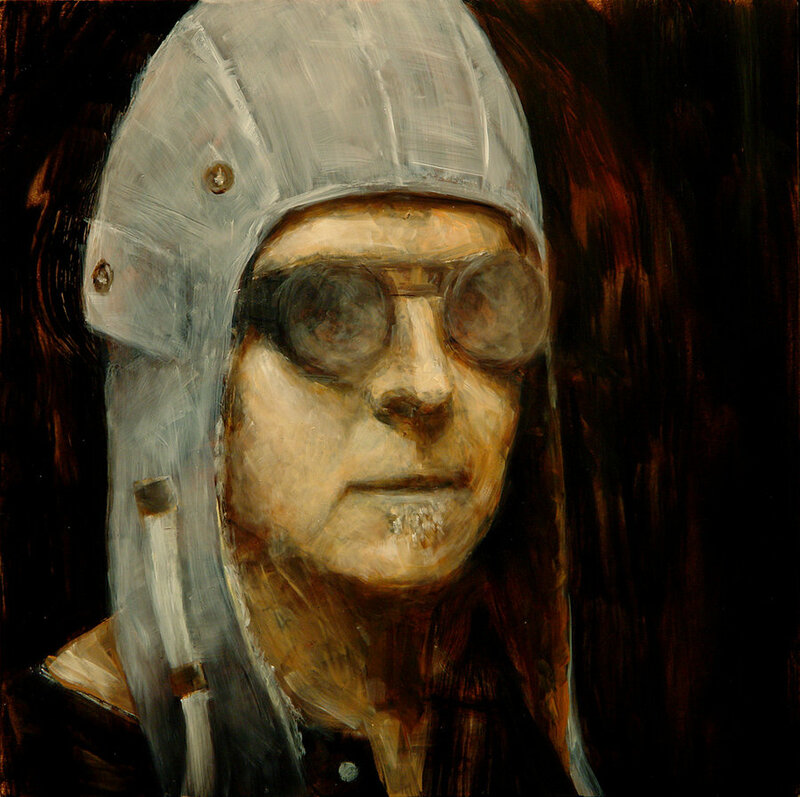 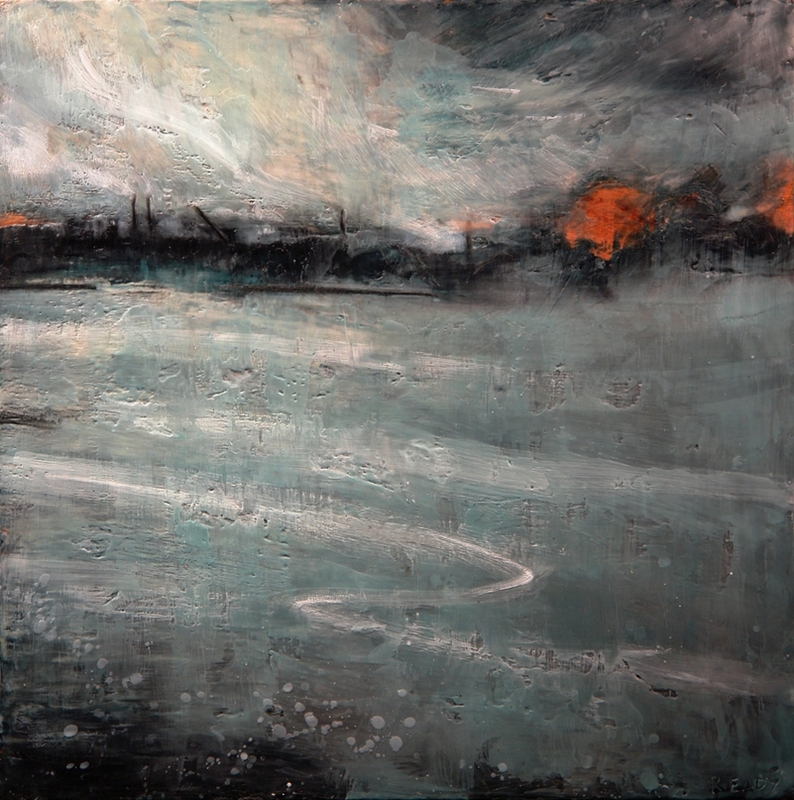 Unforeseen, 2011, encaustic on panel, 20 x 20 in. 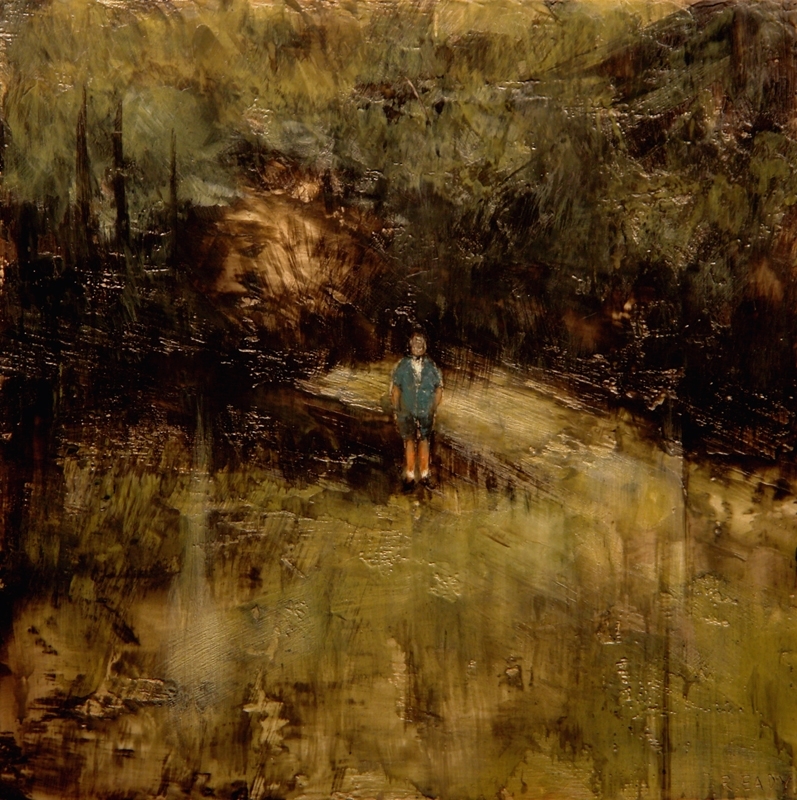 Lost Garden, 2009, encaustic on panel, 72 x 96 in. 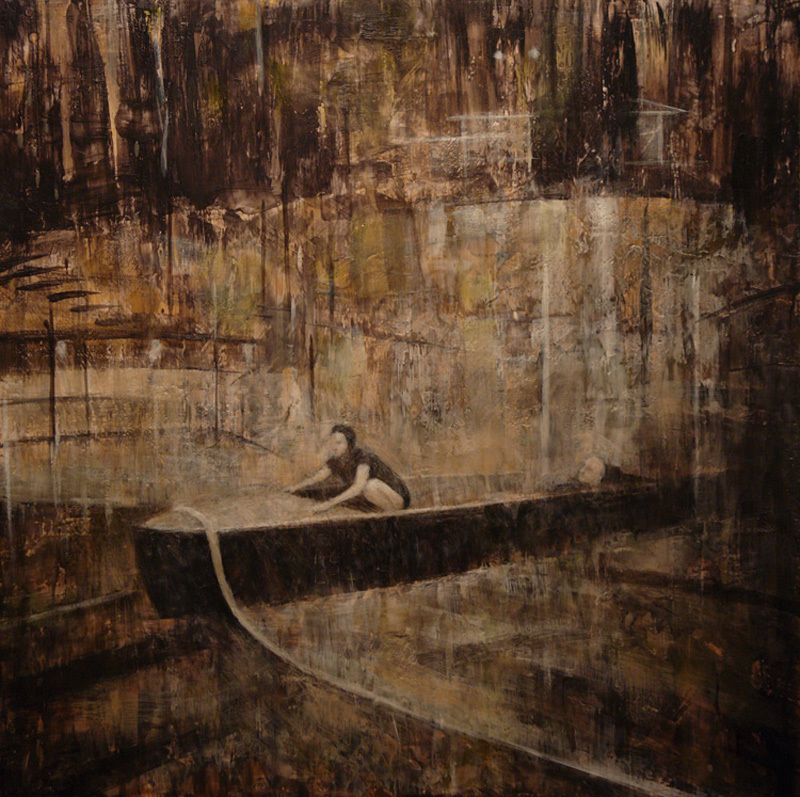 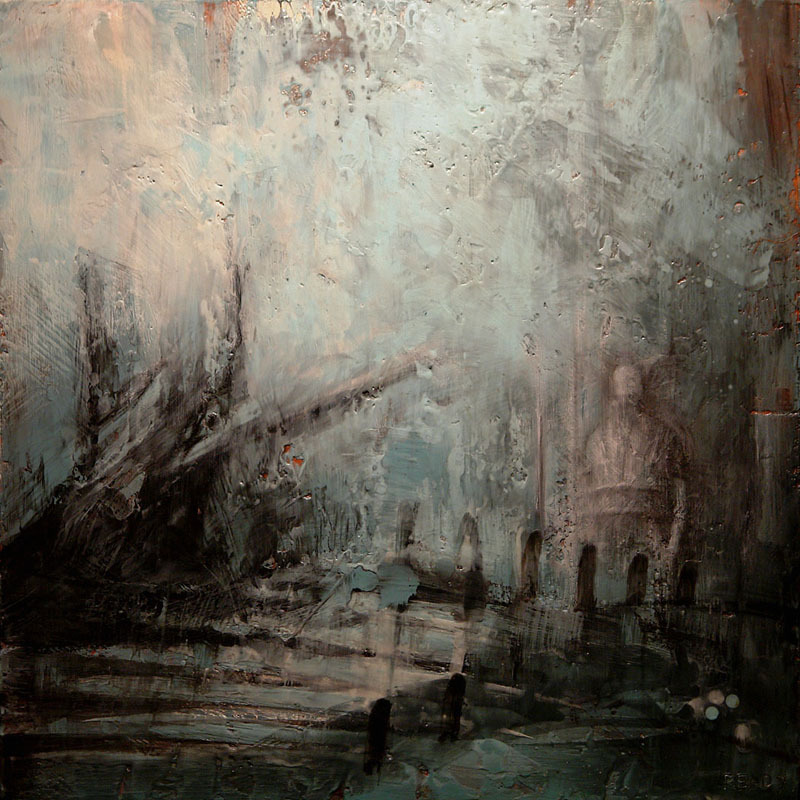 Inquietude, 2008, encaustic on panel, 36 x 36 in. 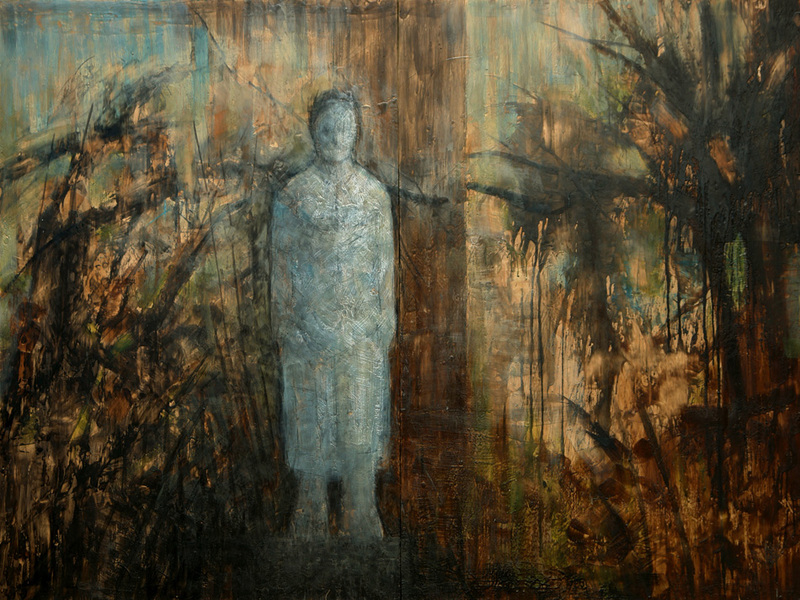 Encounter at Kawandag, 2009, encaustic on panel, 72 x 44 in. 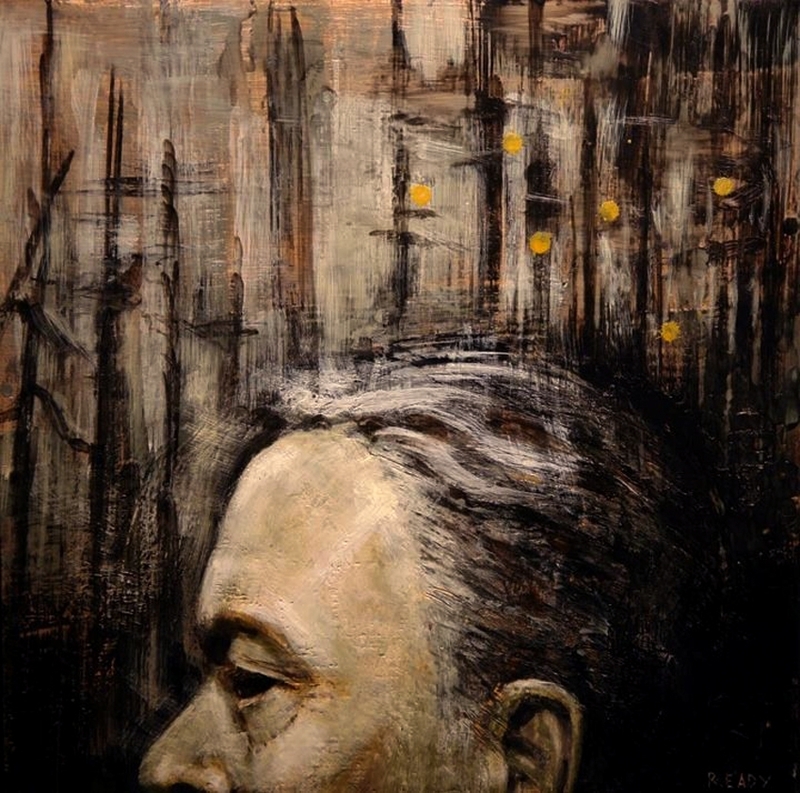 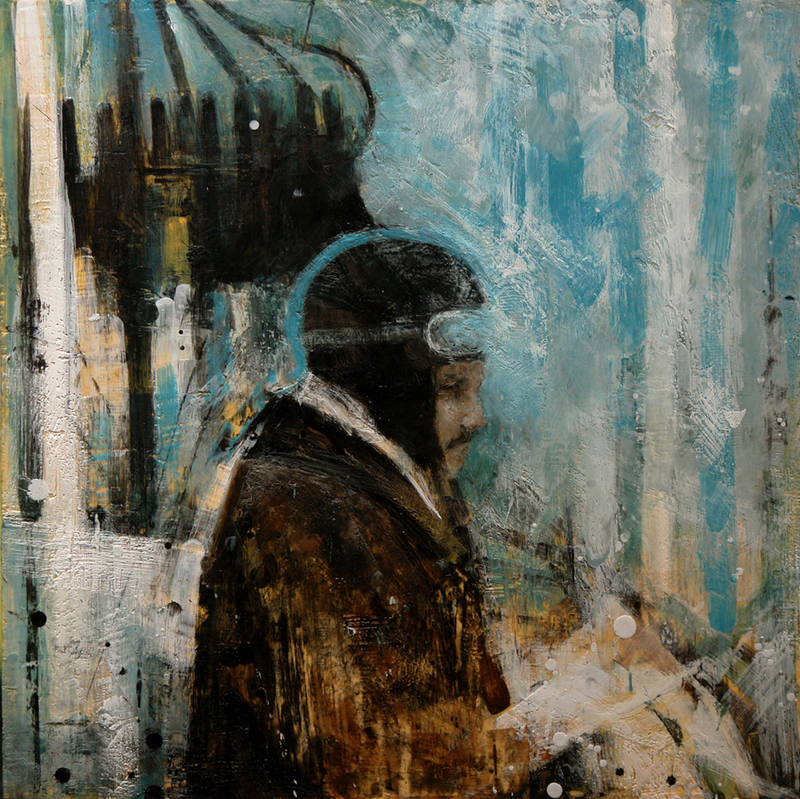 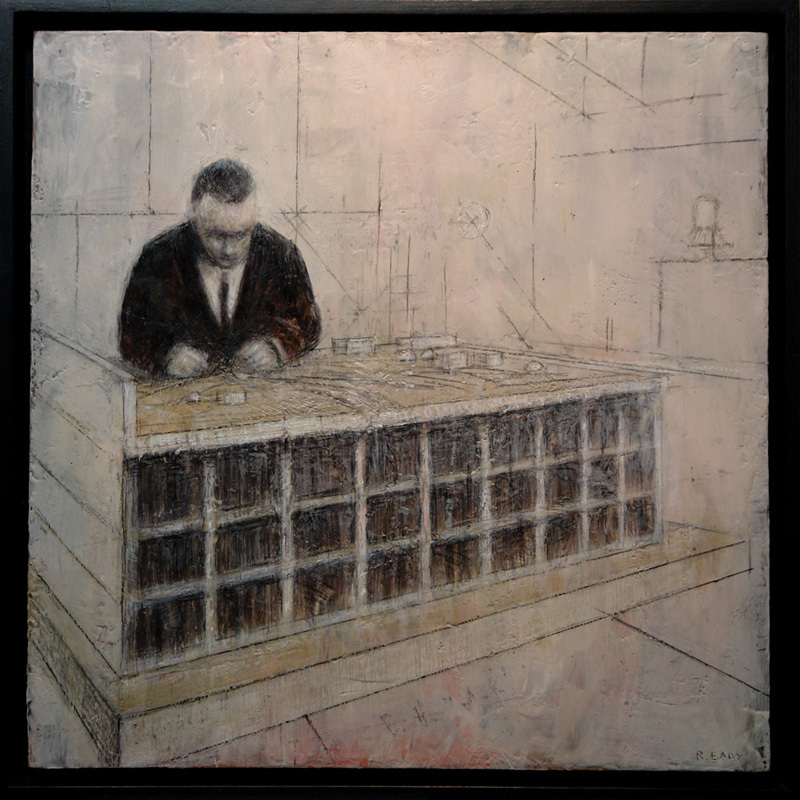 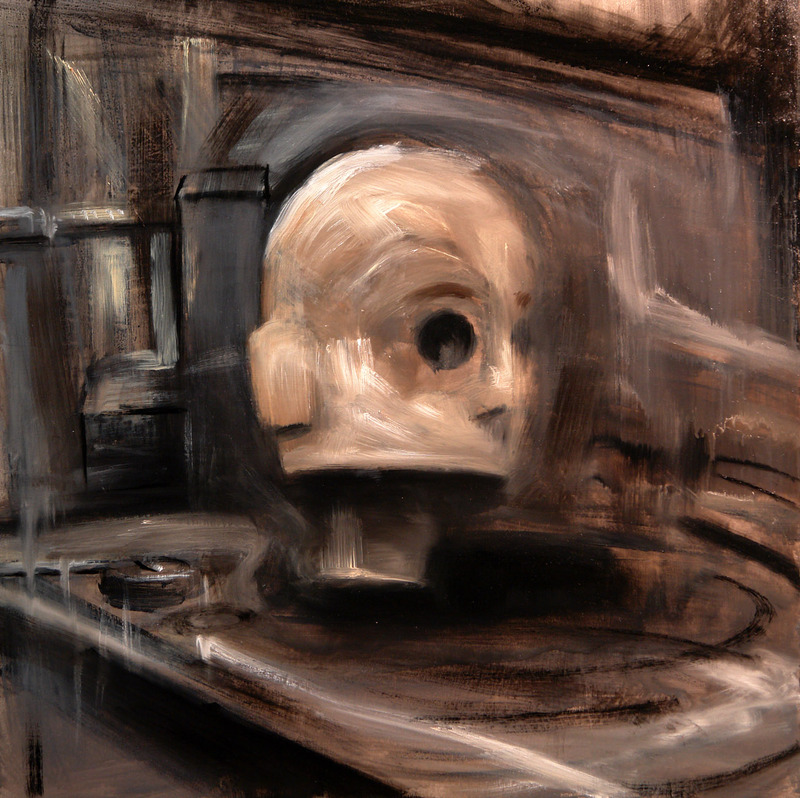 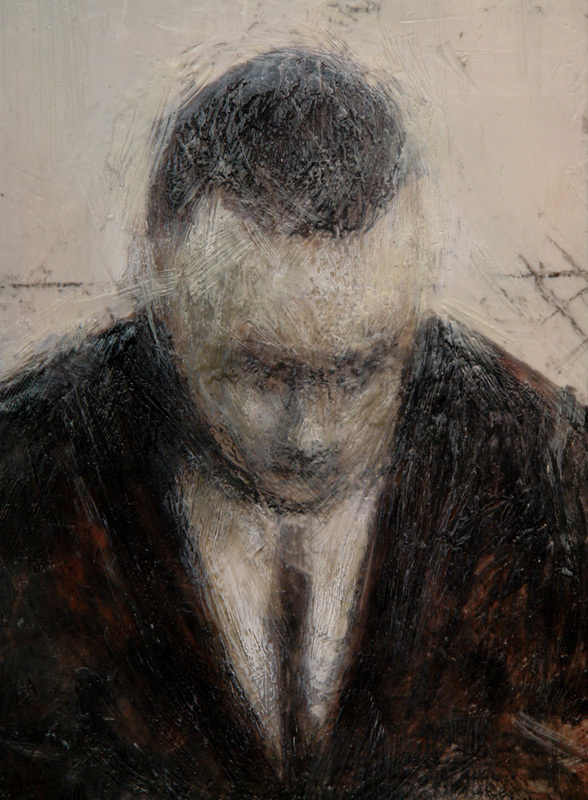 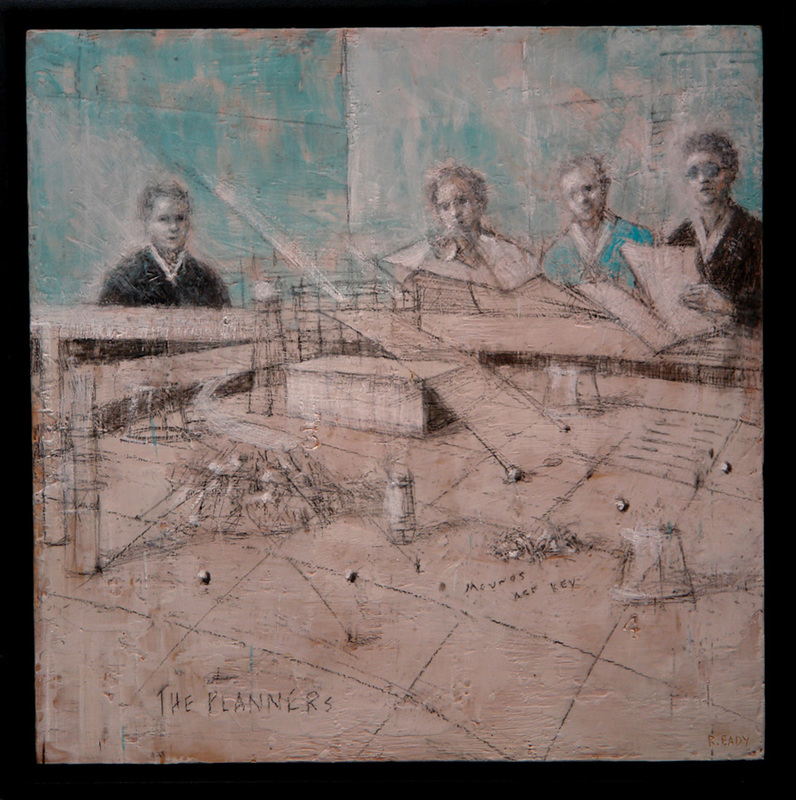 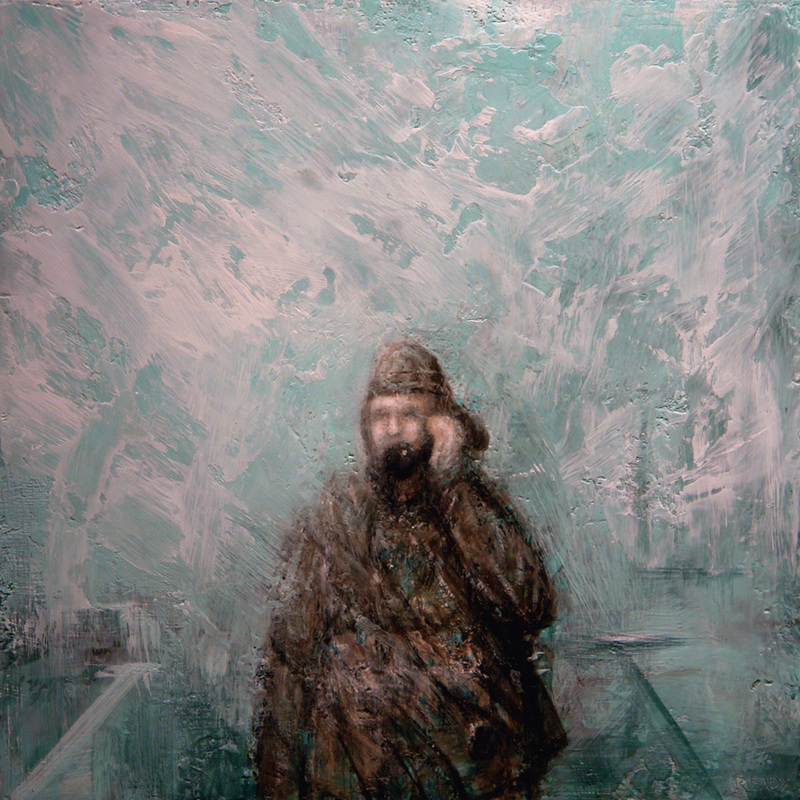 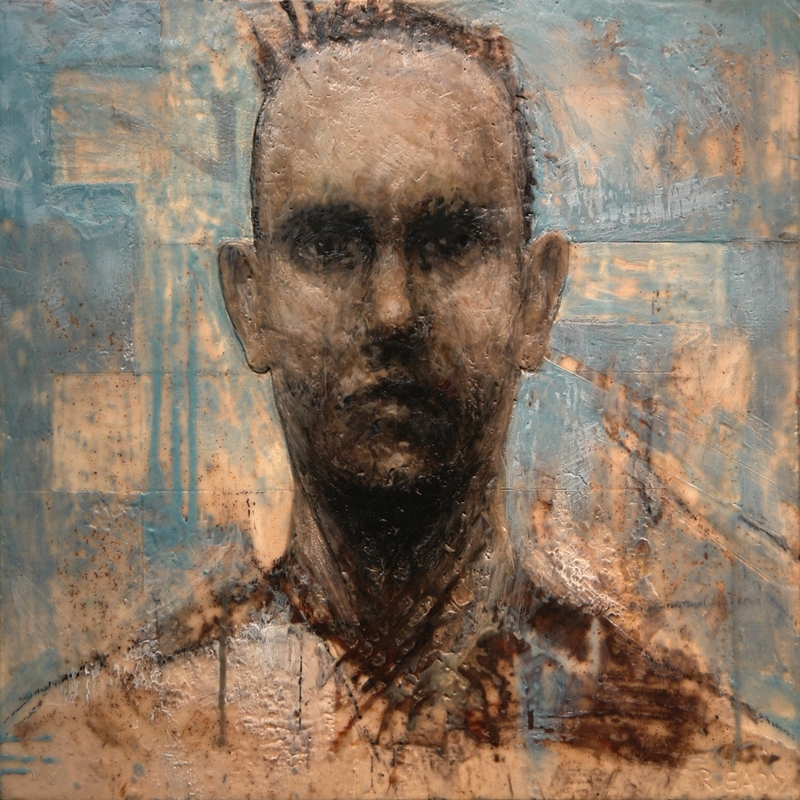 Study for the Architect, 2009, encaustic, pastel on panel, 24 x 24 in. 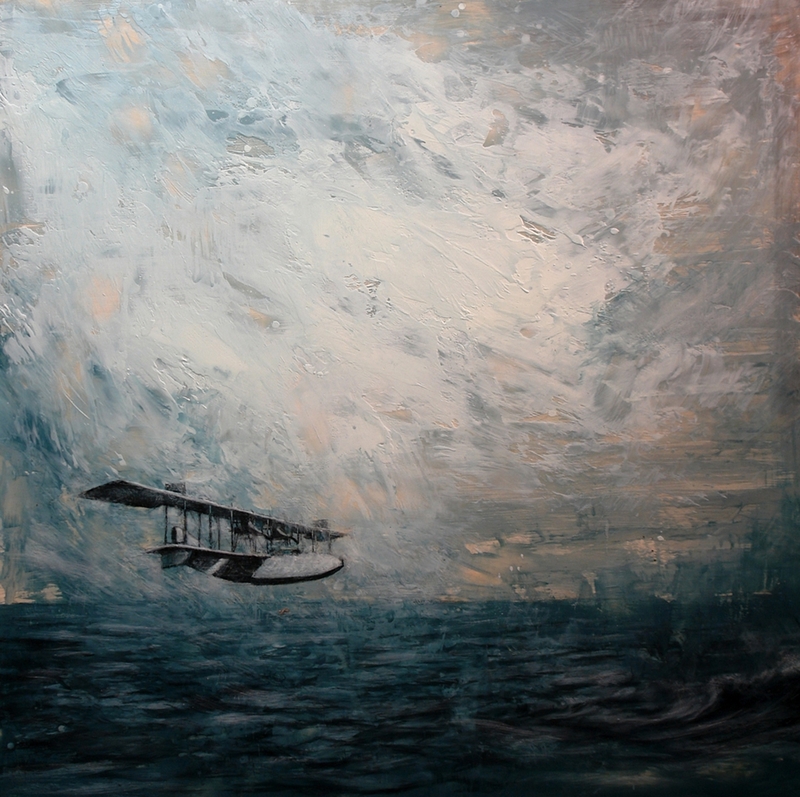 Flying Fortress, 2016, encaustic on panel, 36 x 72 in. 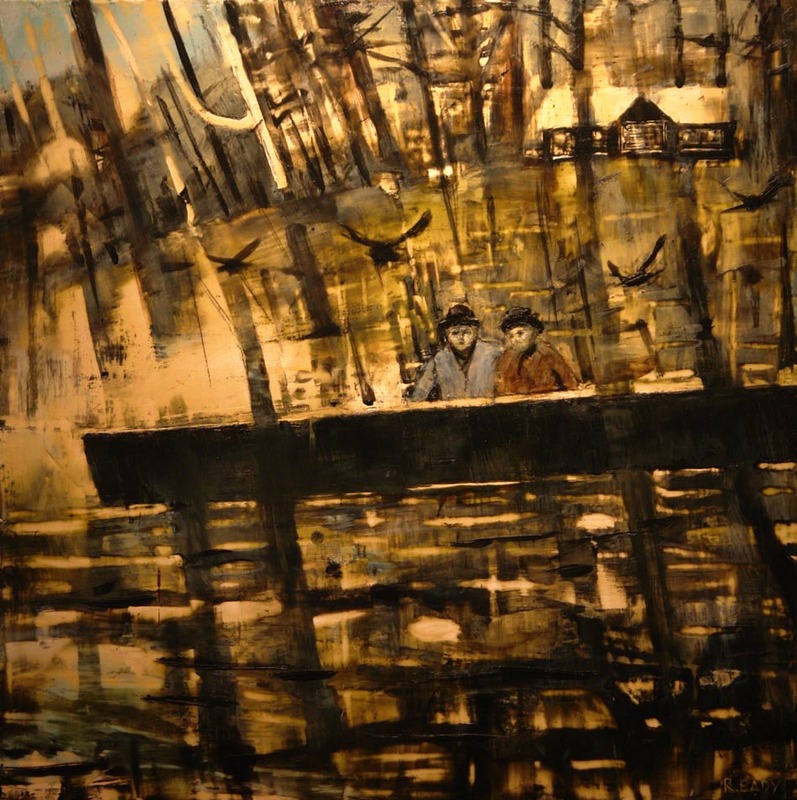 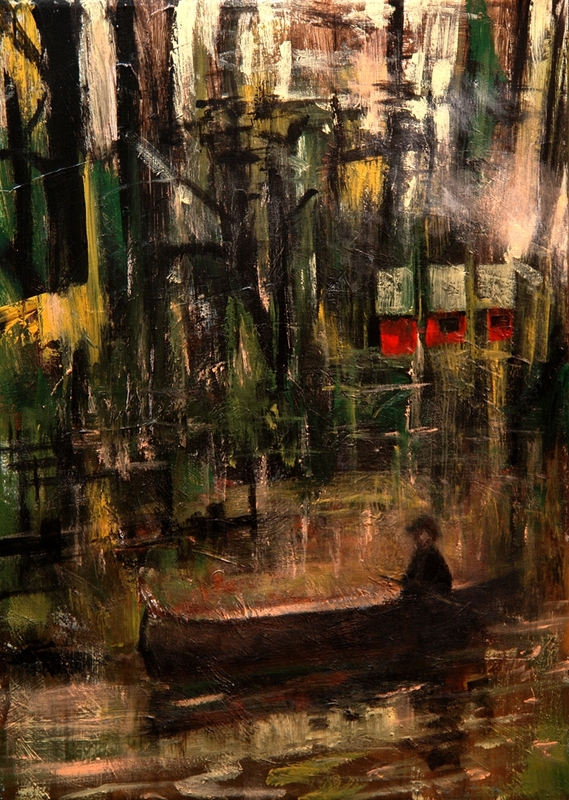 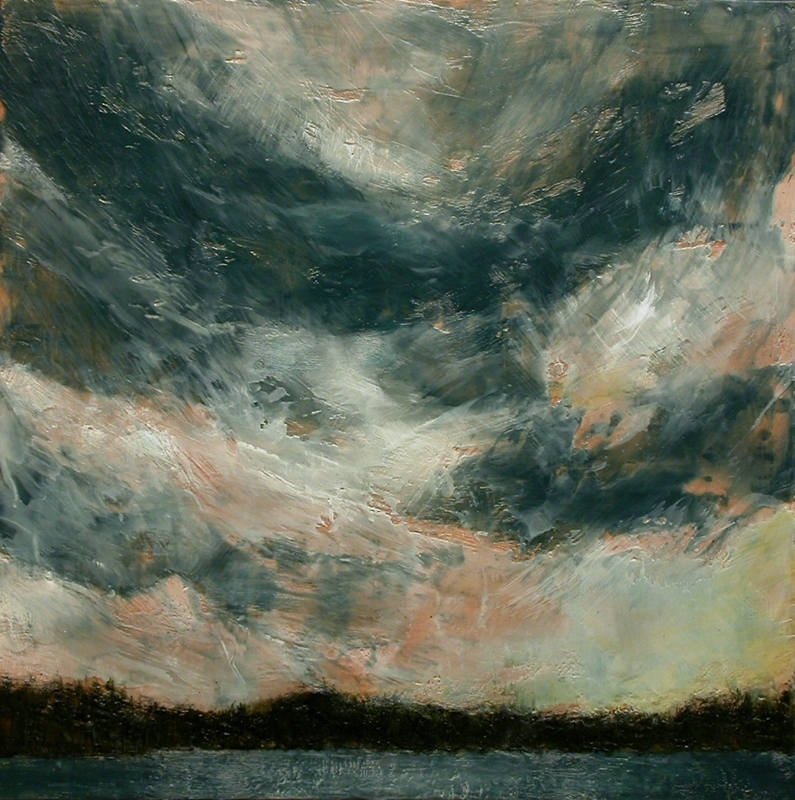 Destination Rosseau 2014, encaustic on panel, 36 x 36 in. 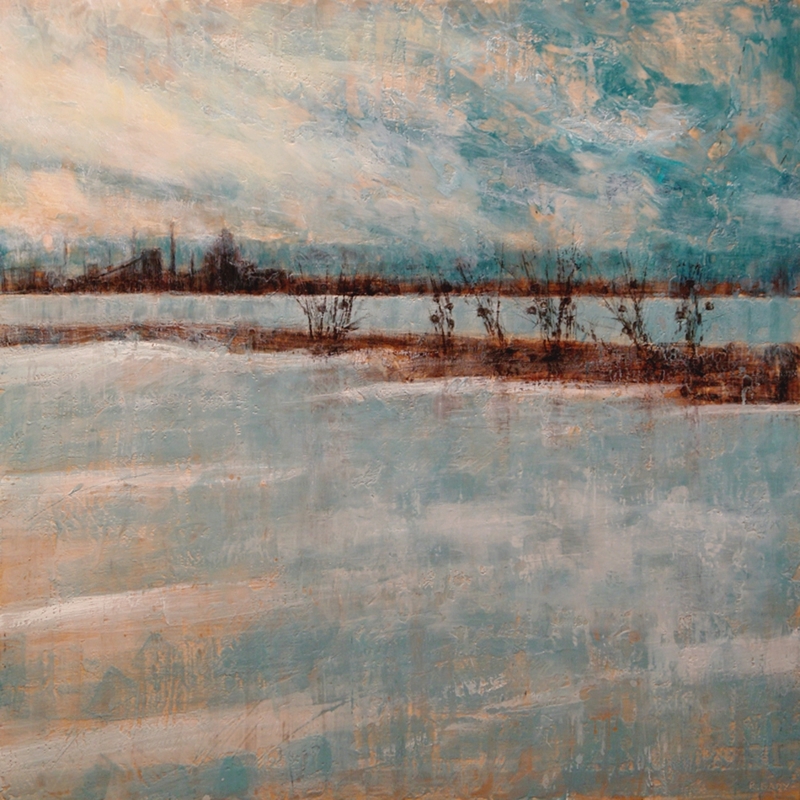 Forces of Nature 2, 2014, encaustic on panel, 36 x 78 in. 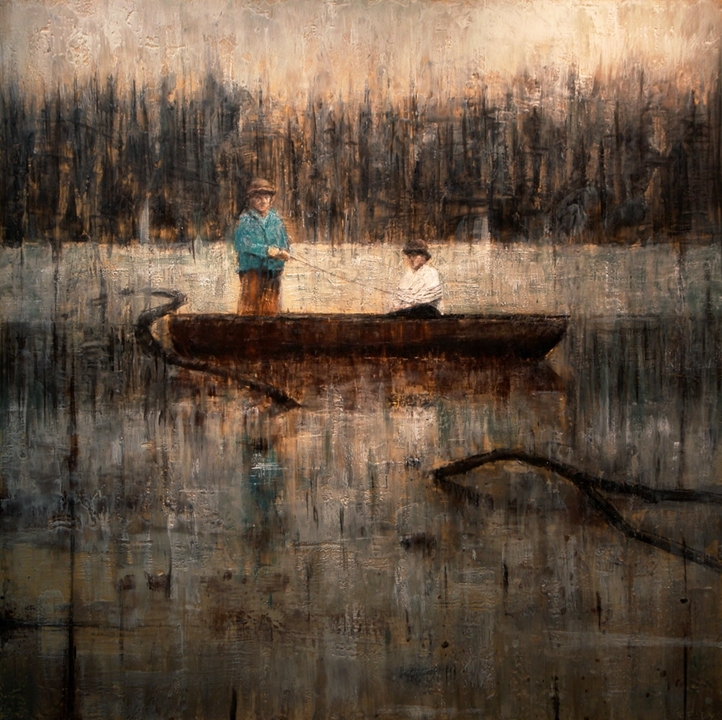 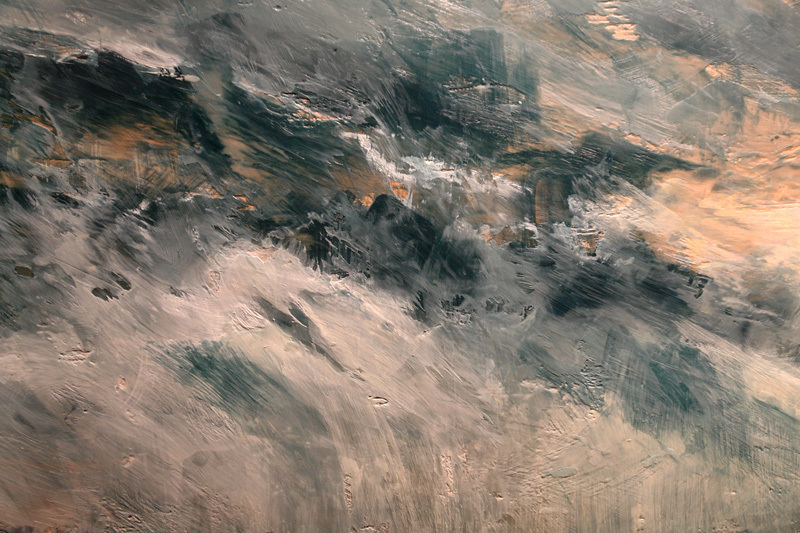 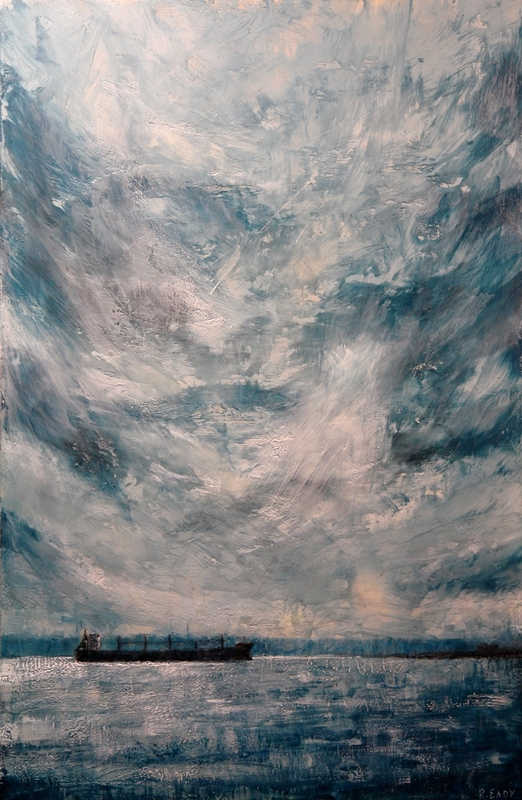 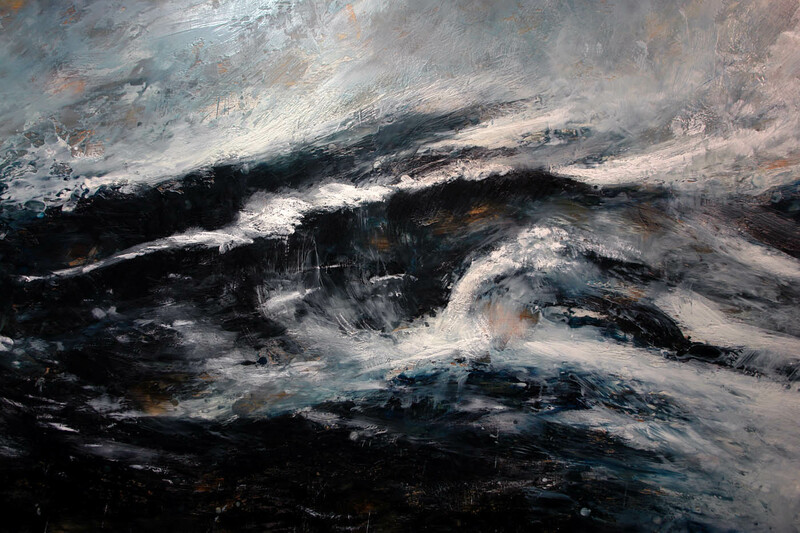 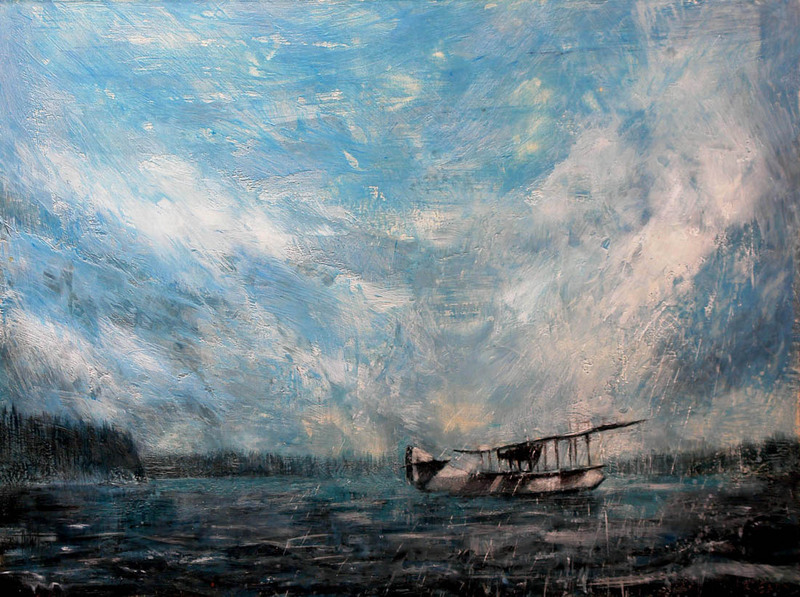 Into the Storm, 2014, oil on copper, 36 x 48 in. 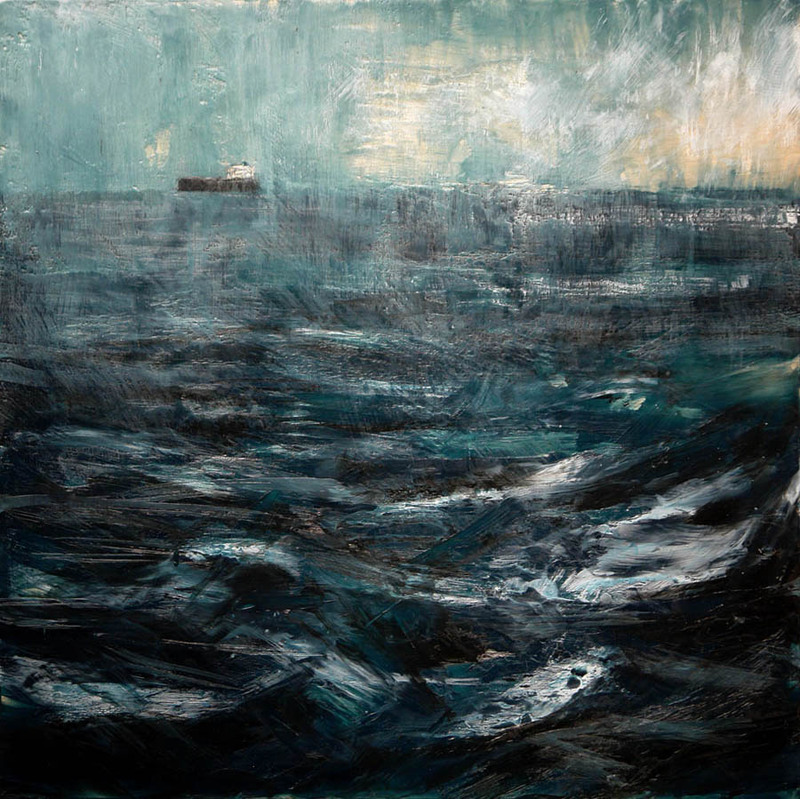 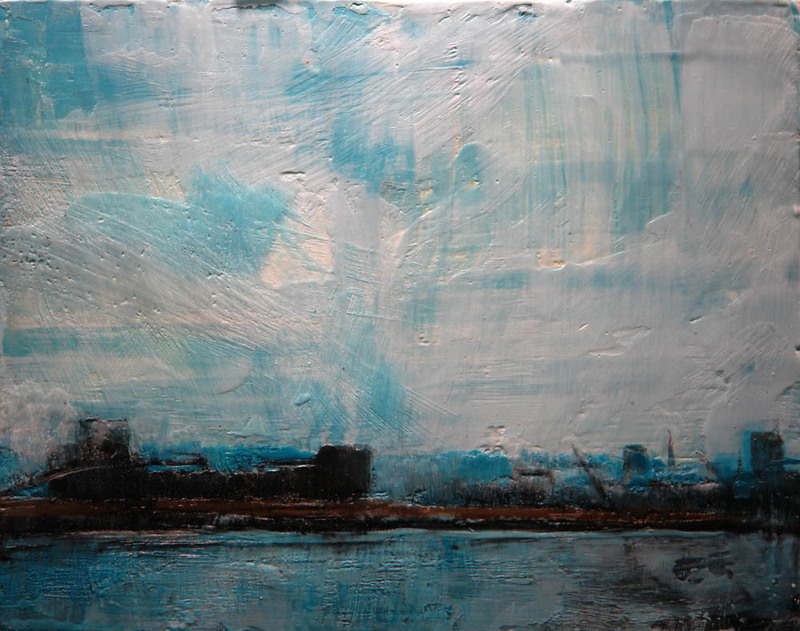 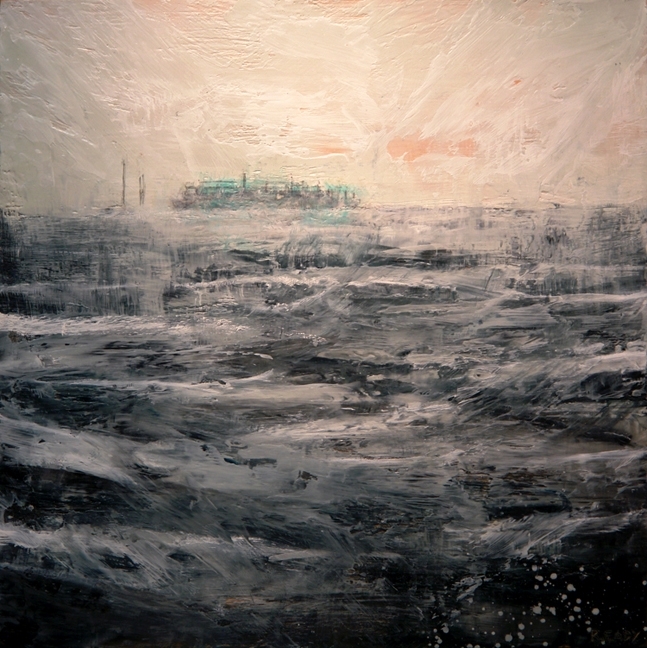 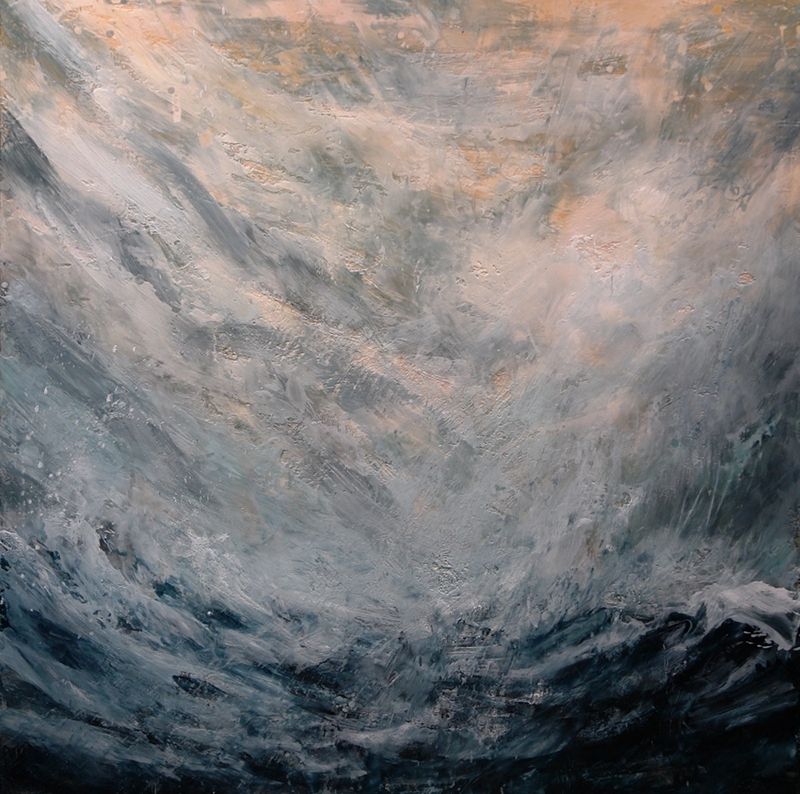 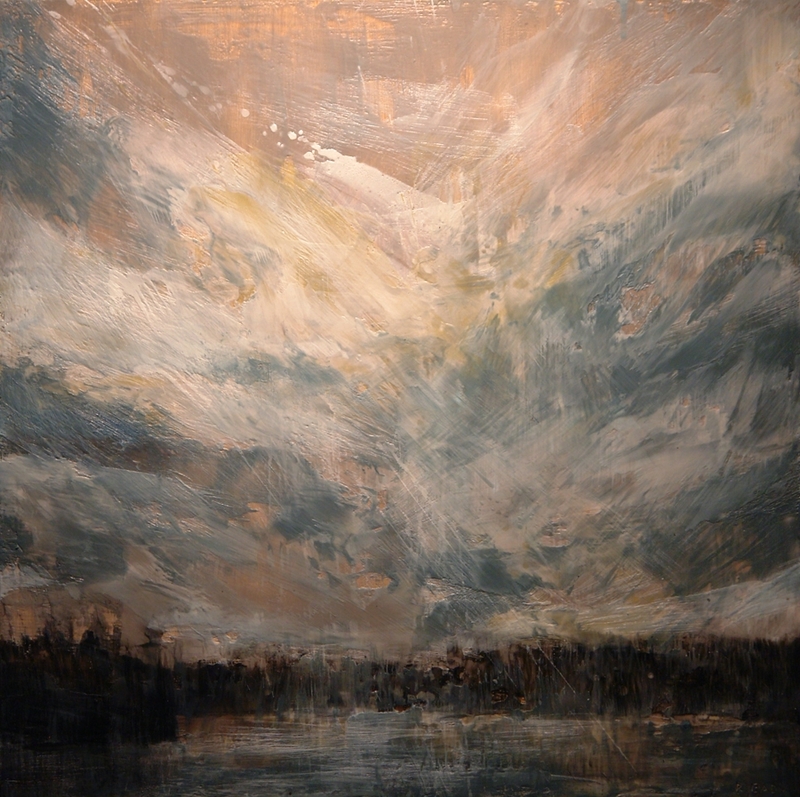 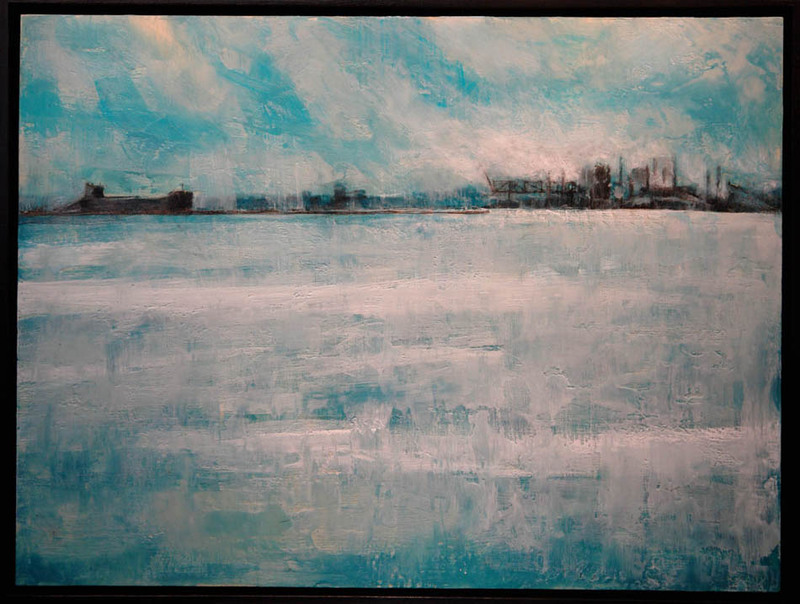 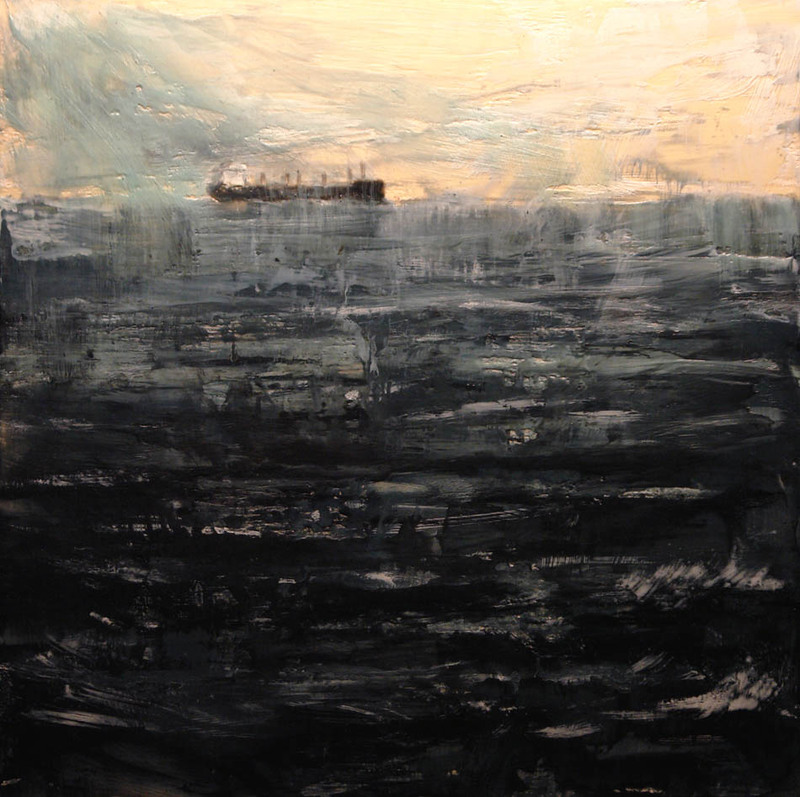 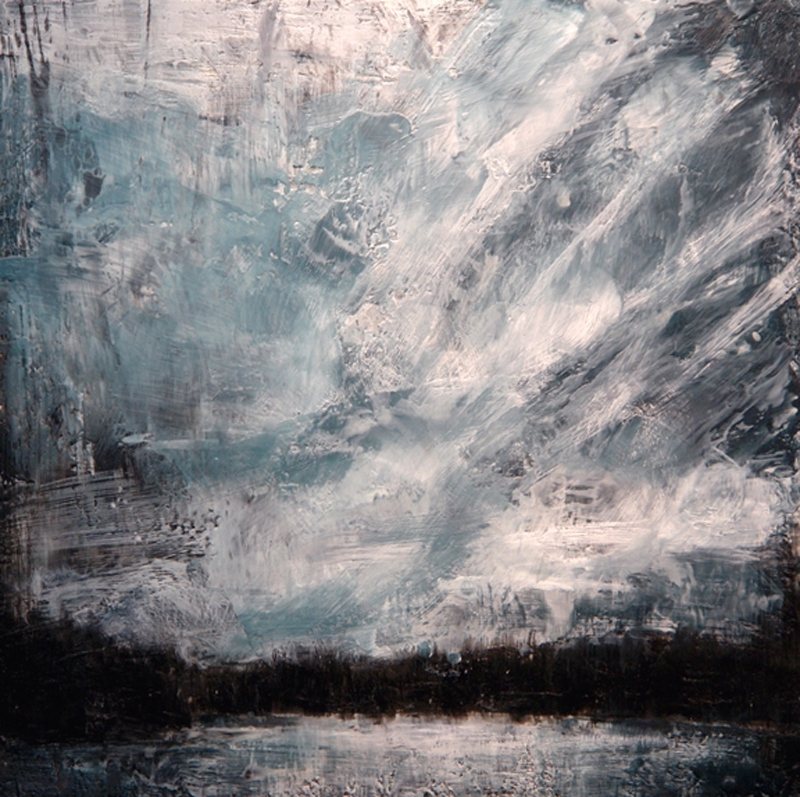 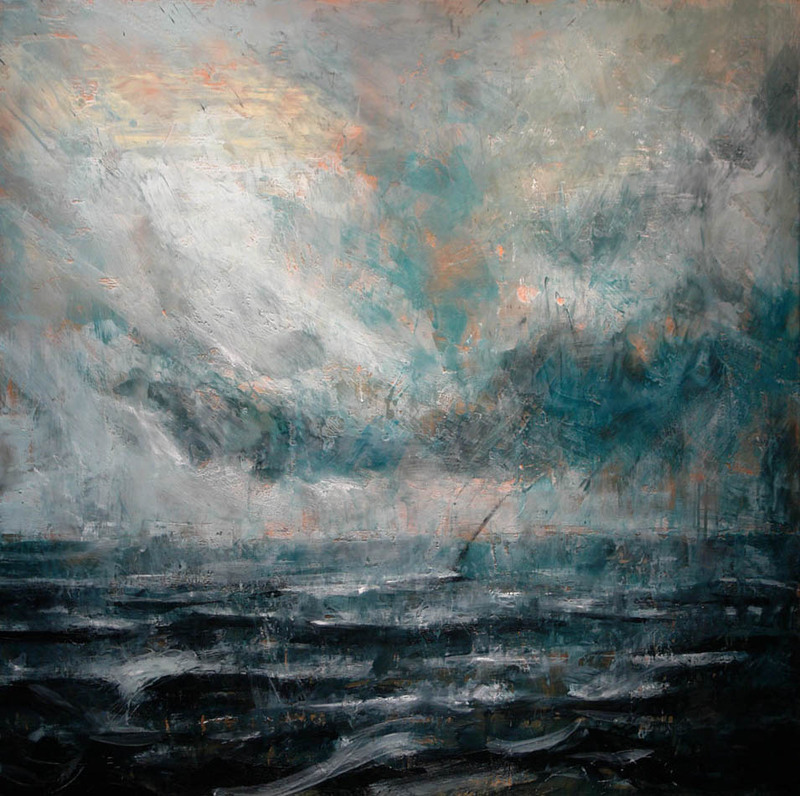 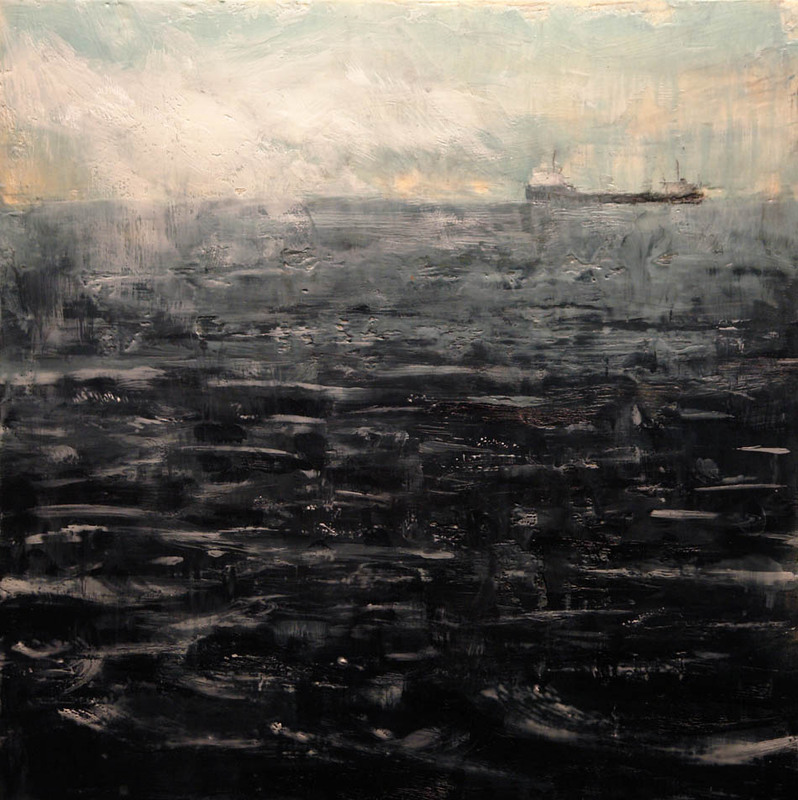 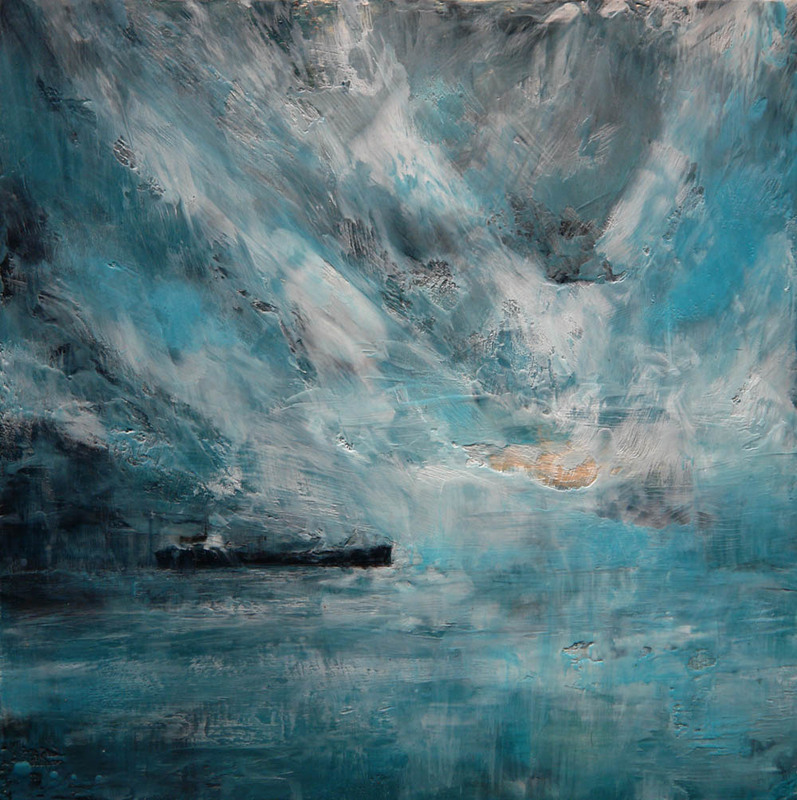 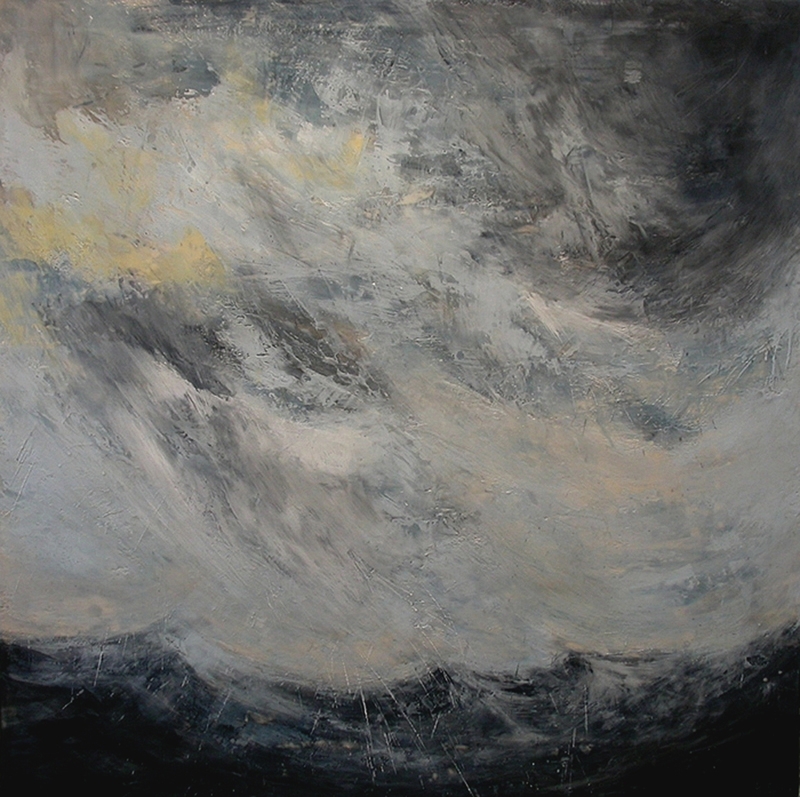 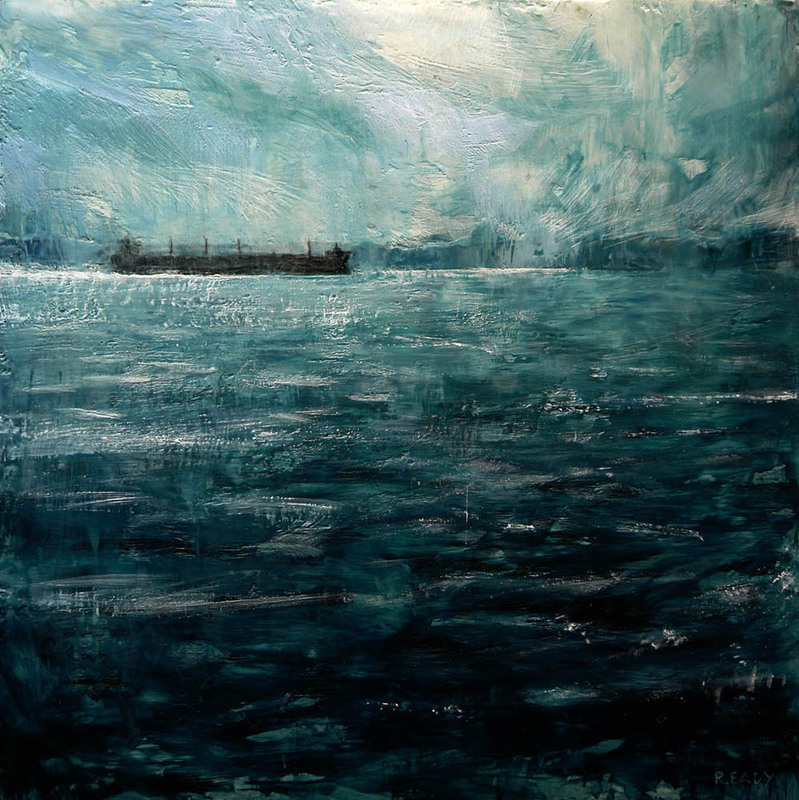 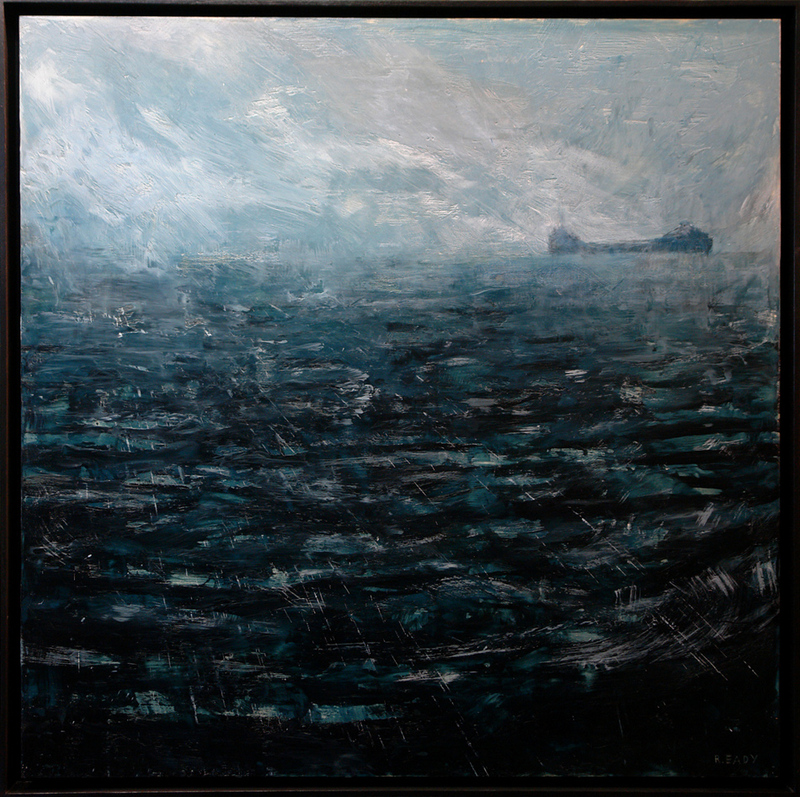 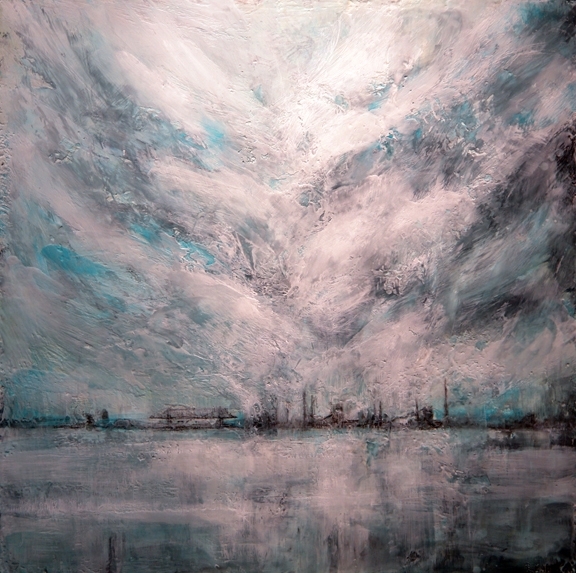 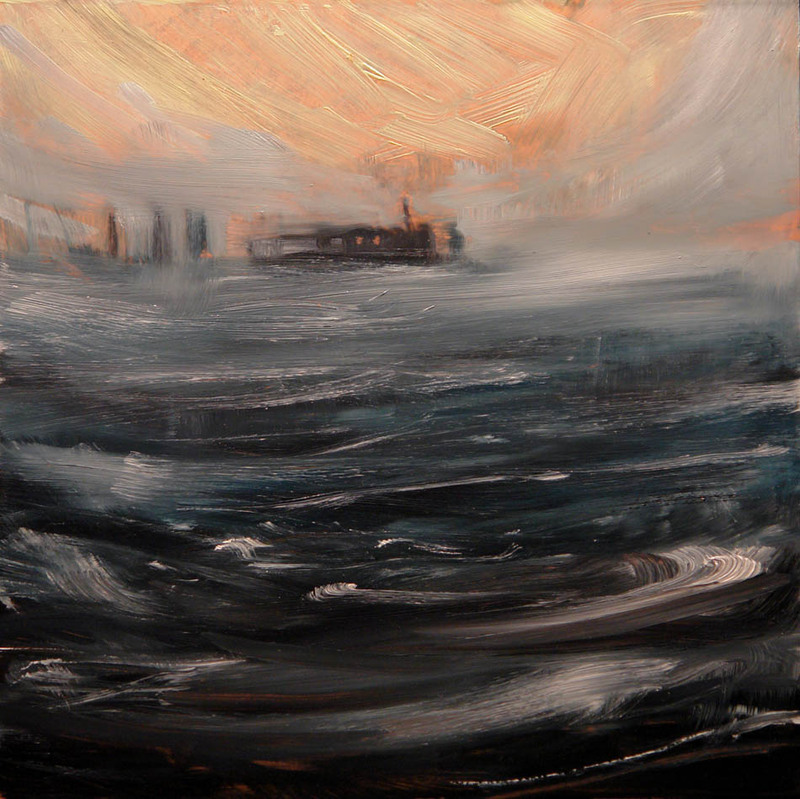 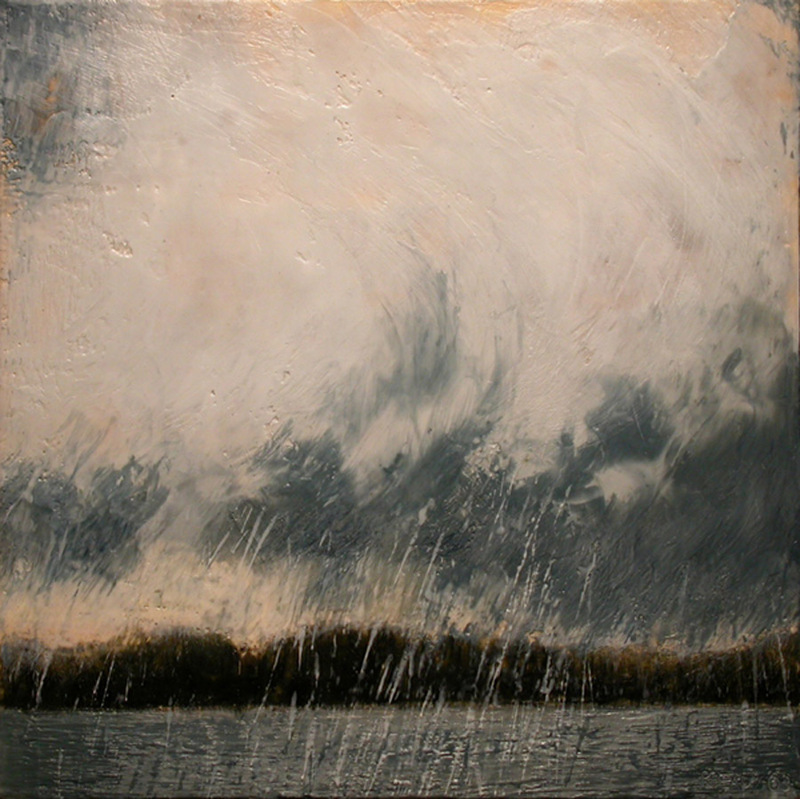 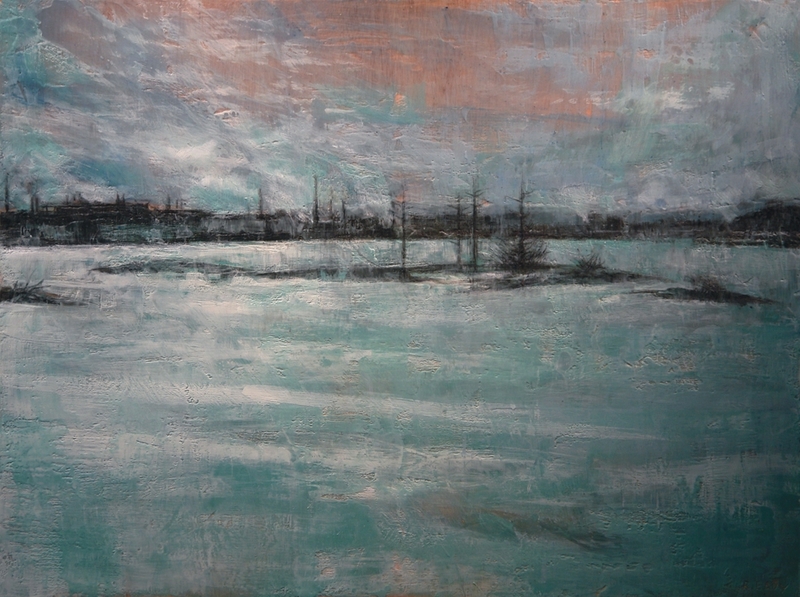 Lake Effect 2, 2013, encaustic on panel, 48 x 48 in. 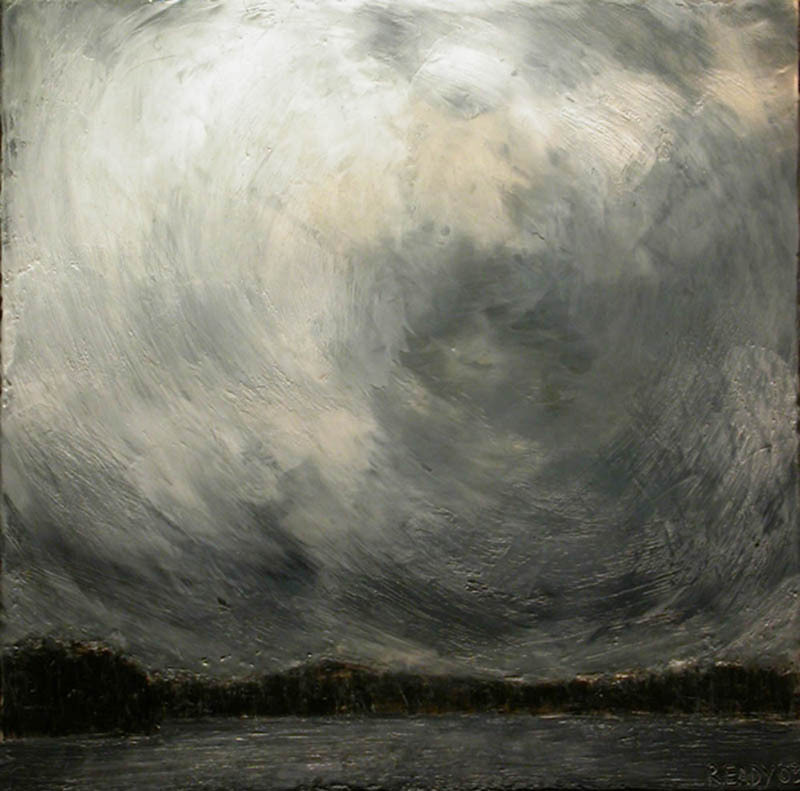 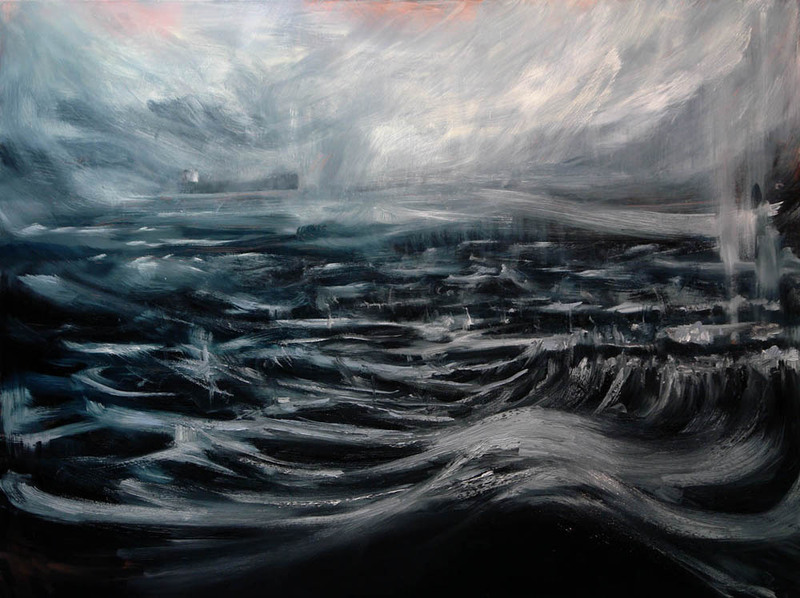 Forces of Nature 1, 2011, encaustic on panel, 48 x 48 in. 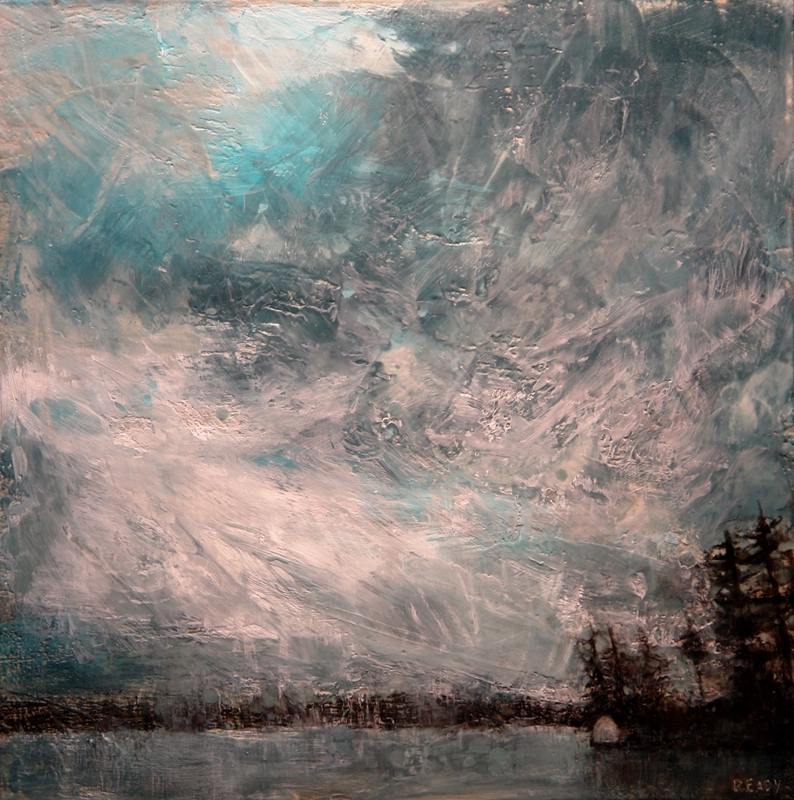 Rosseau North, encaustic on canvas, 48 x 48 in SOLD. 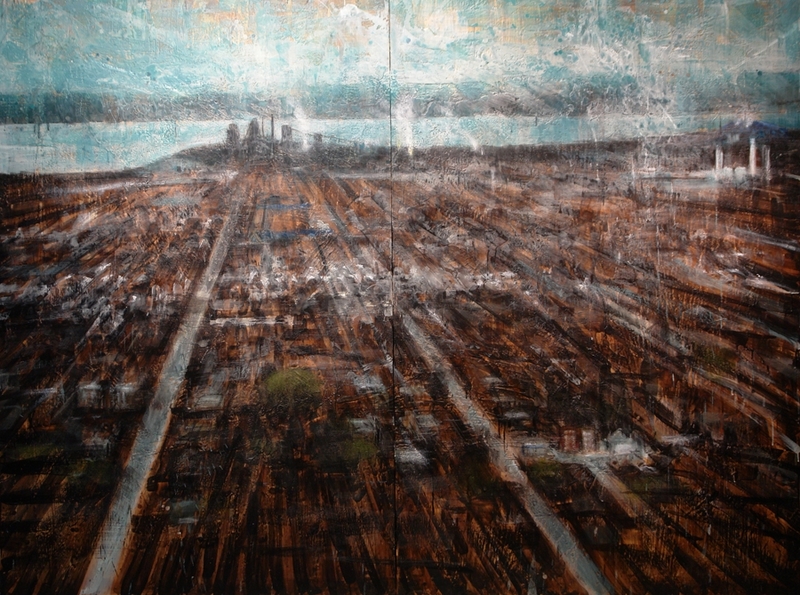 View from 602, 2013, encaustic on panel, 48 x 70 in. 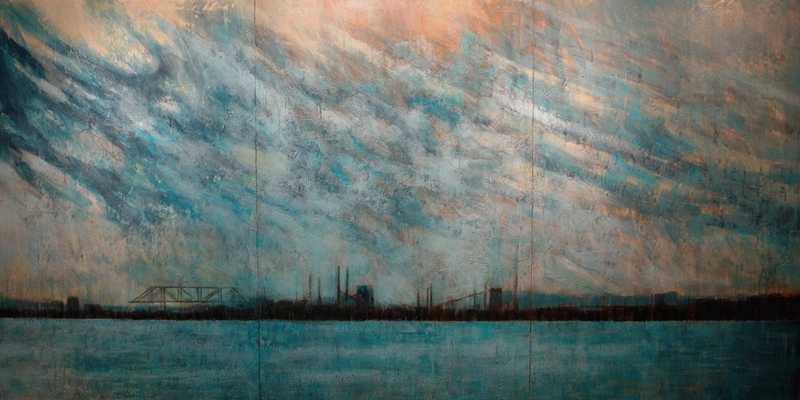 The Other Side of Paradise, (2013) encaustic on panel, 48 x 70 in. 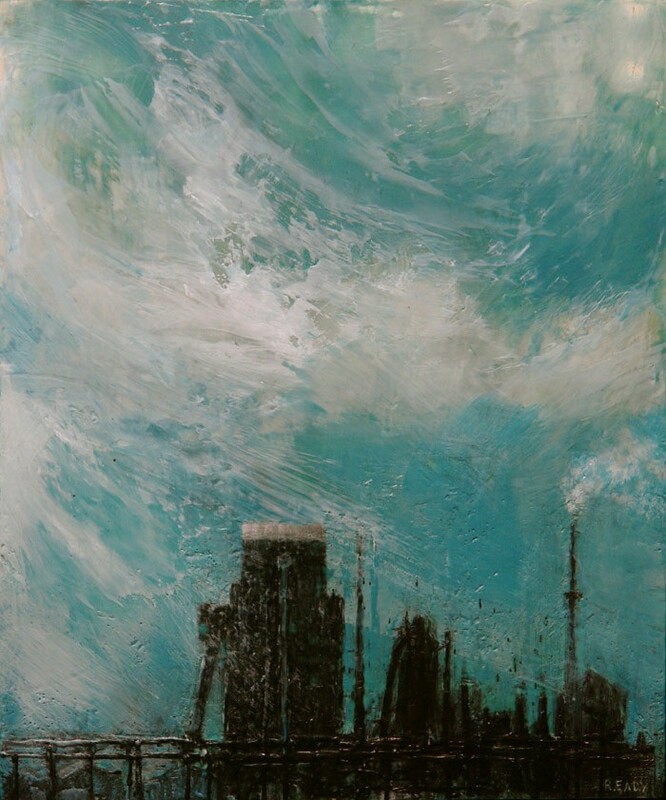 Plant Effects 1, 2011, encaustic on panel, 24 x 24 in. 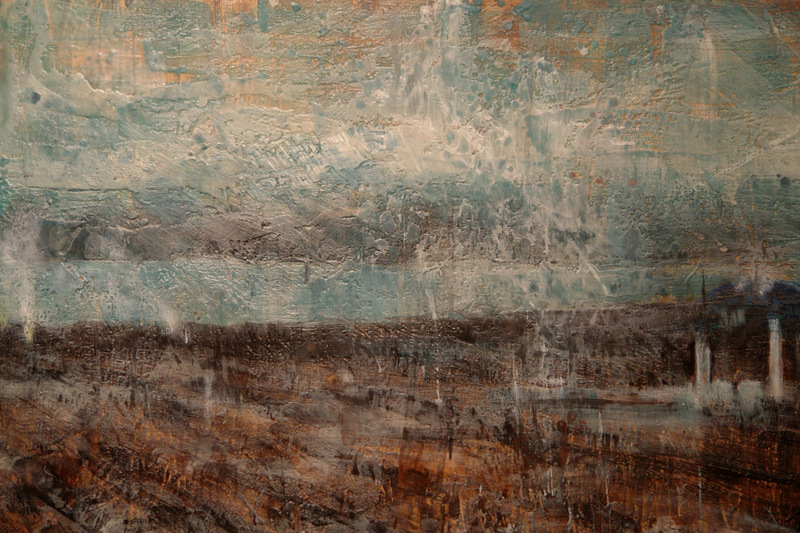 Overcast, 2009, encaustic on panel, 72 x 144 in. 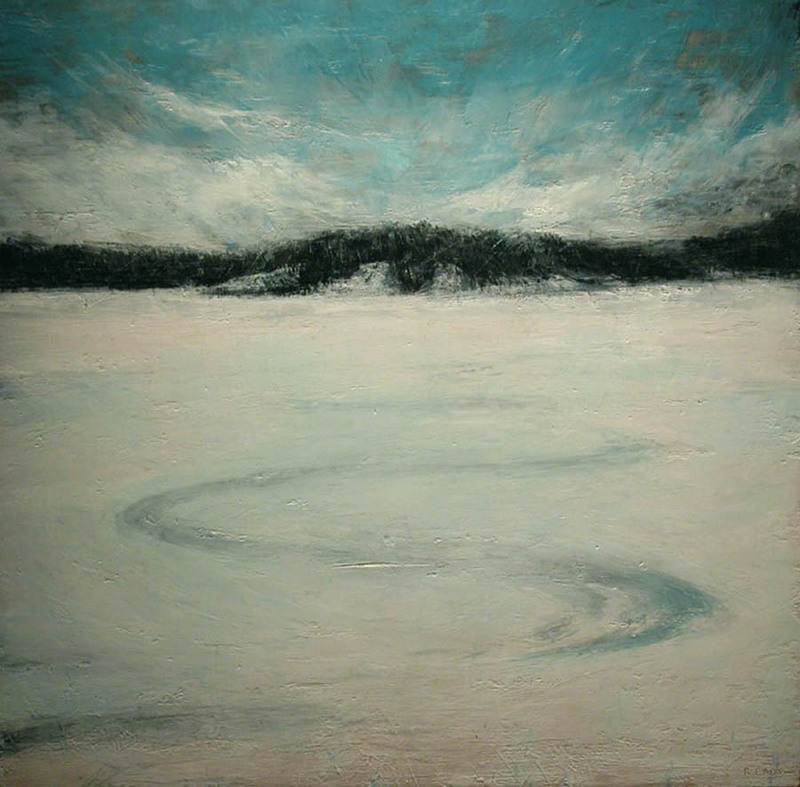 End of the Road, 2009, encaustic on panel, 72 x 96 in. 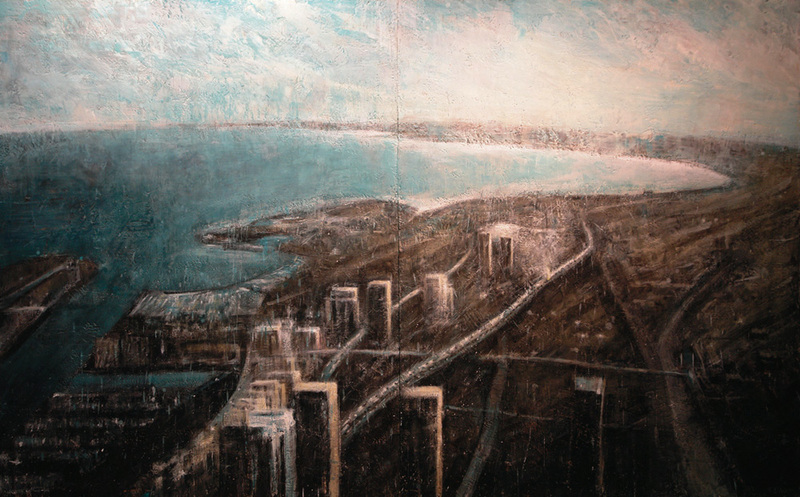 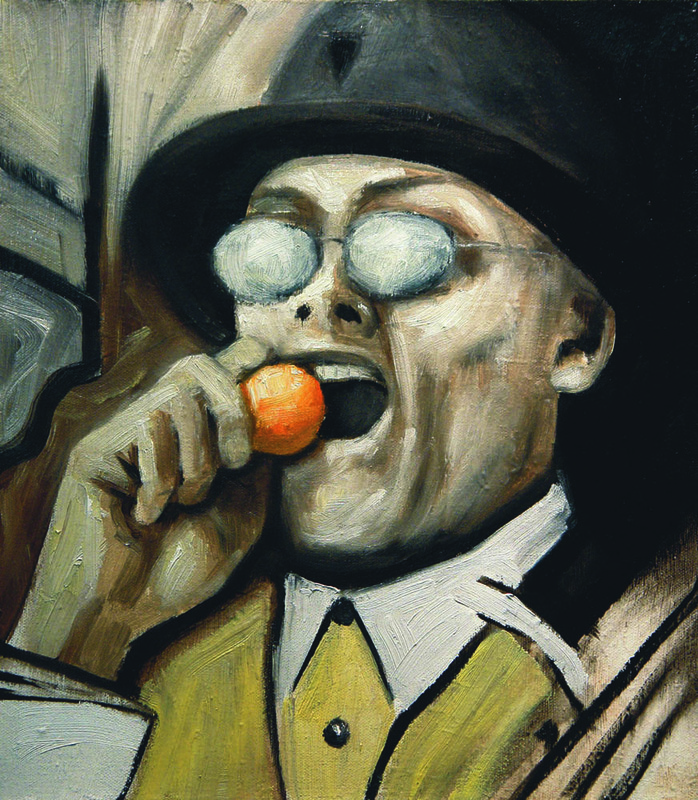 Gardiner of Delights, 2010, encaustic on panel, 60 x 96 in. 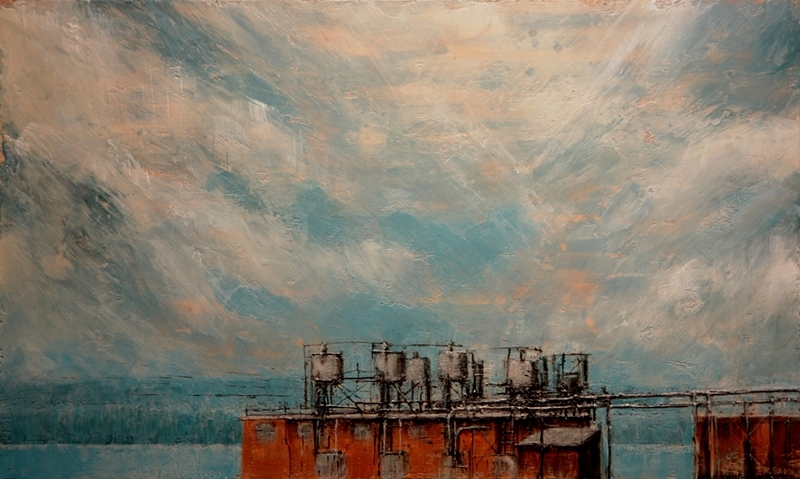 Imposing Elements, 2009, encaustic on panel, 72 x 48 in. 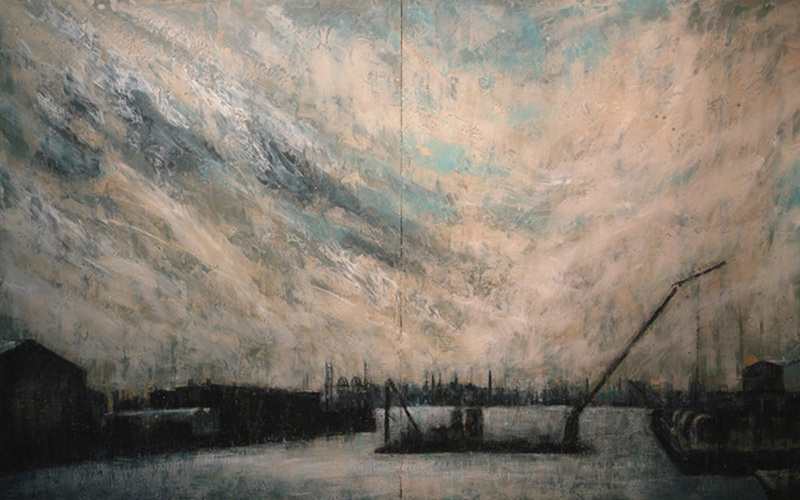 Double Cross, 2009, encaustic on panel, 70 x 96 in. 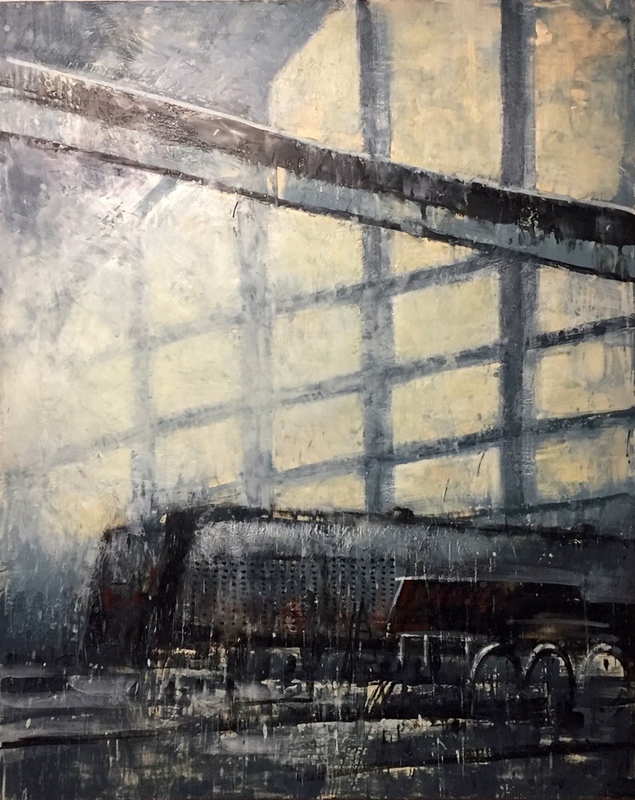 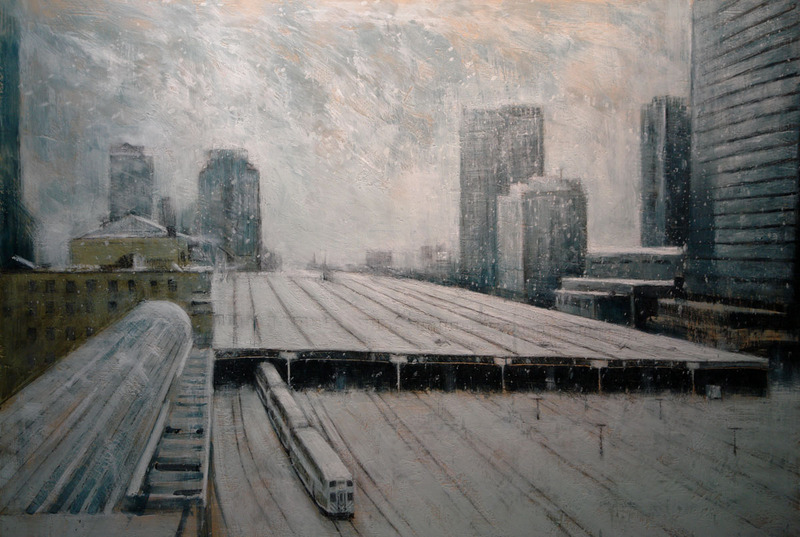 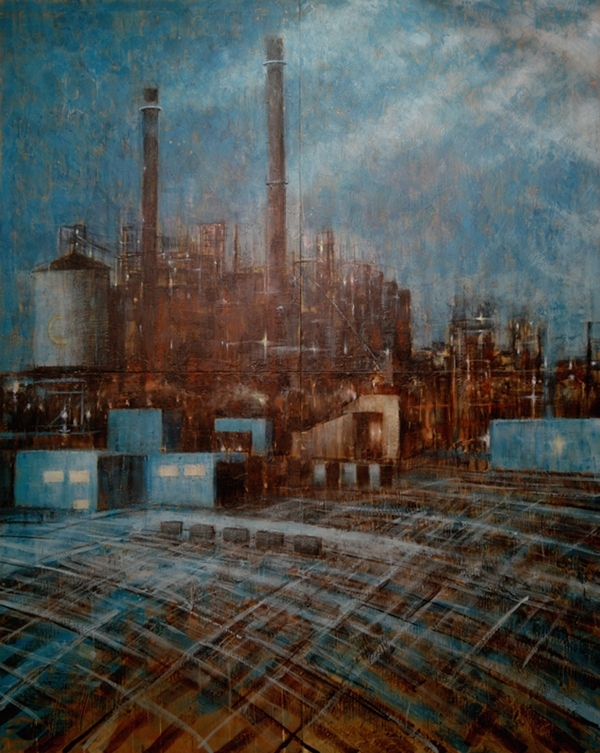 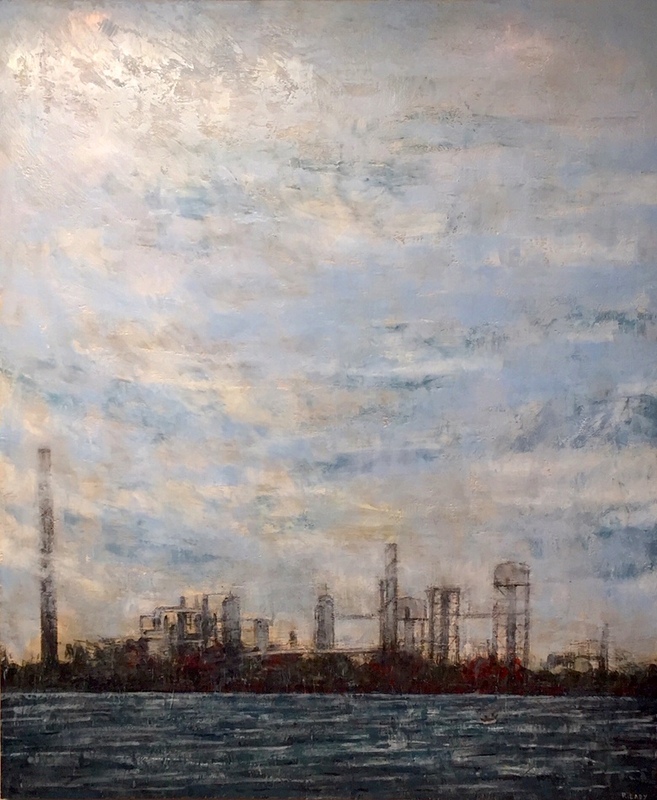 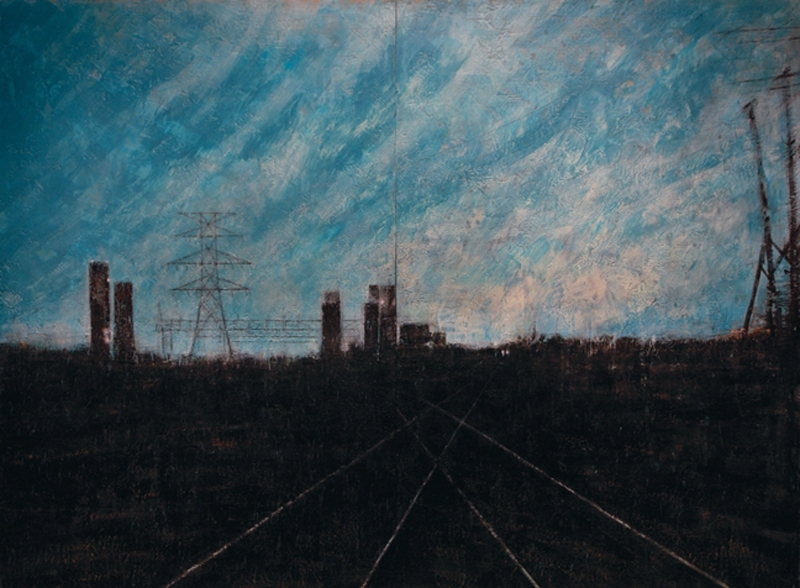 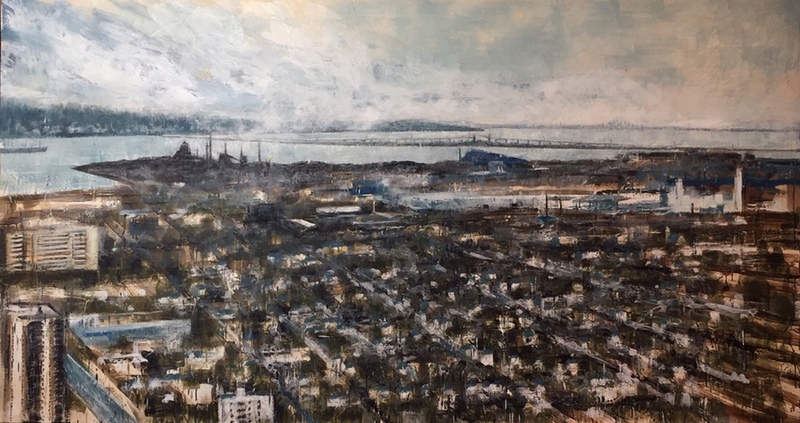 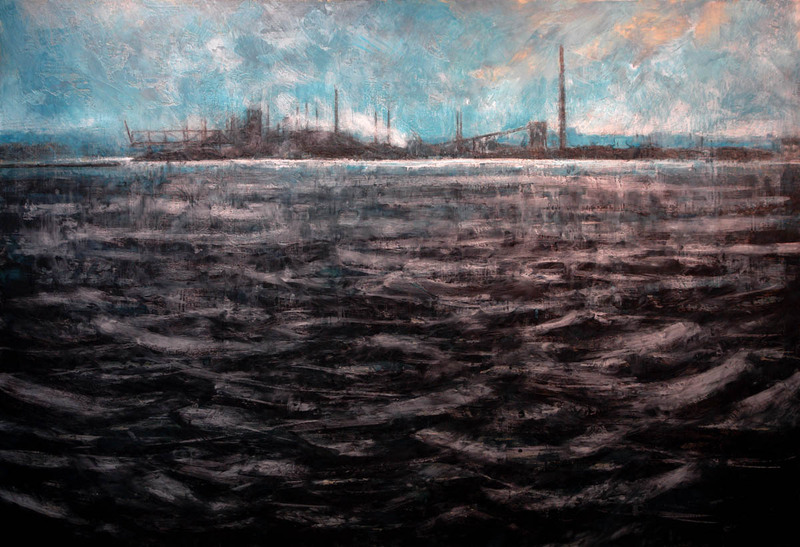 Keihin Industrial Zone, 2011, encaustic on panel, 60 x 96 in. 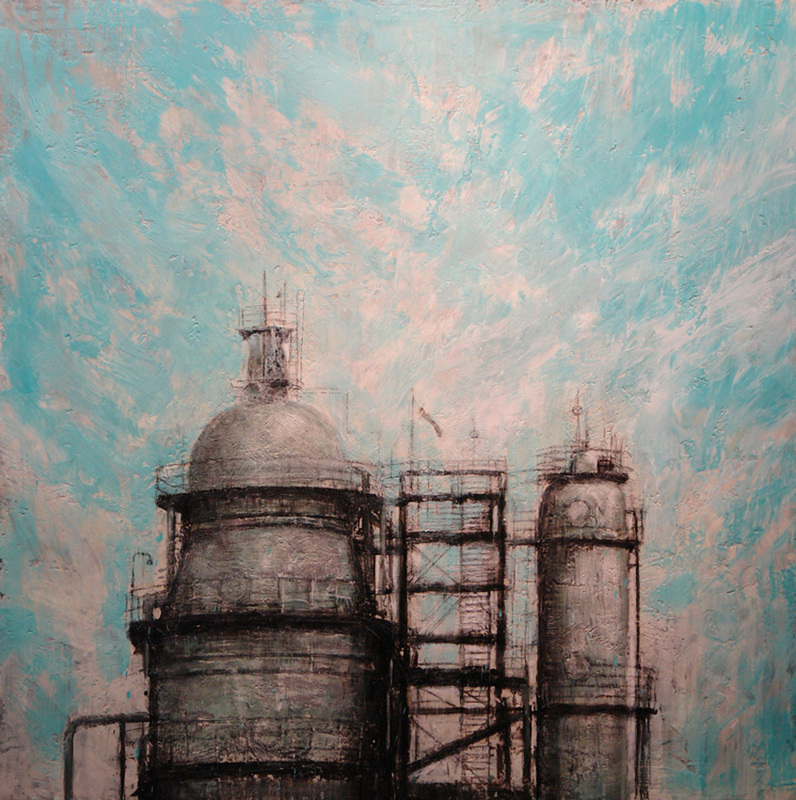 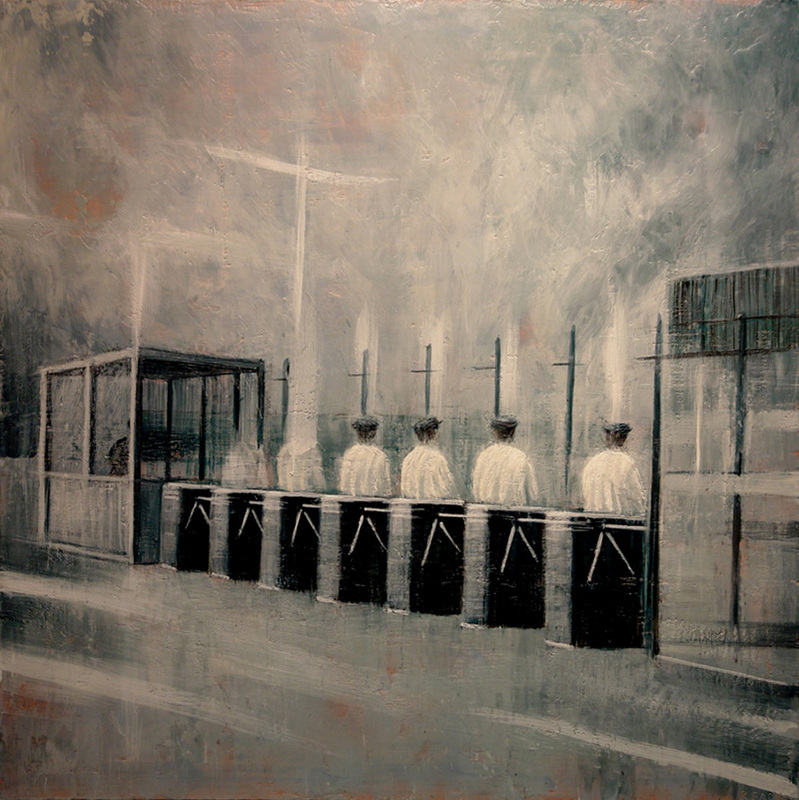 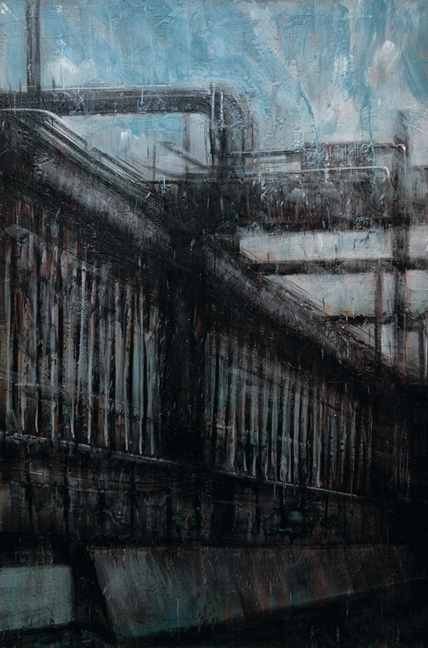 Temple of Steel, 2011, encaustic on panel, 48 x 48 in. 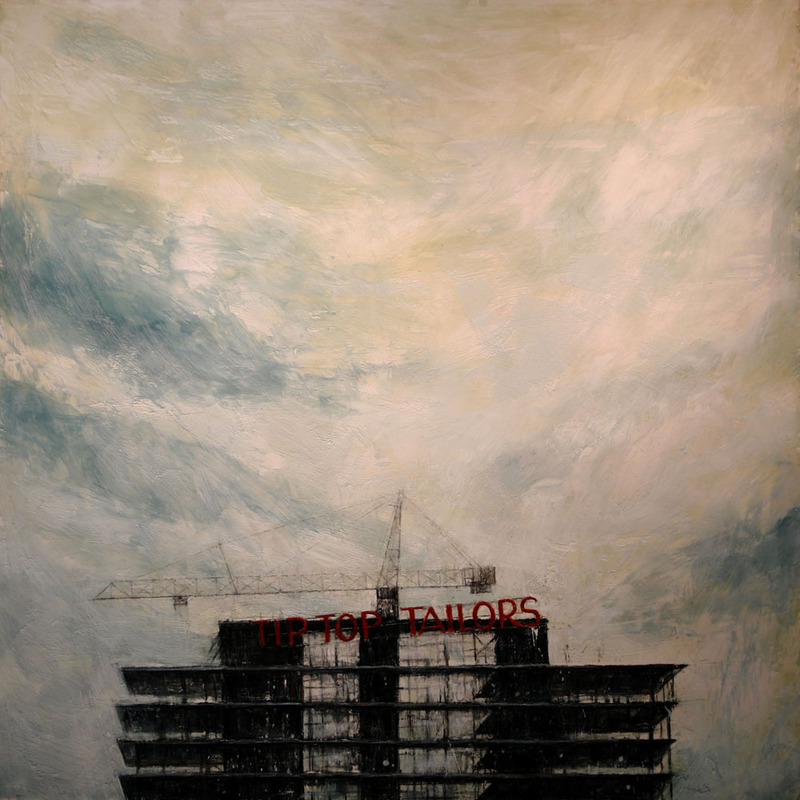 Alterations 4, 2013, encaustic on panel, 48 x 48 in. 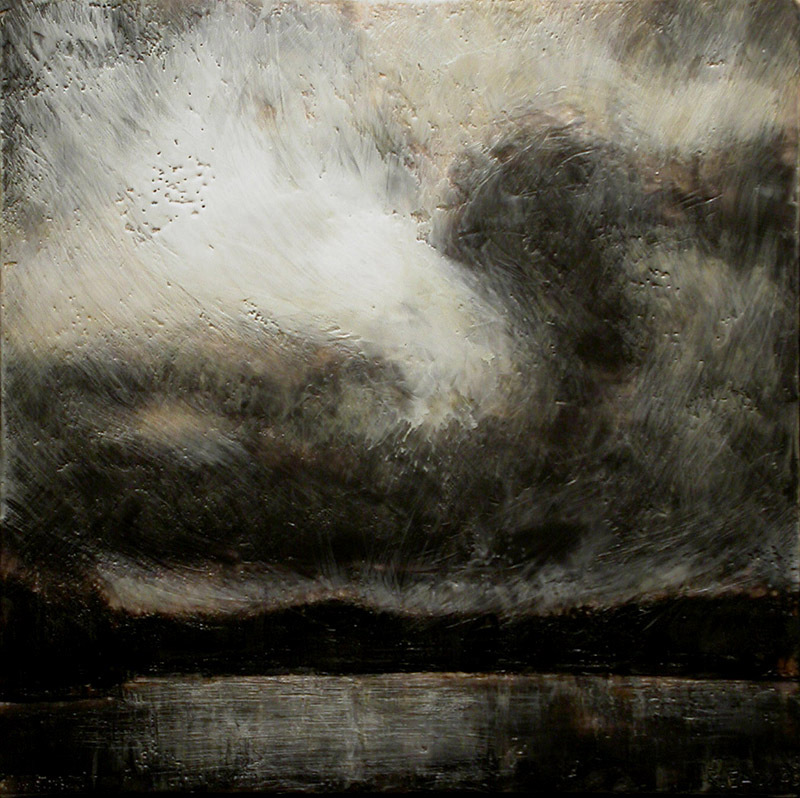 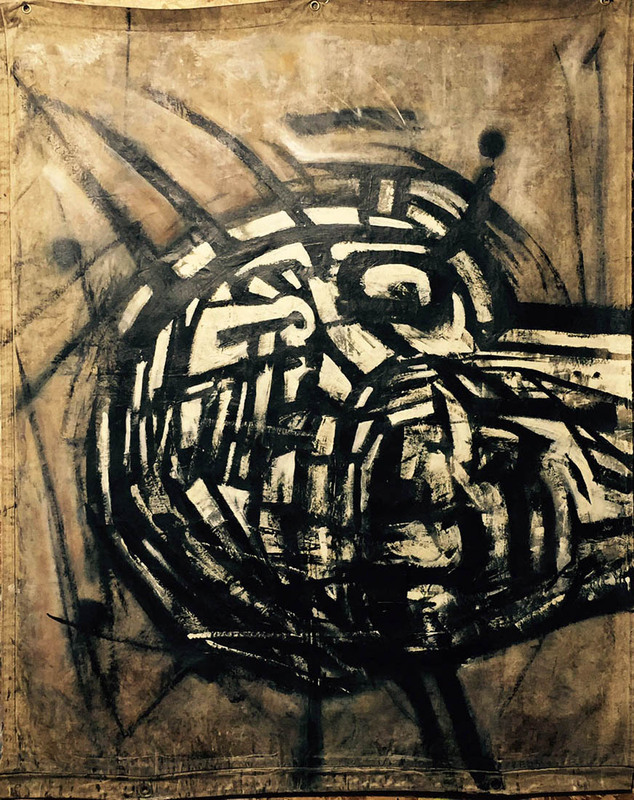 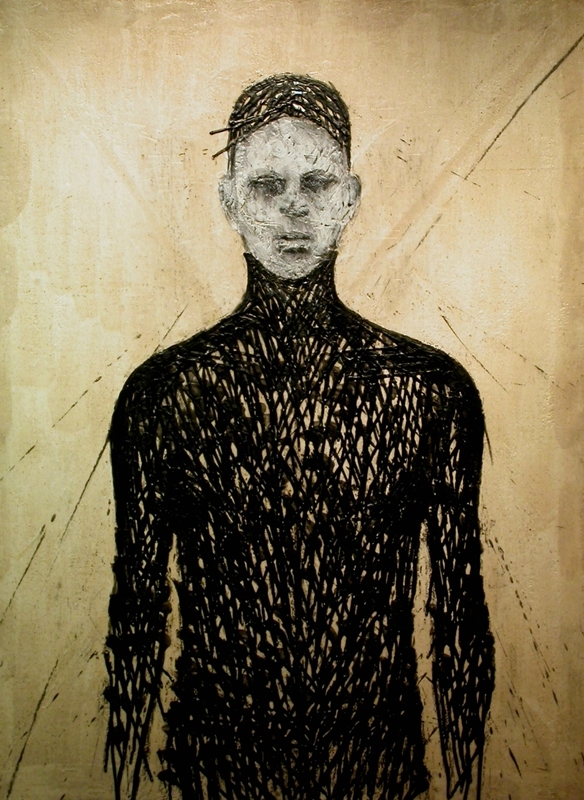 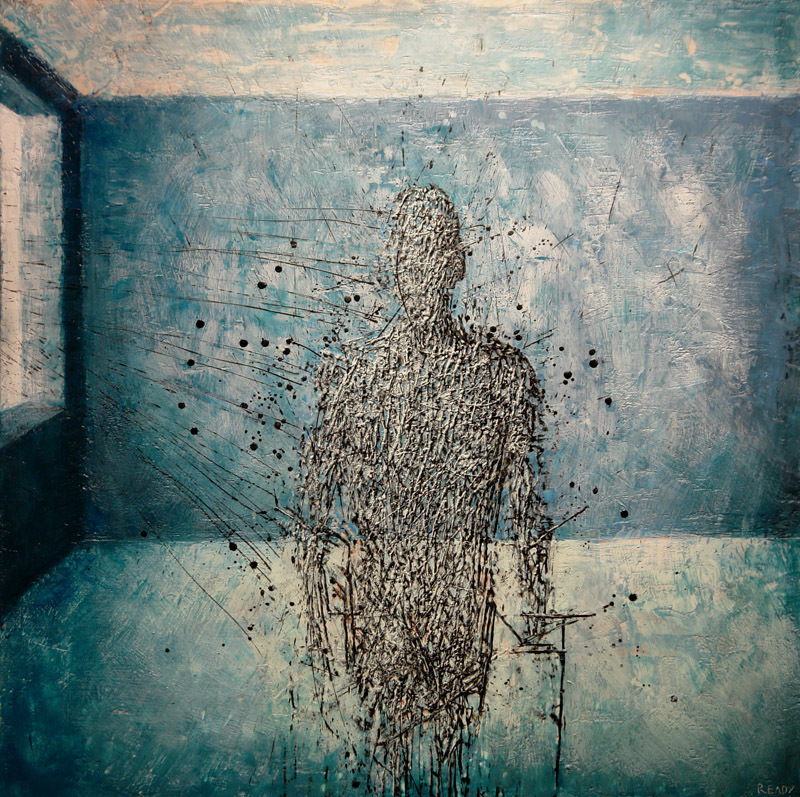 Shredder, (2012) encaustic on panel, 48 x 48 in. 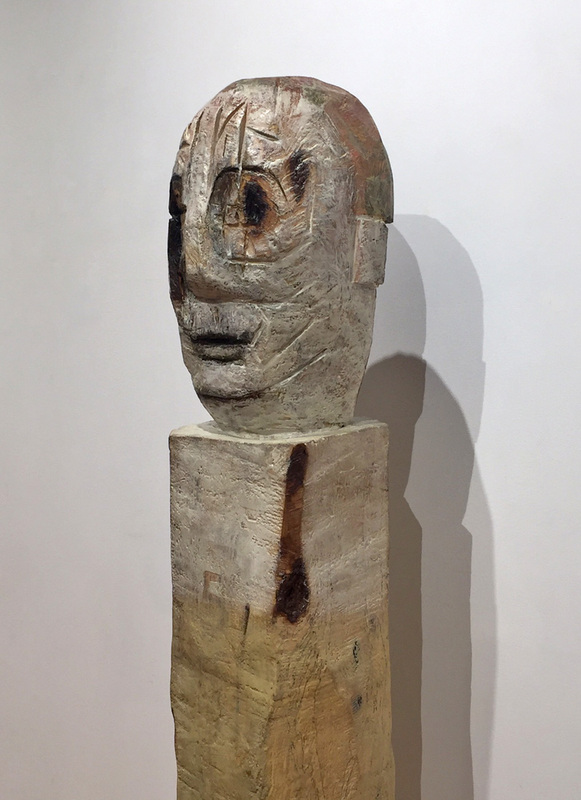 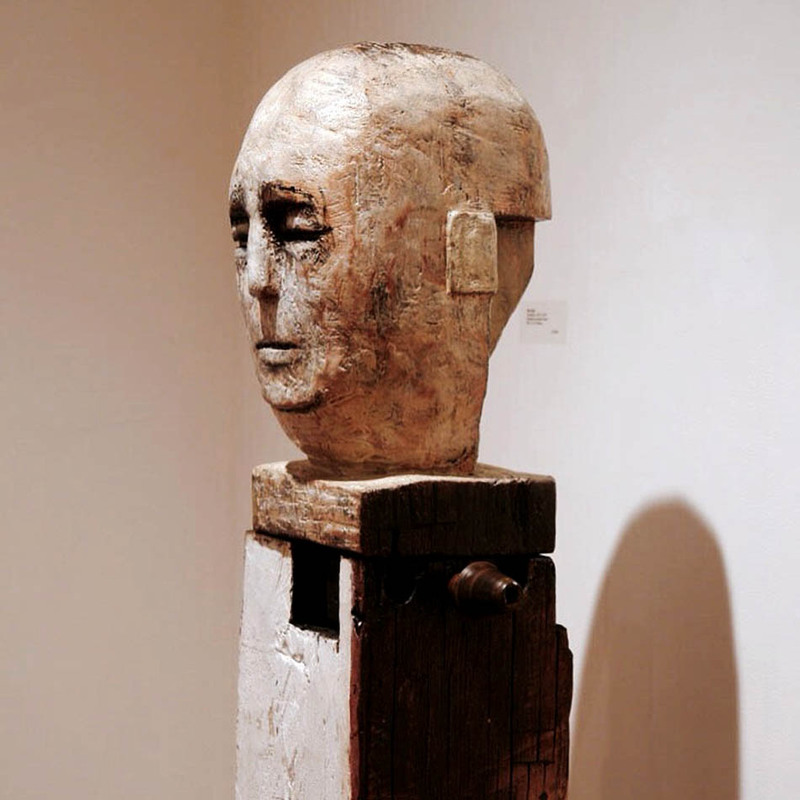 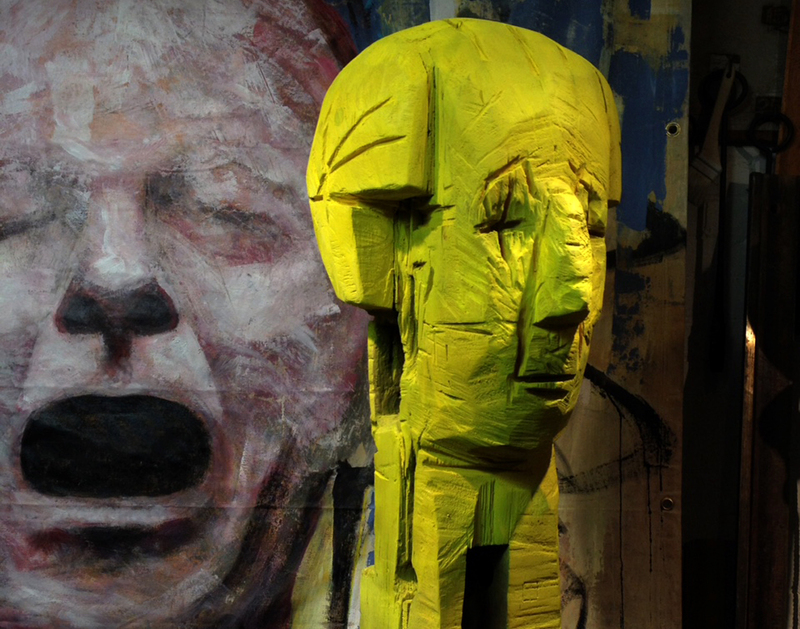 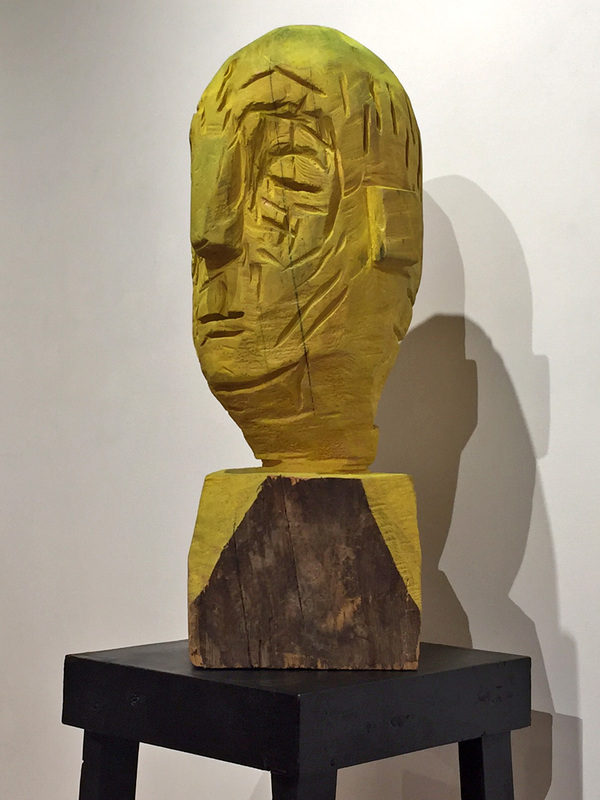 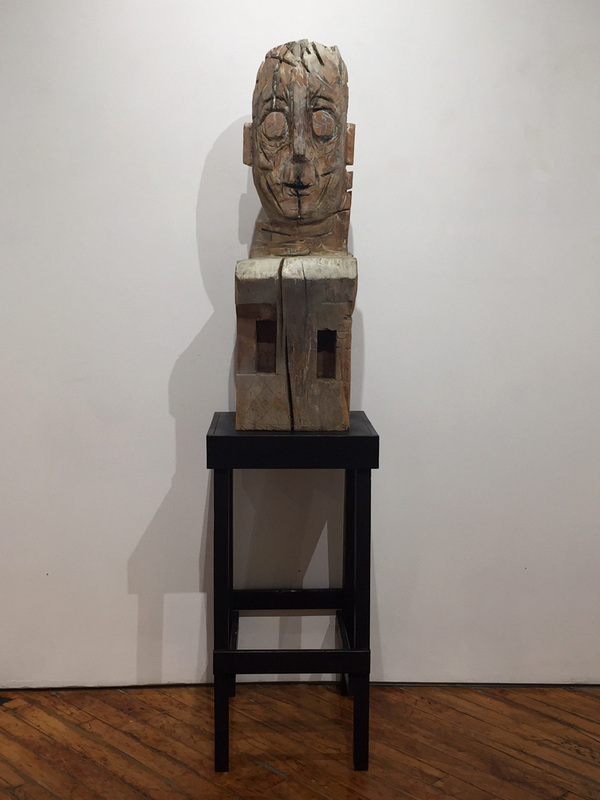 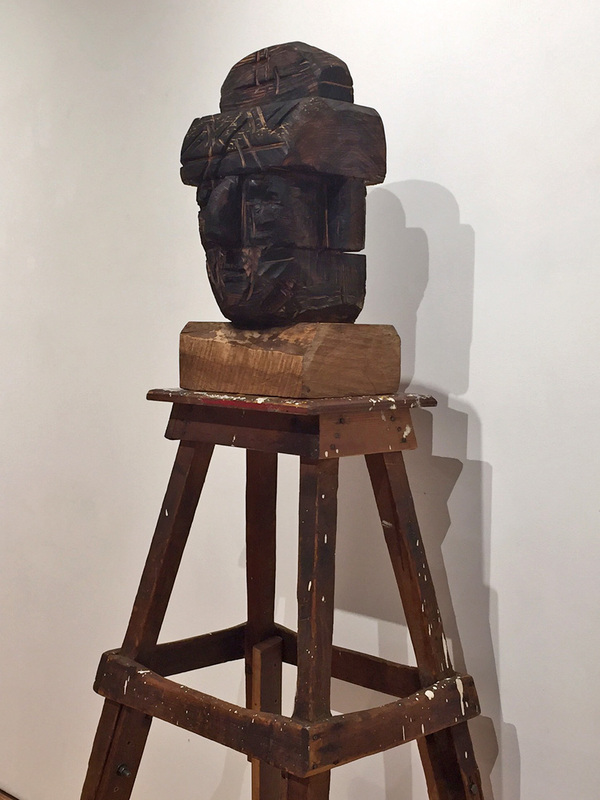 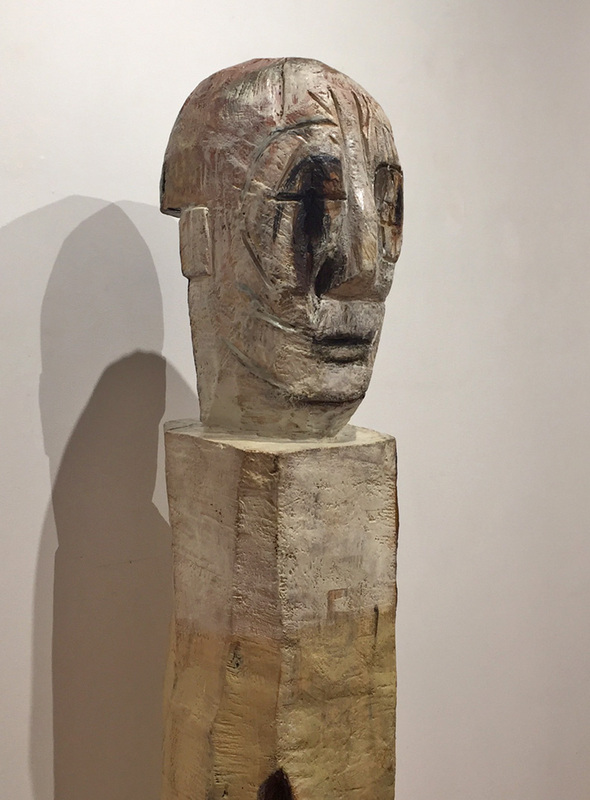 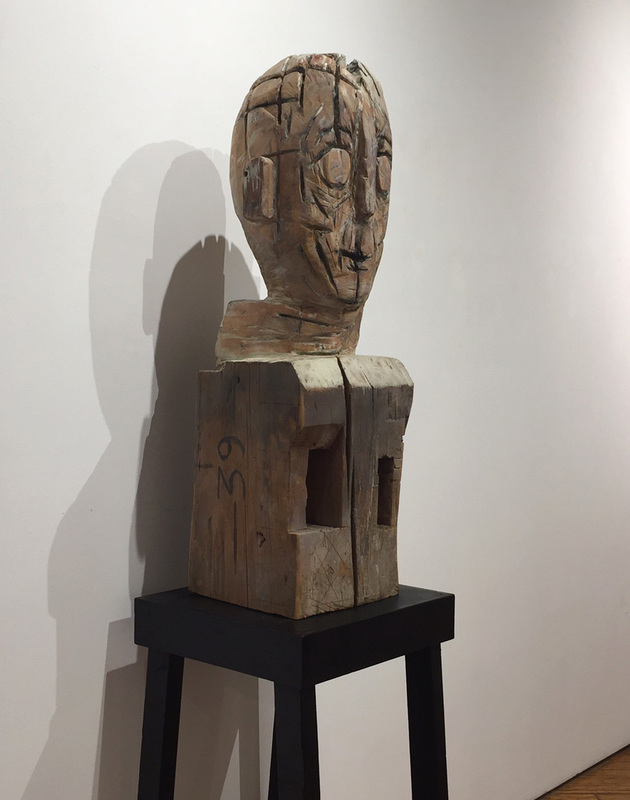 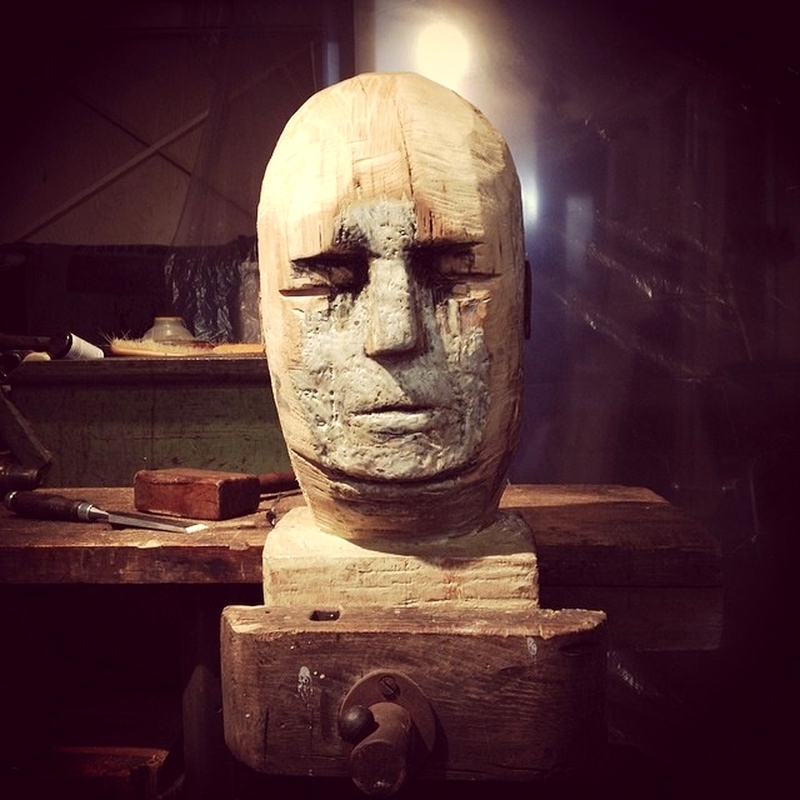 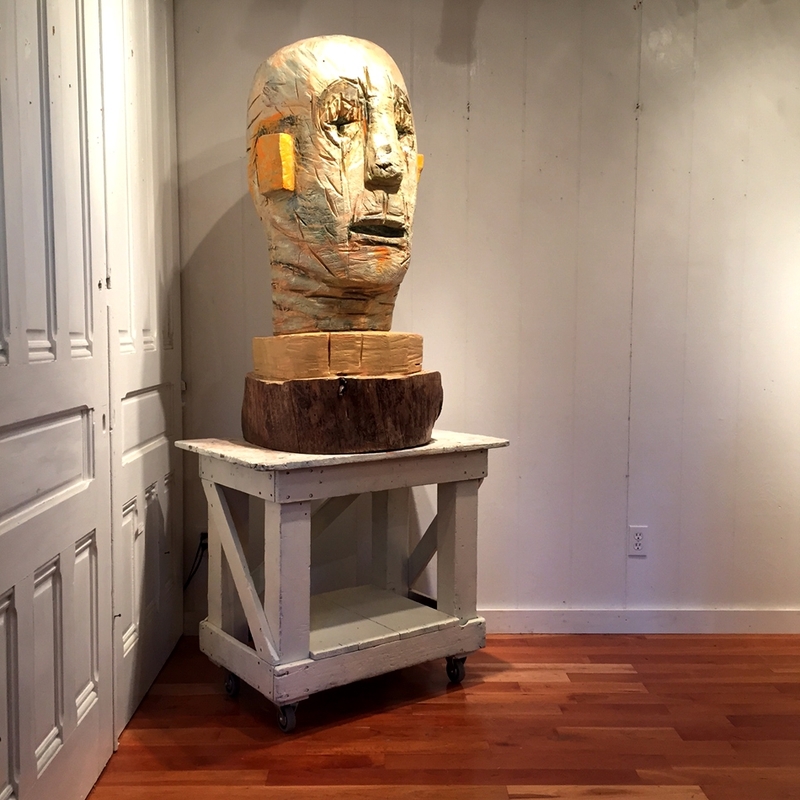 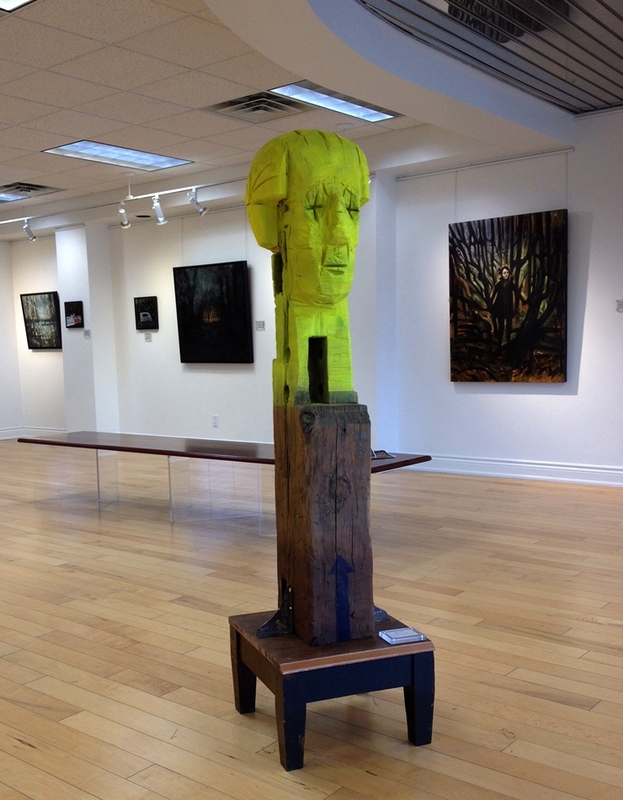 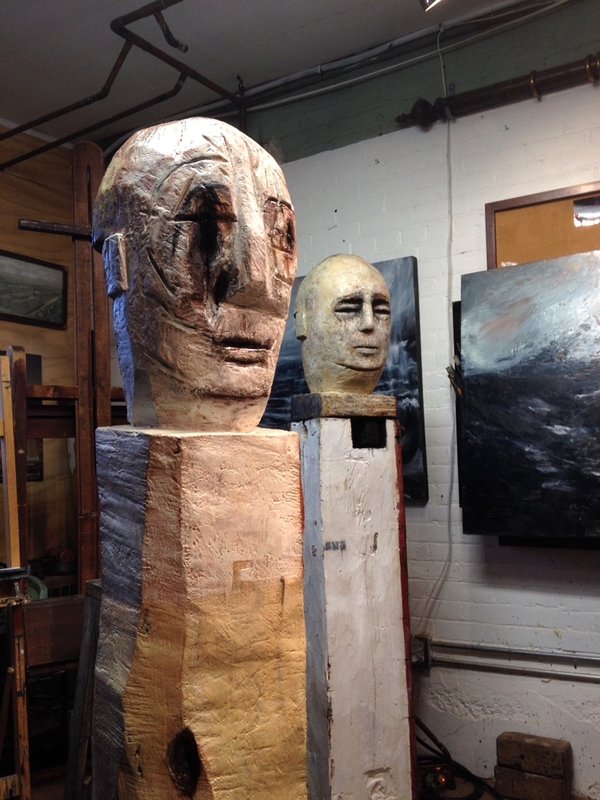 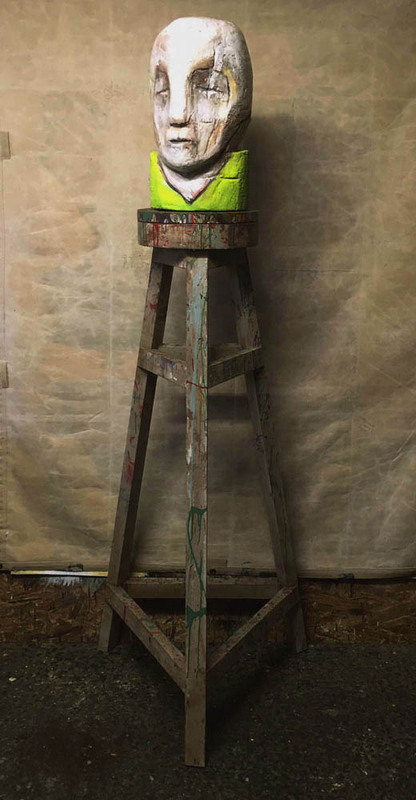 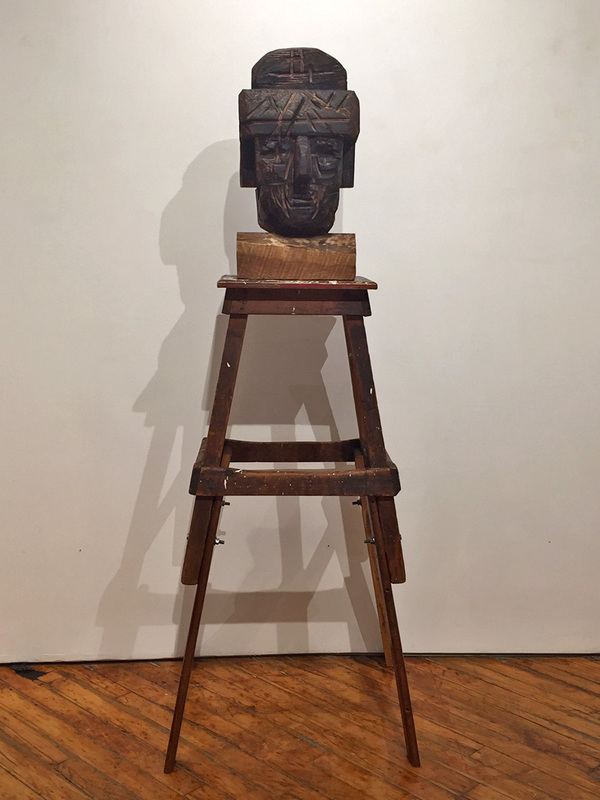 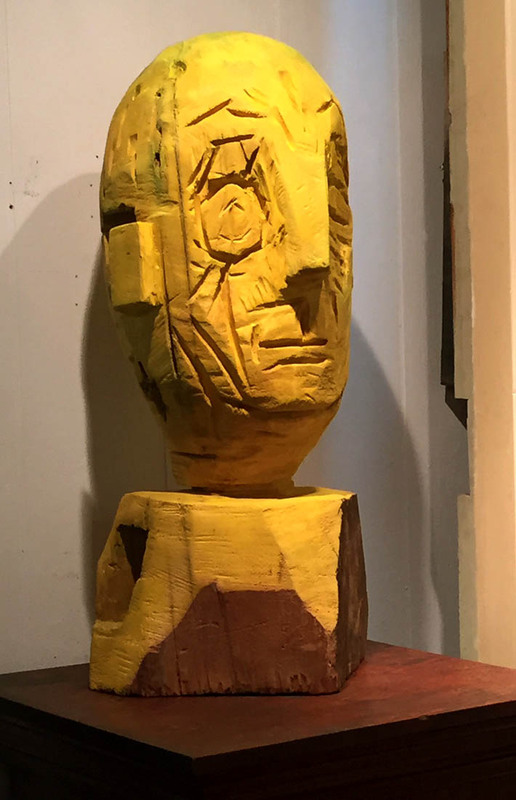 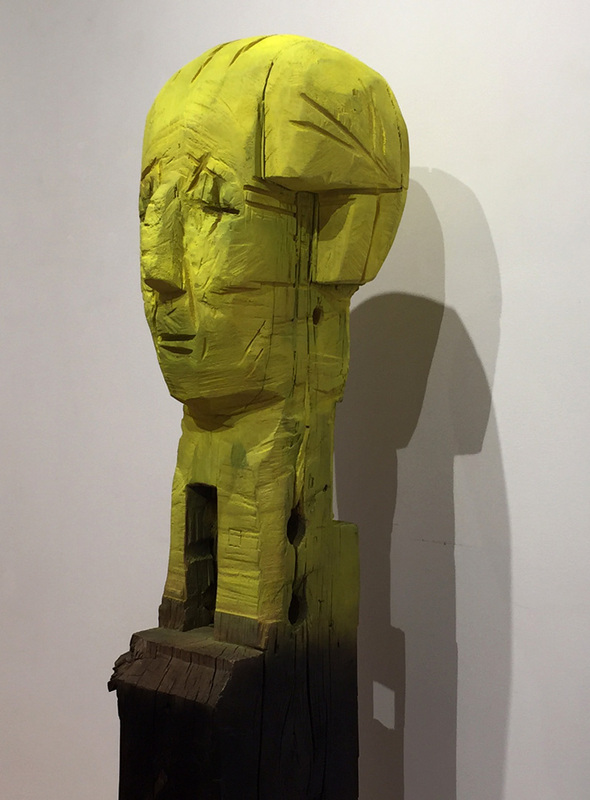 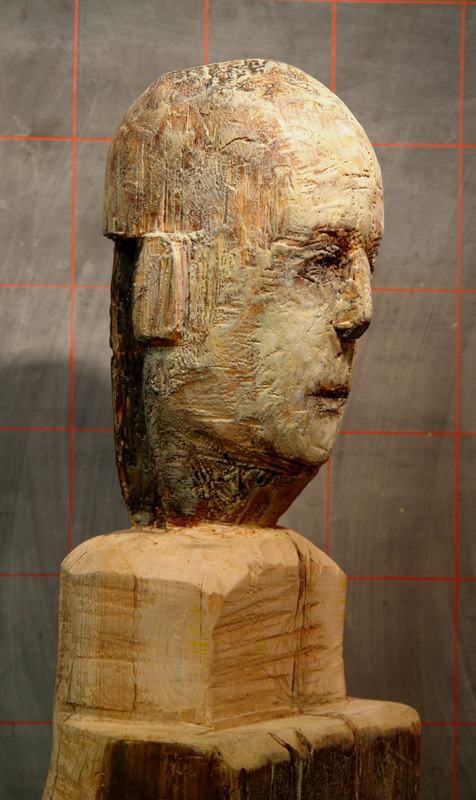 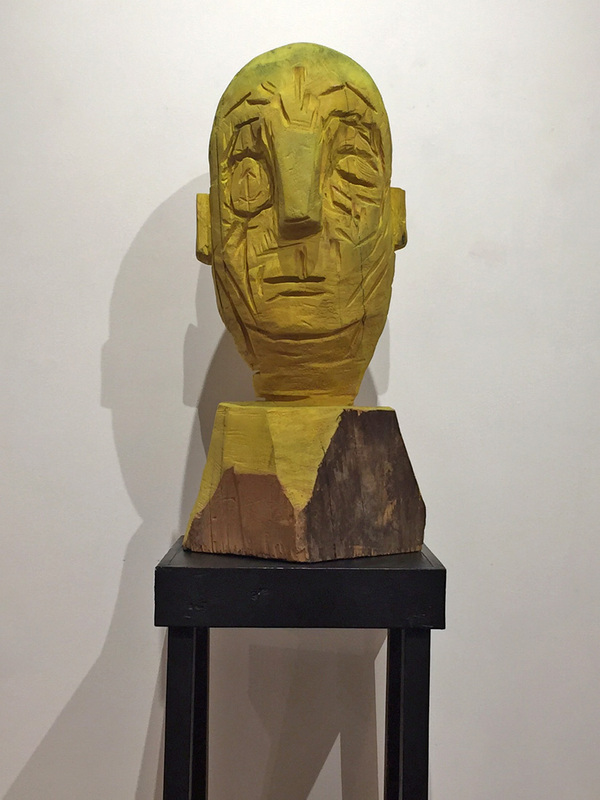 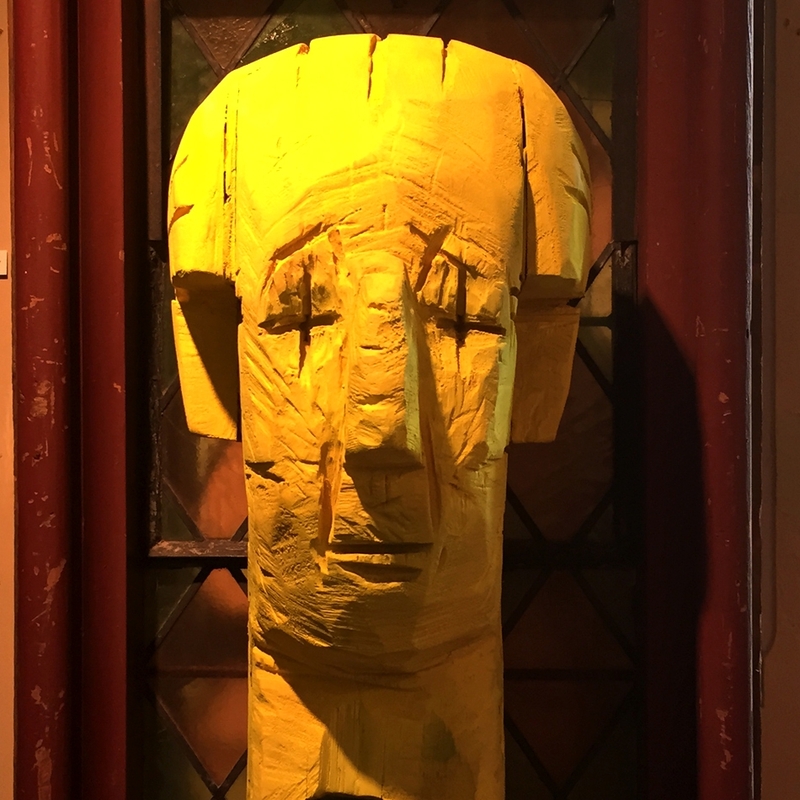 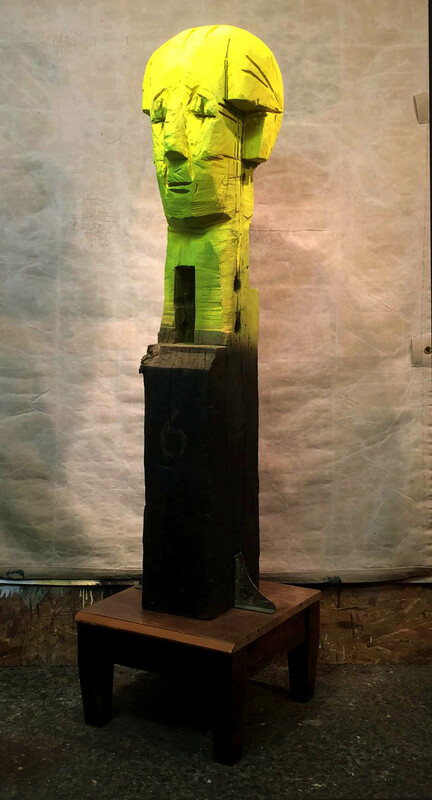 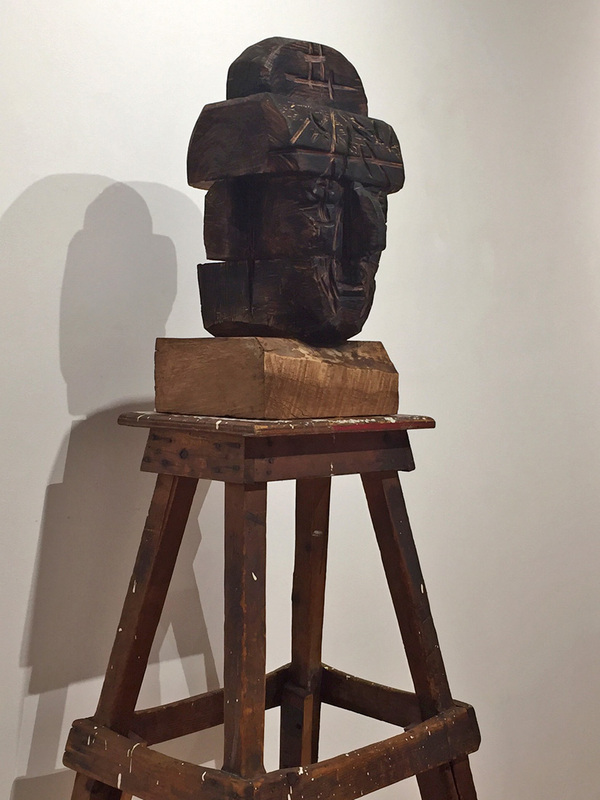 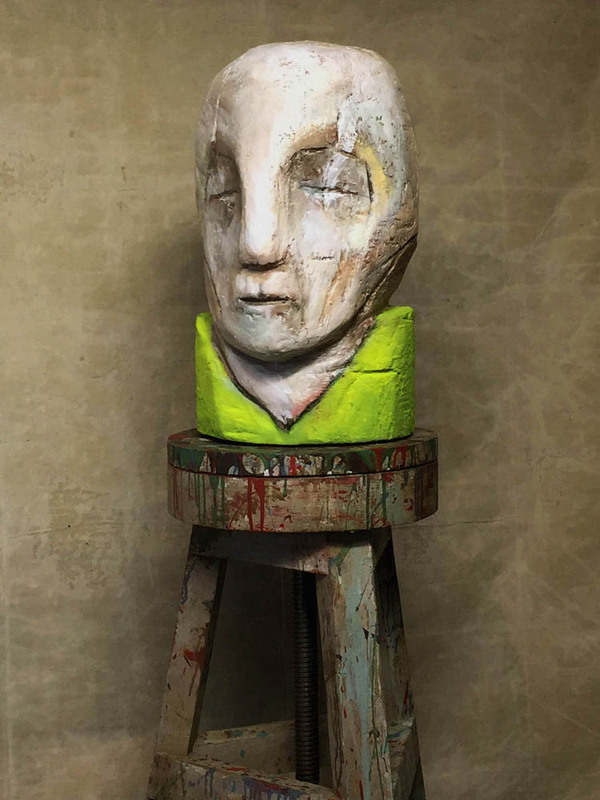 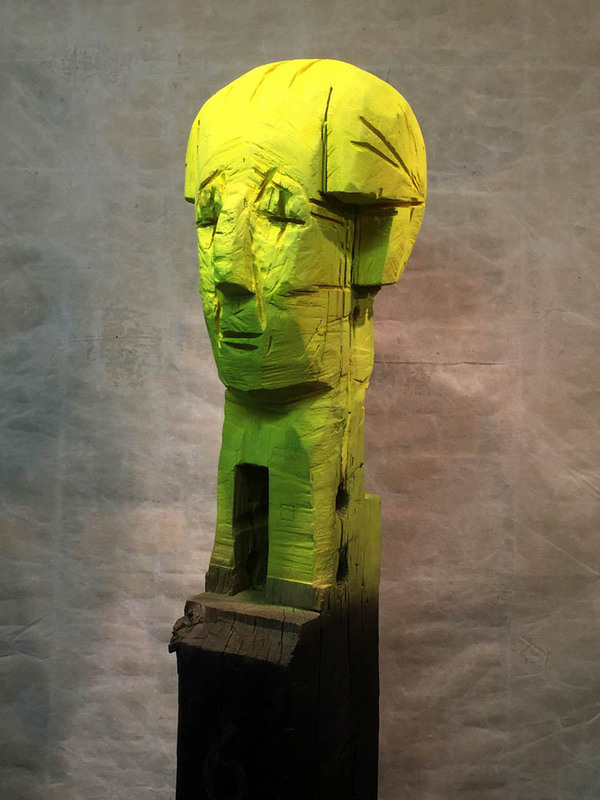 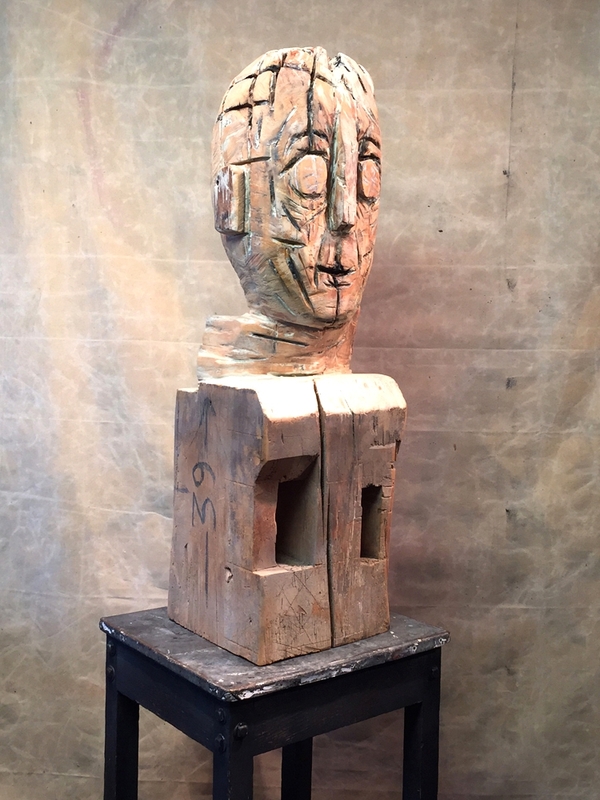 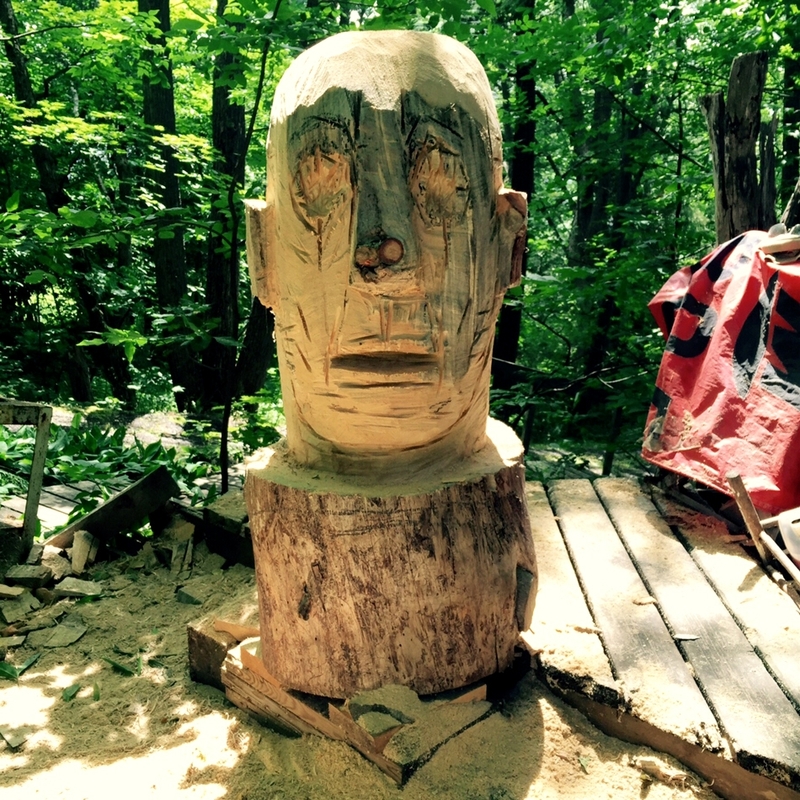 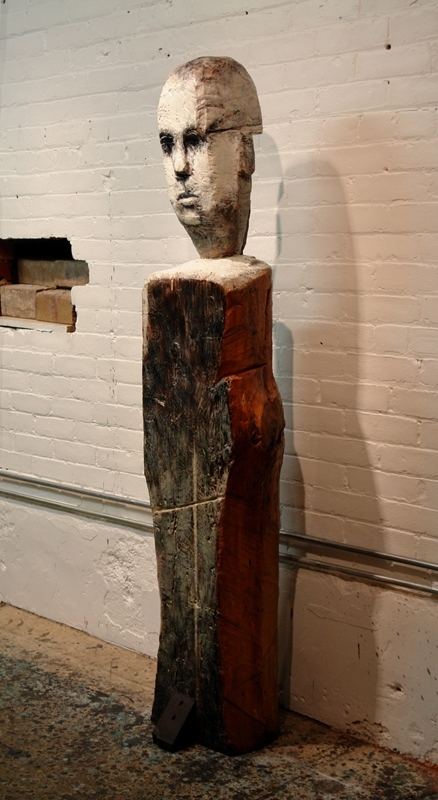 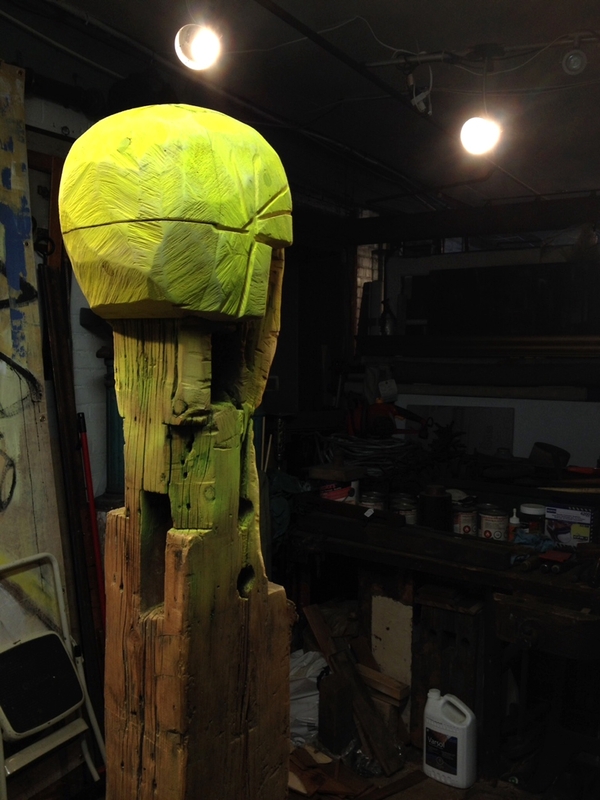 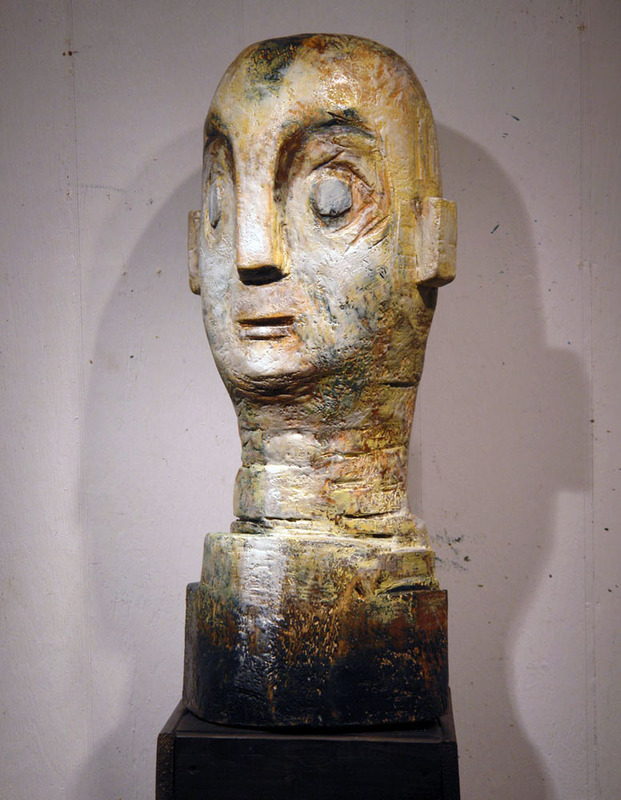 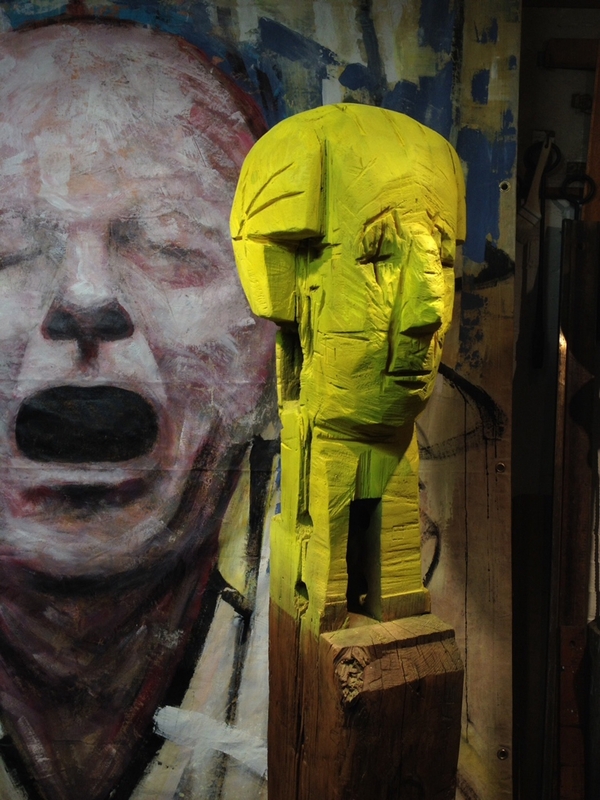 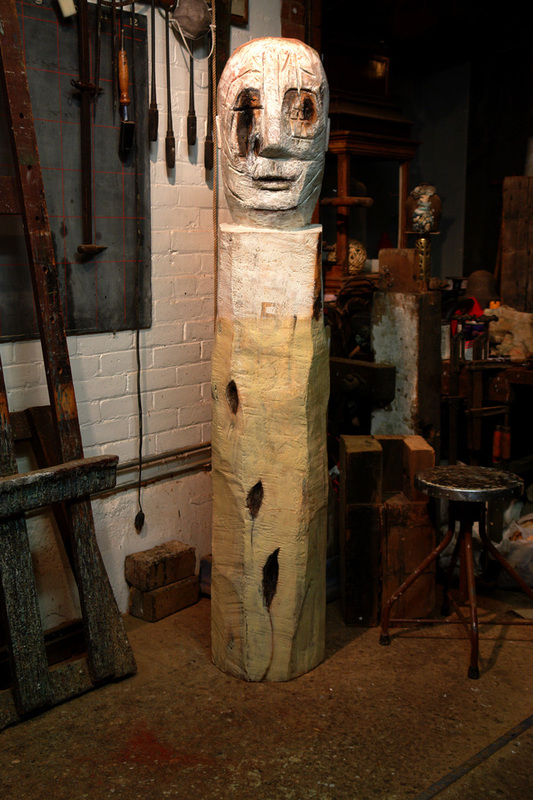 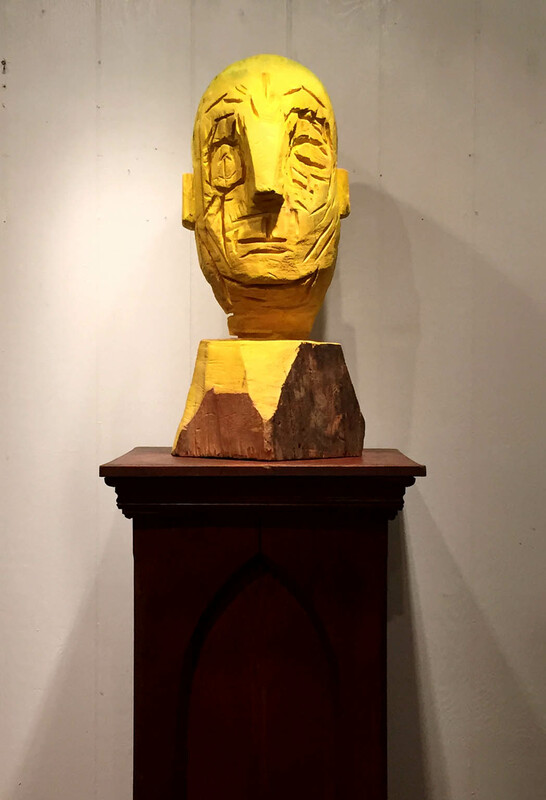 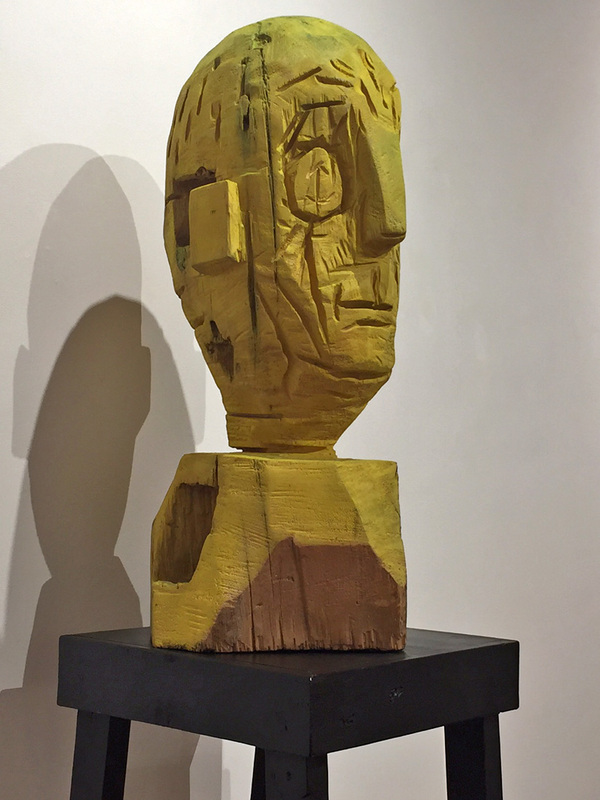 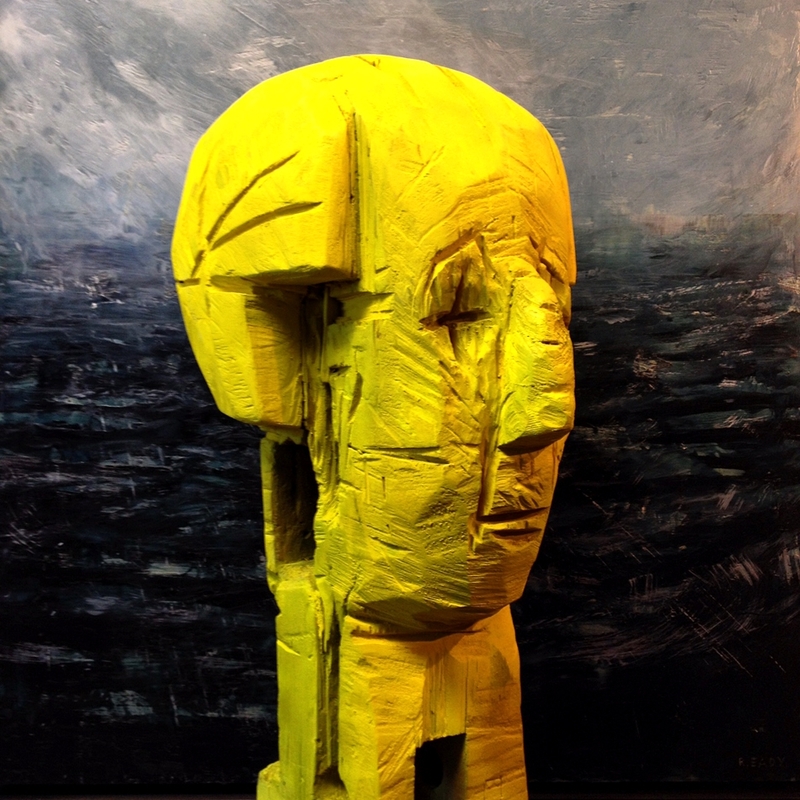 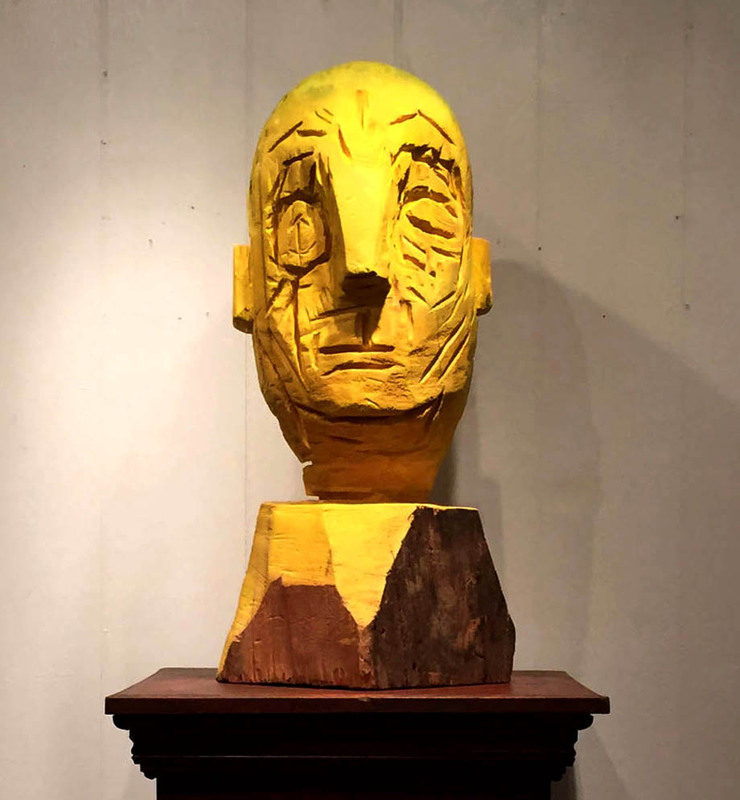 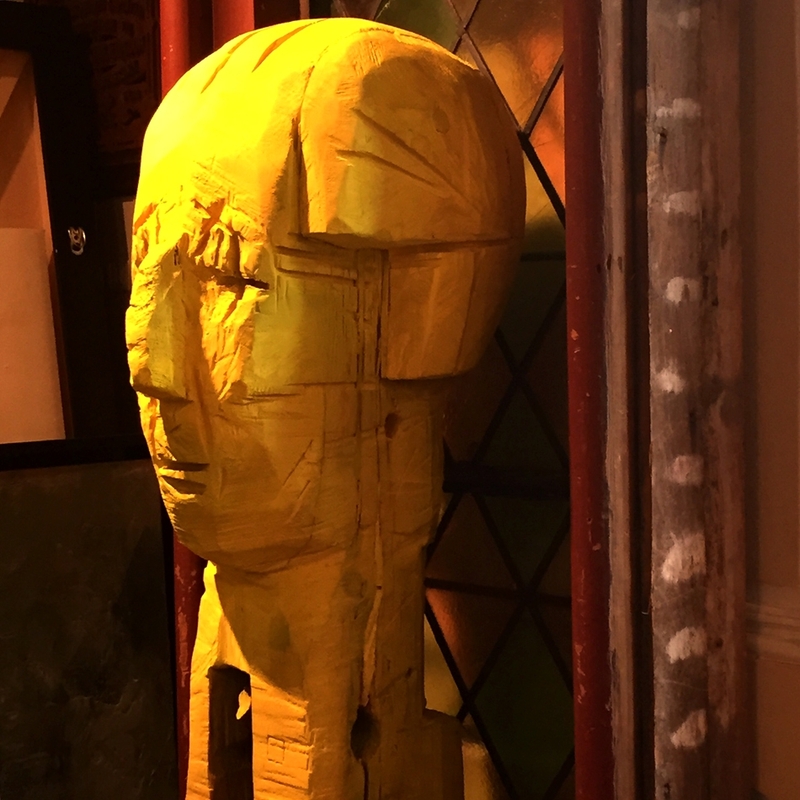 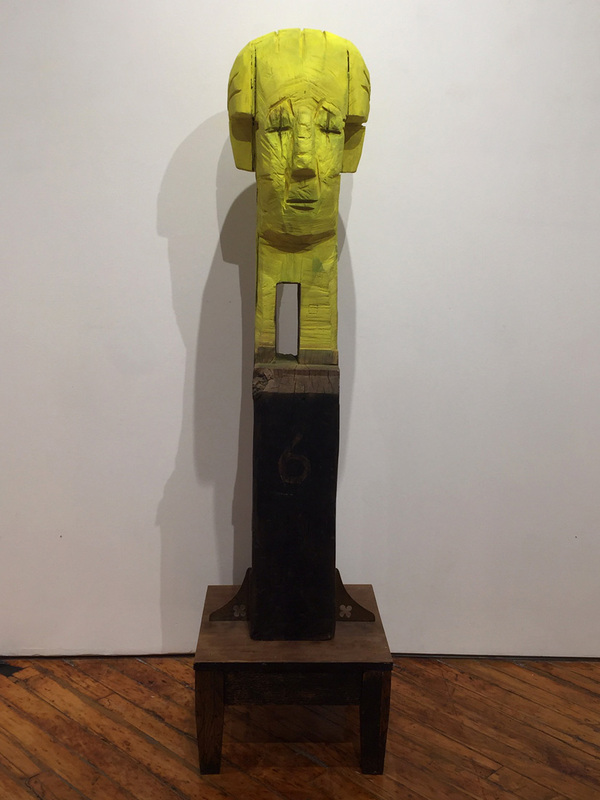 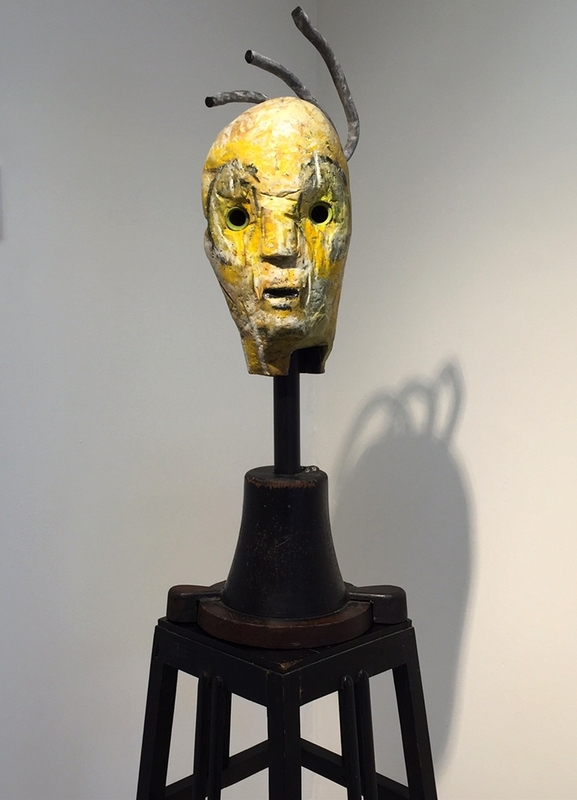 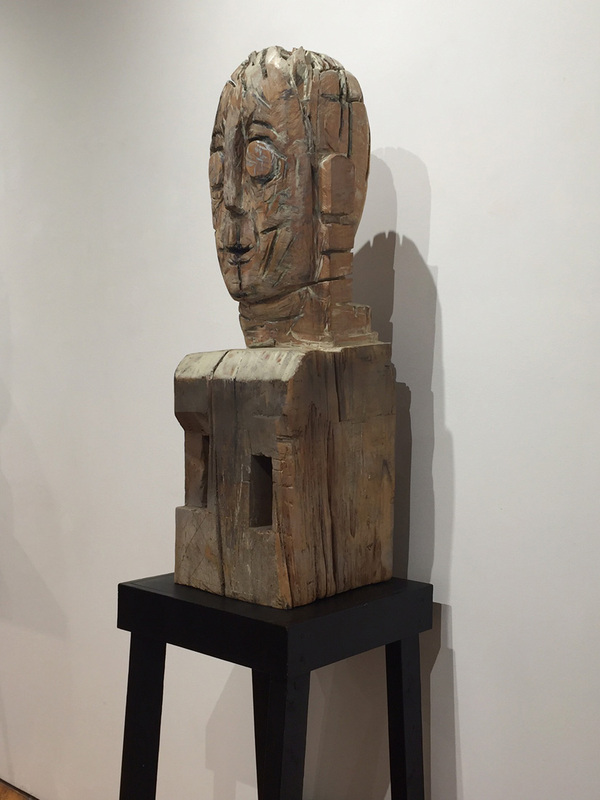 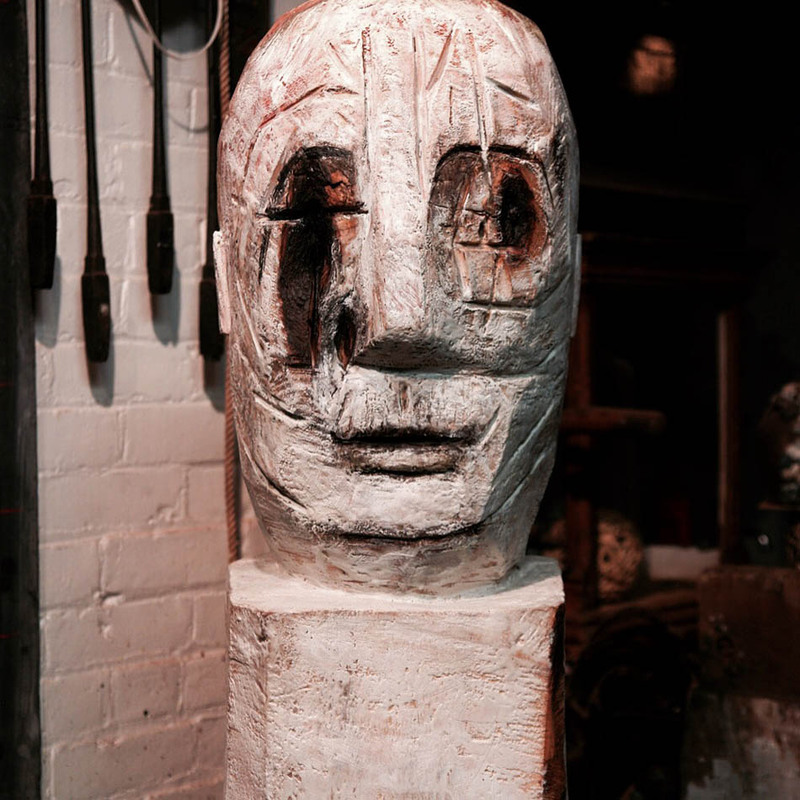 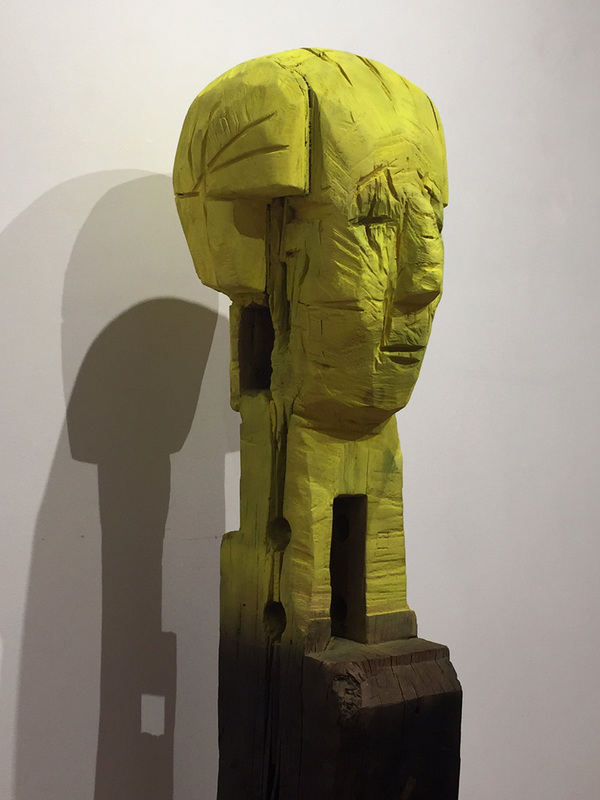 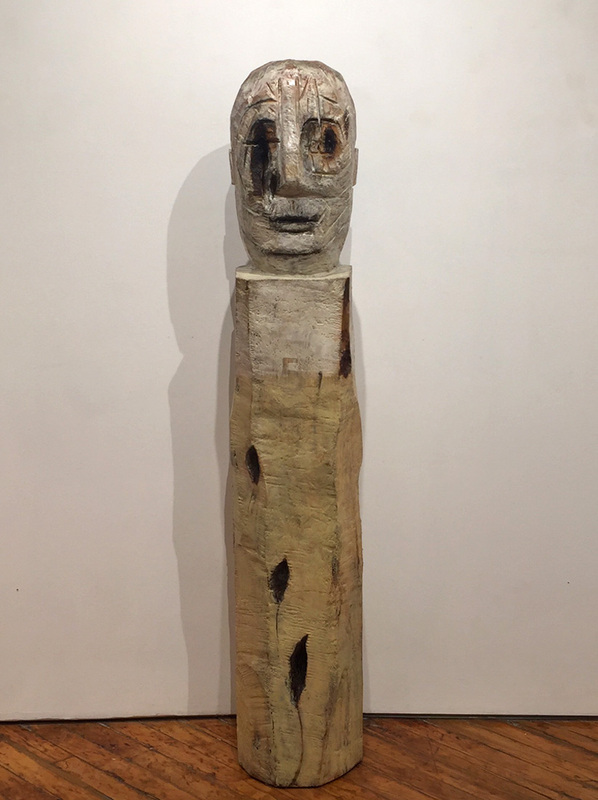 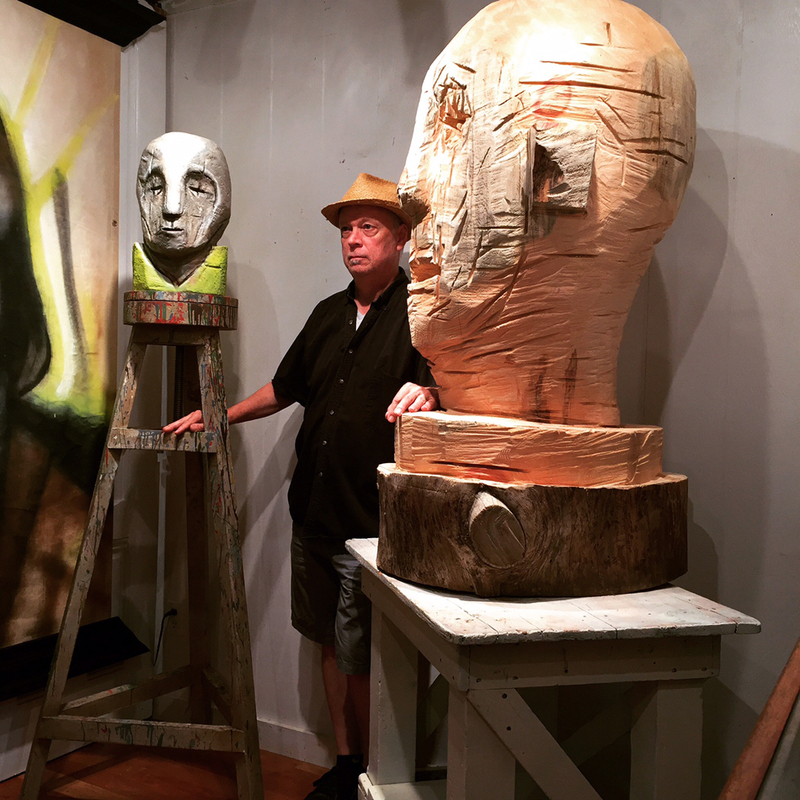 Guardian 6, 2015, carved wood, acrylic, spray paint, wood base, 72 x 11 x 12 in. 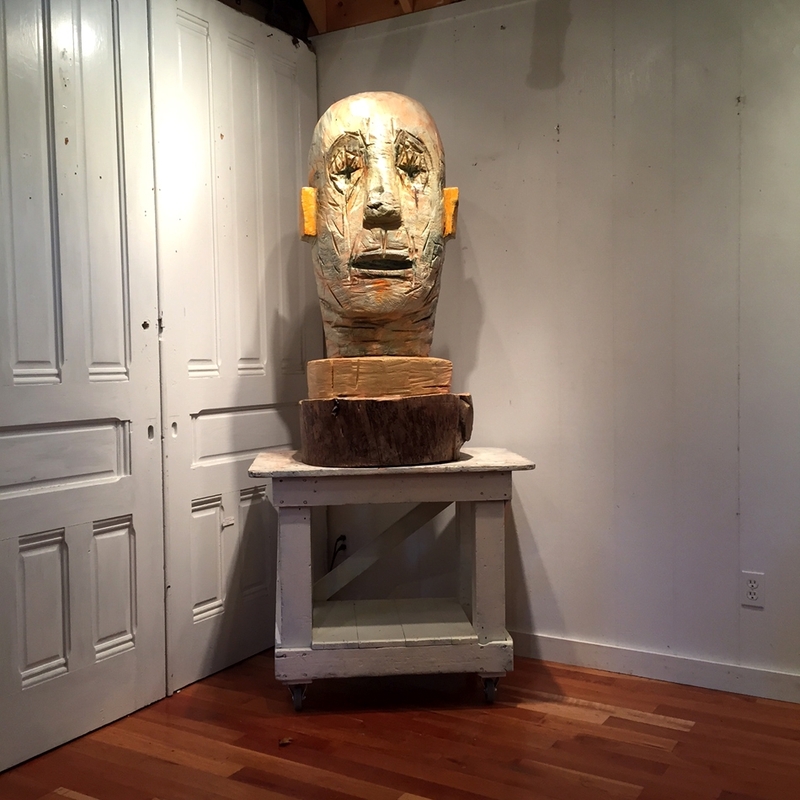 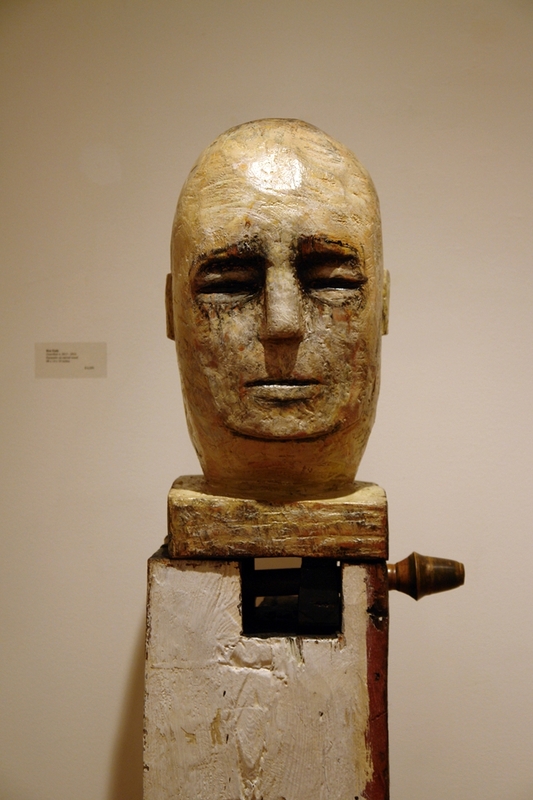 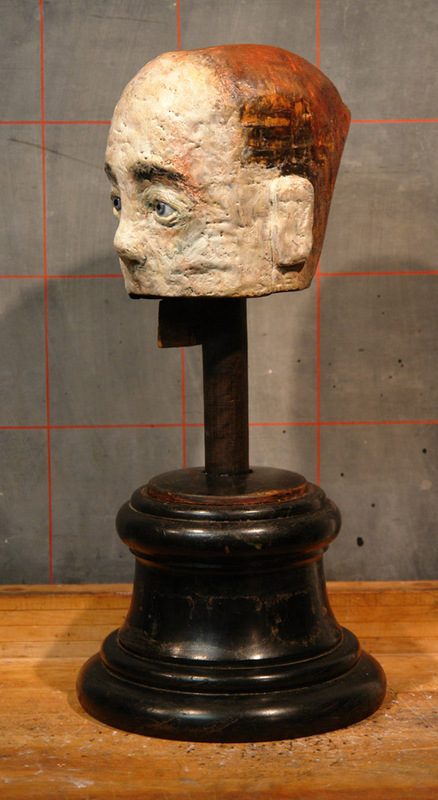 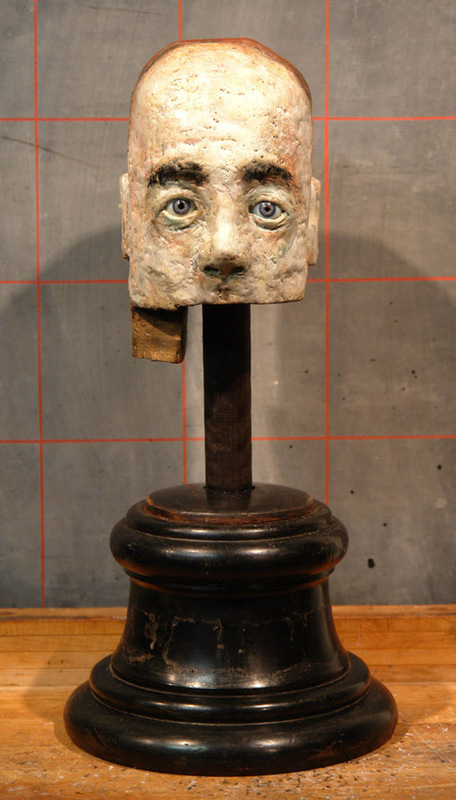 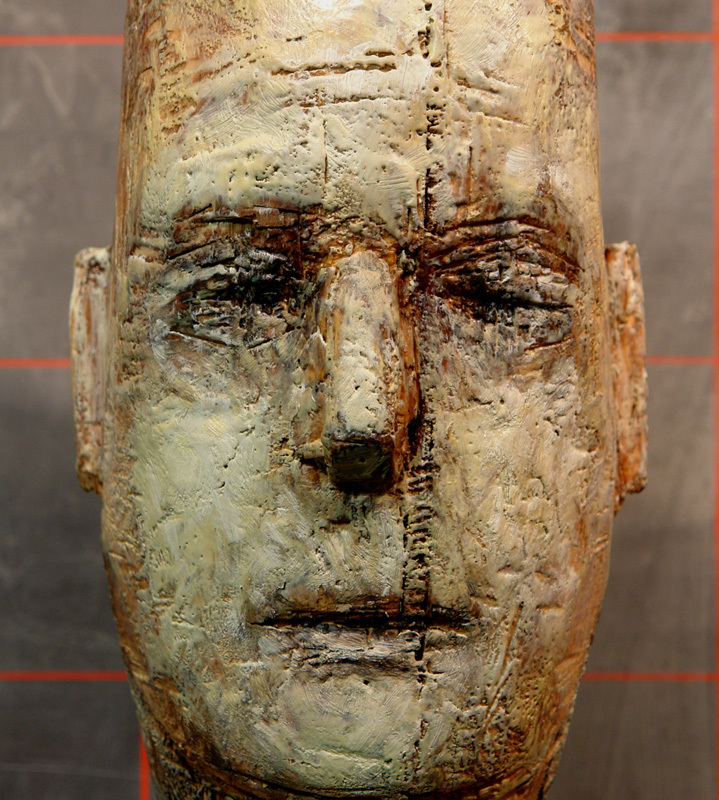 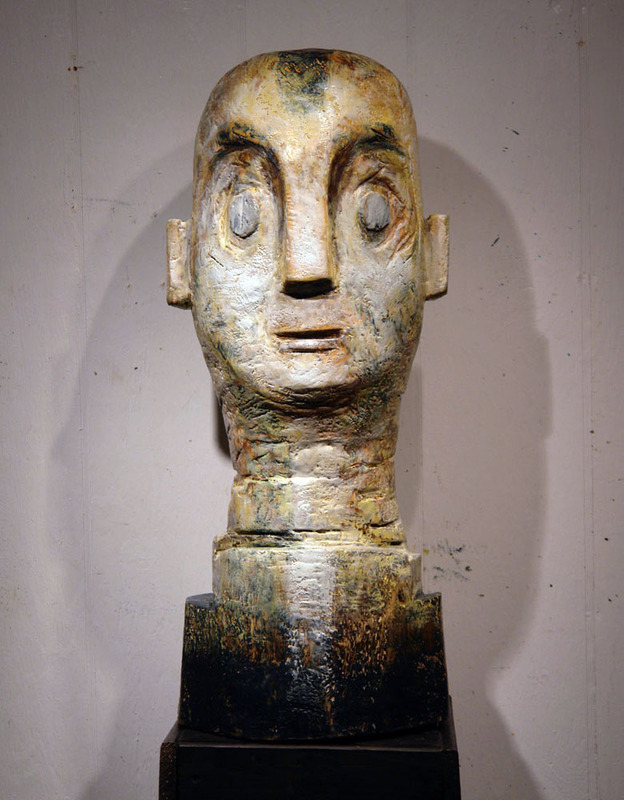 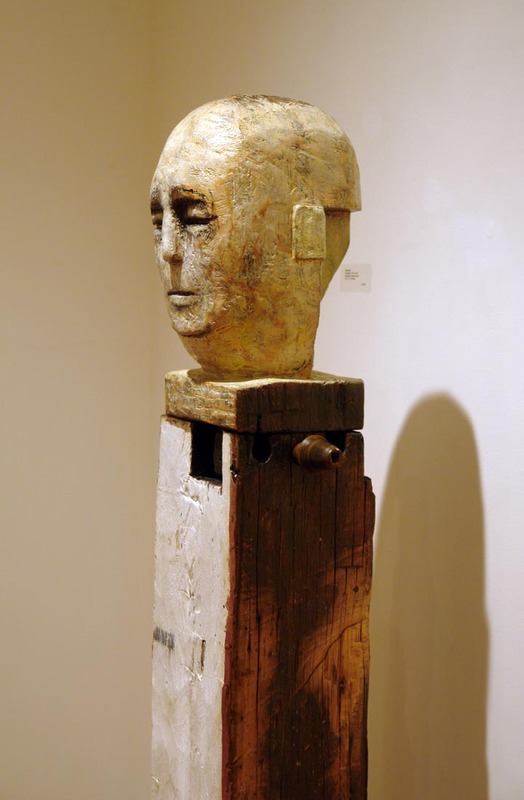 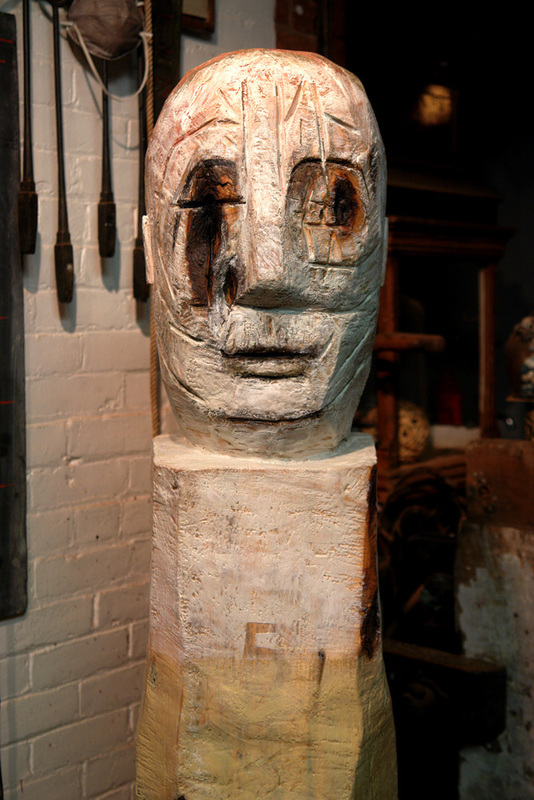 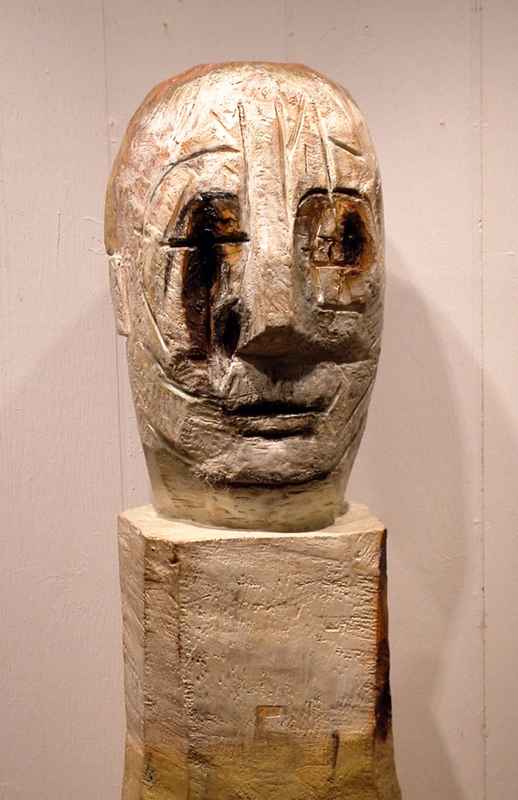 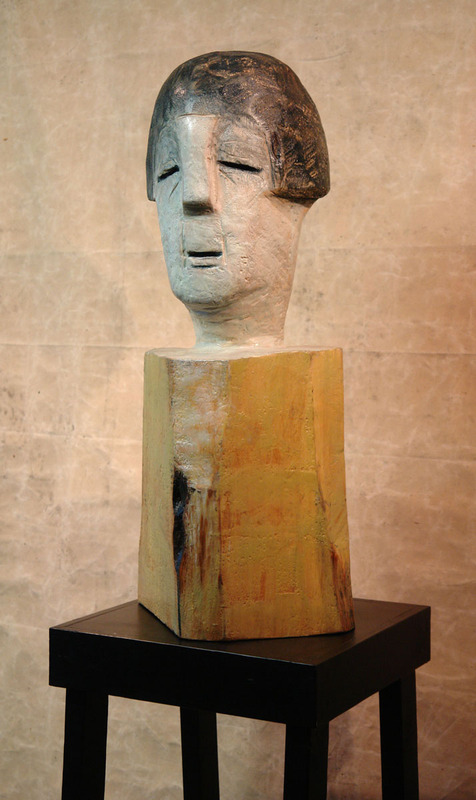 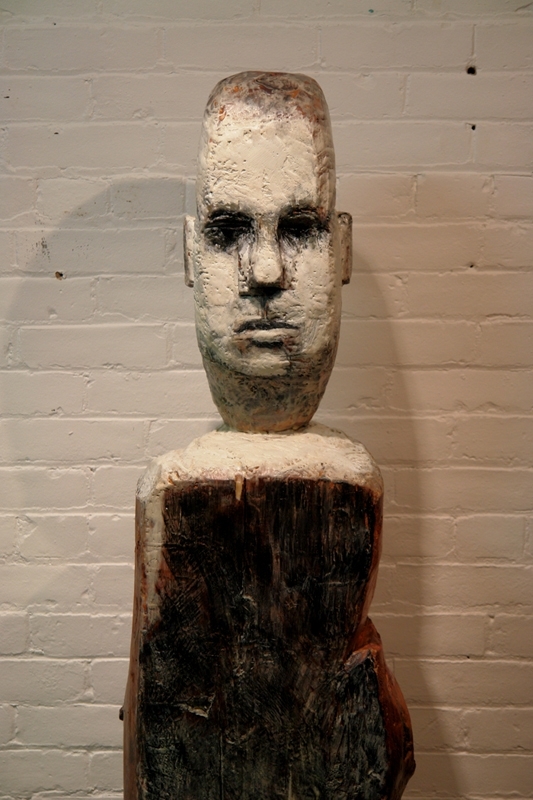 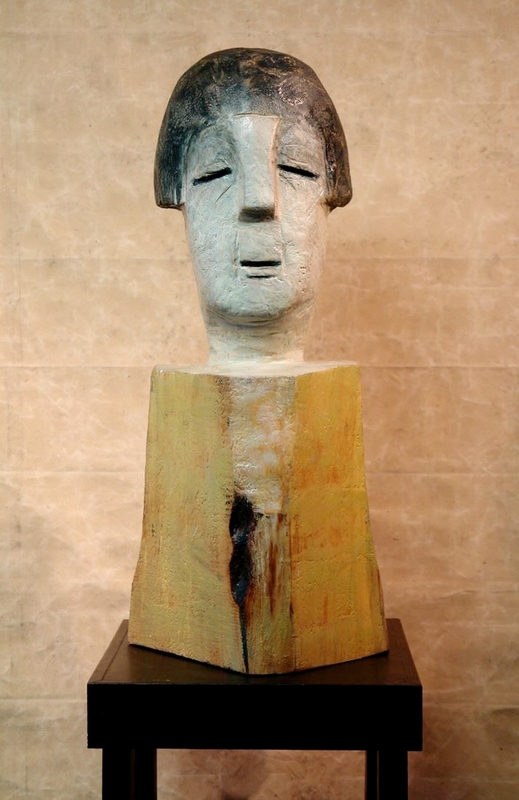 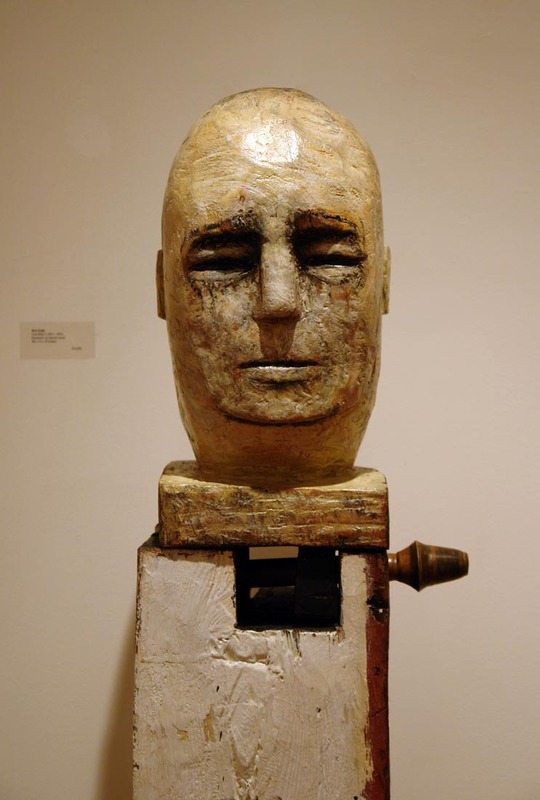 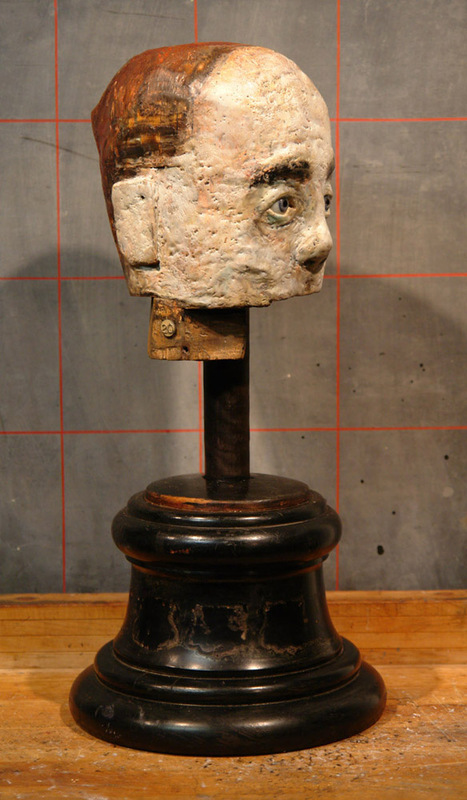 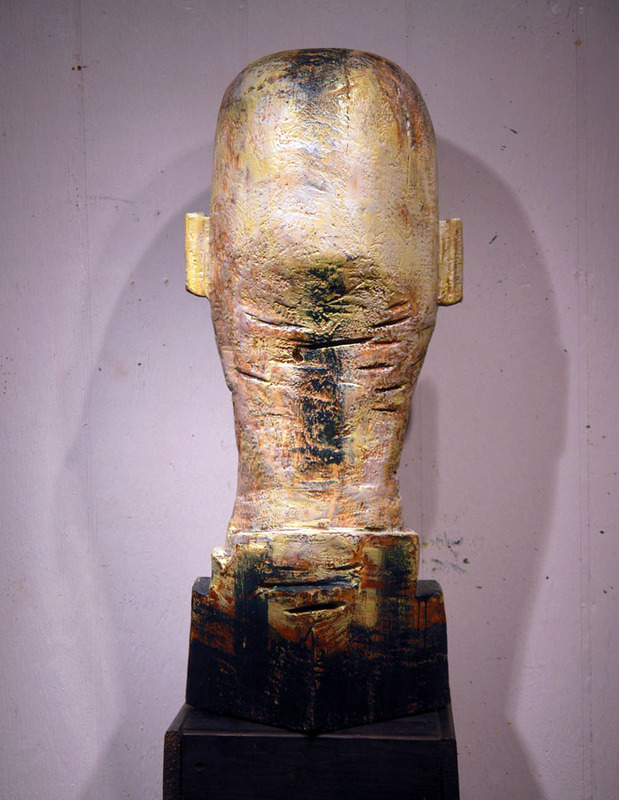 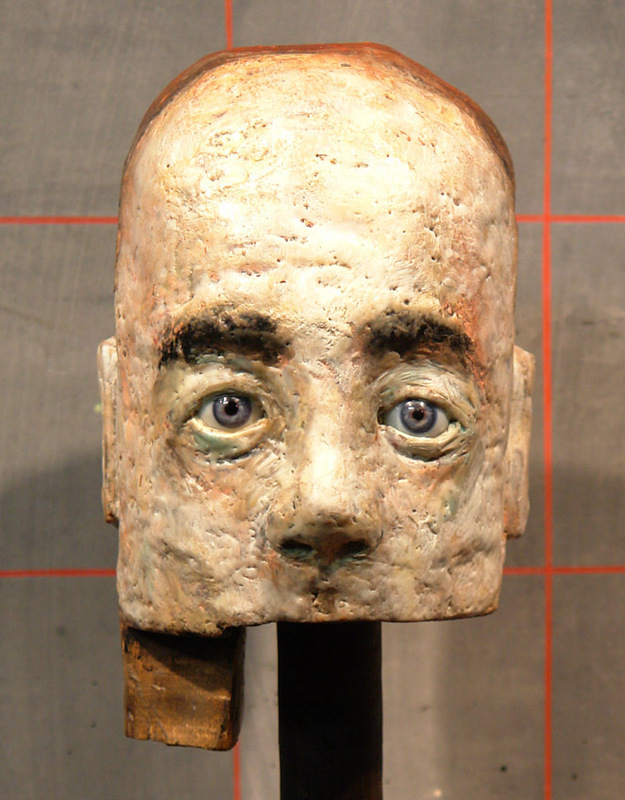 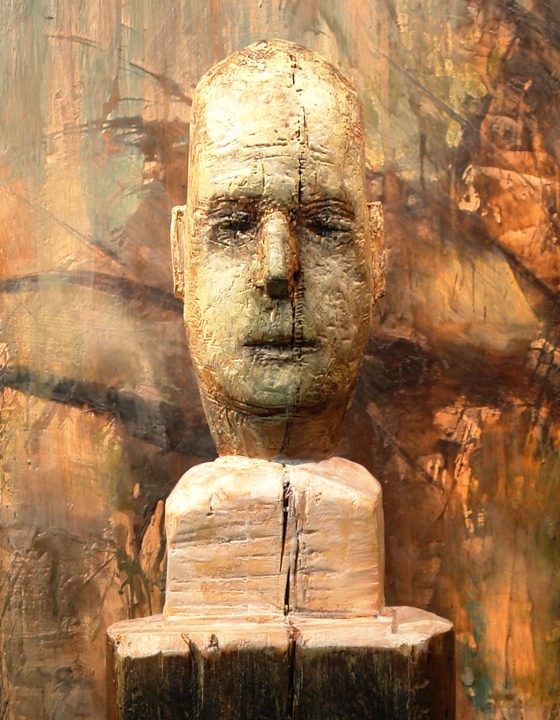 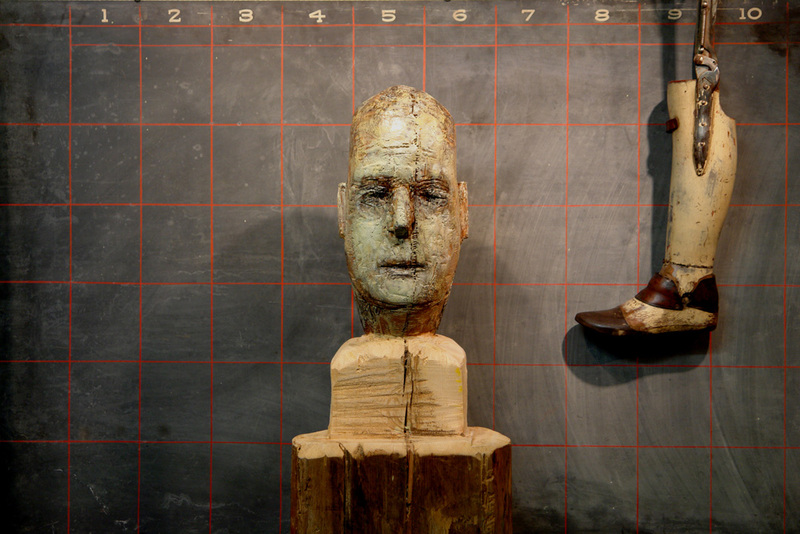 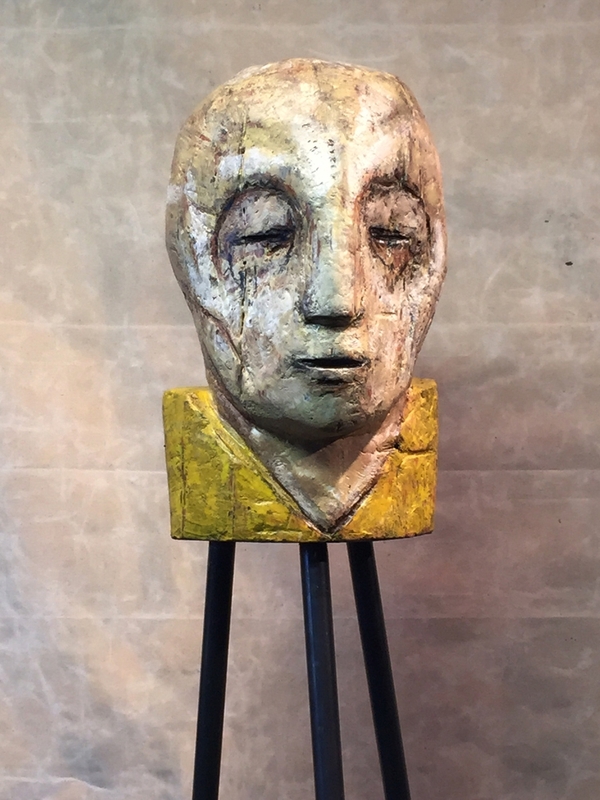 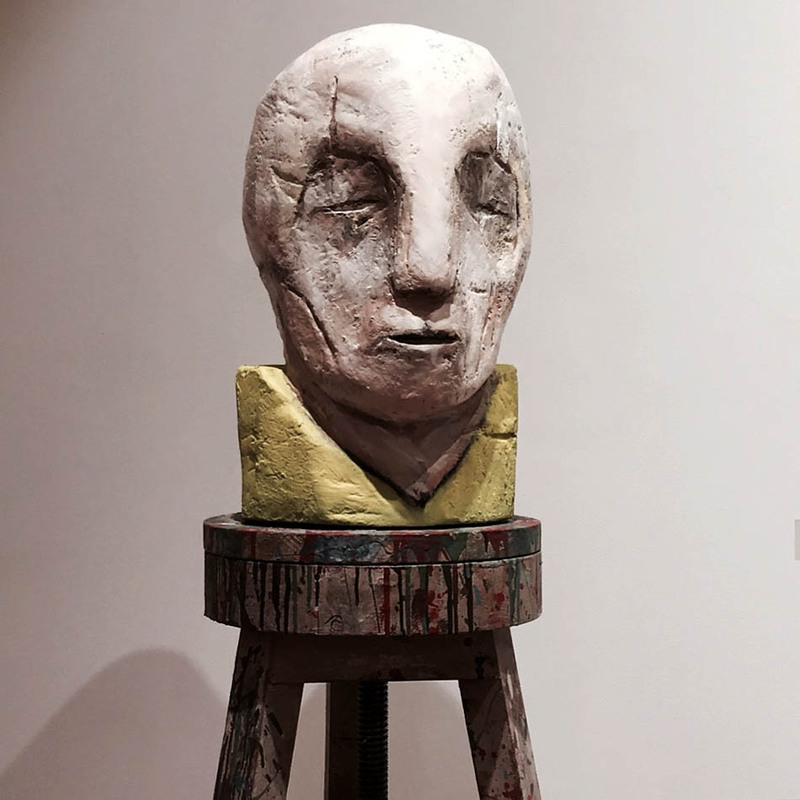 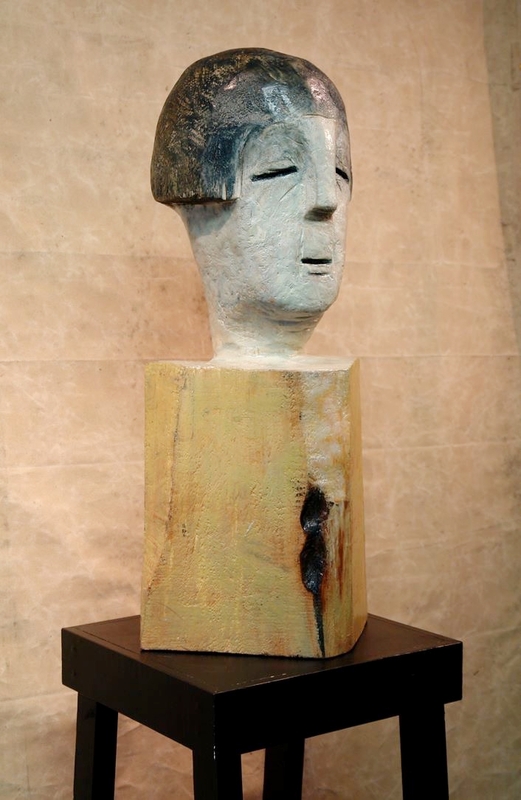 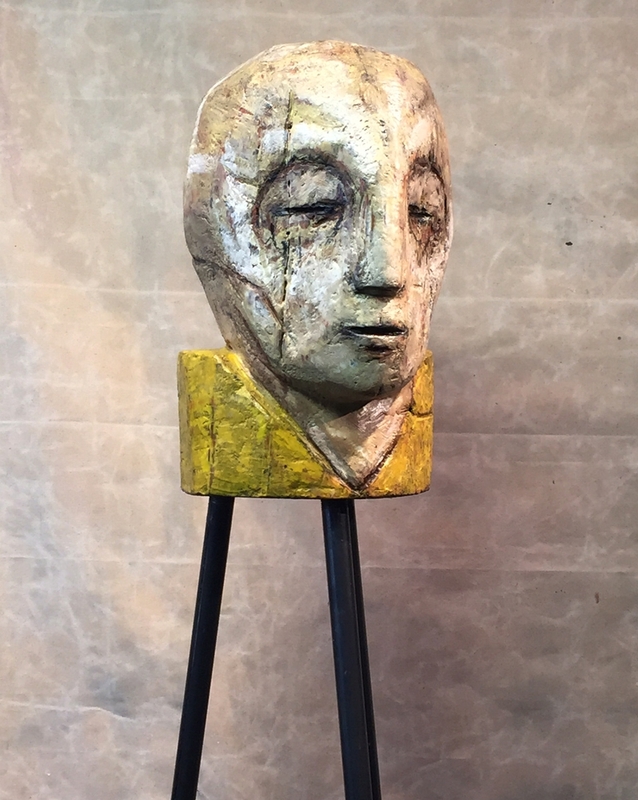 Chop, 2014, carved wood with encaustic, 34 x 17 x 15 in.